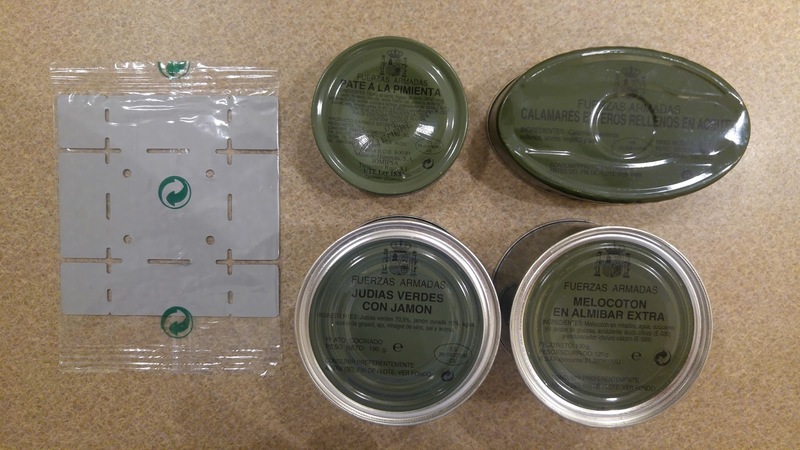 These rations come in a fairly simple, green plastic pouch and are relatively lightweight. 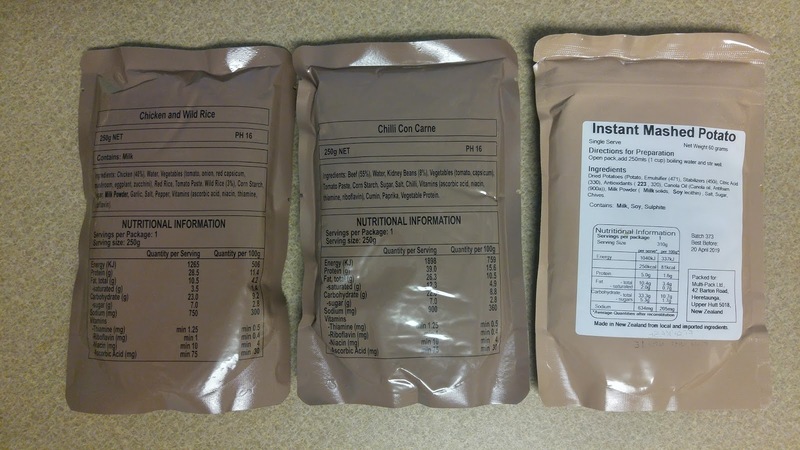 When it comes to meal choices for military rations, there are three main meat staples: Beef, chicken and pork. 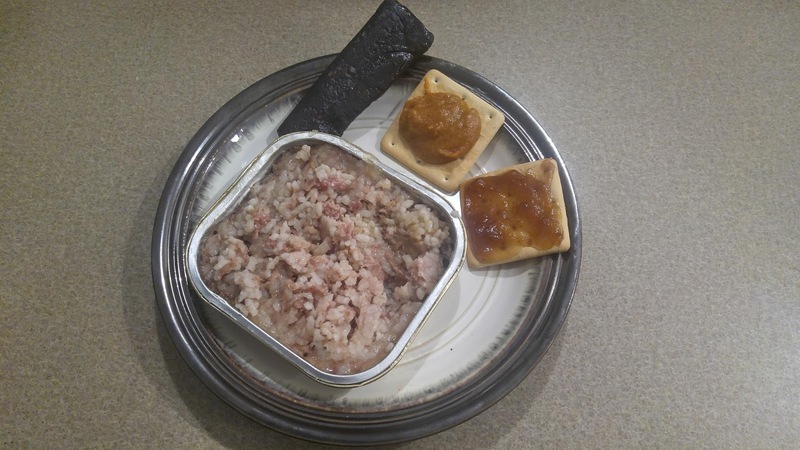 THIS is the flameless ration heater. It works by activating several pouches of a mixture of magnesium, iron and table salt with water, producing an exothermic reaction. 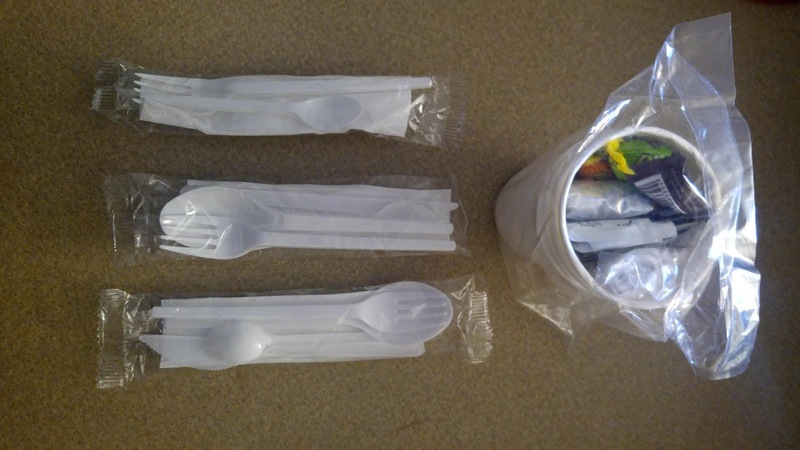 Simply slide the meal pouches in, add water, and wait. 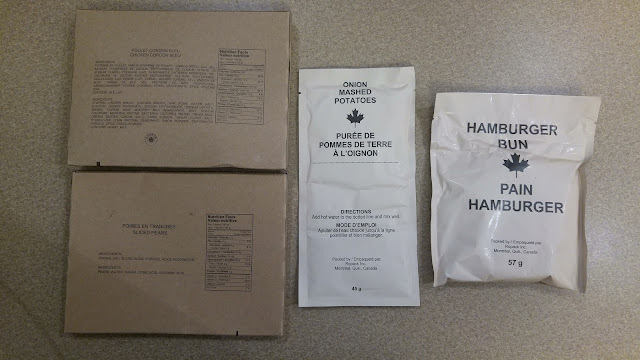 A standard US flameless ration heater uses one sheet of FRH pouches for heating a meal. 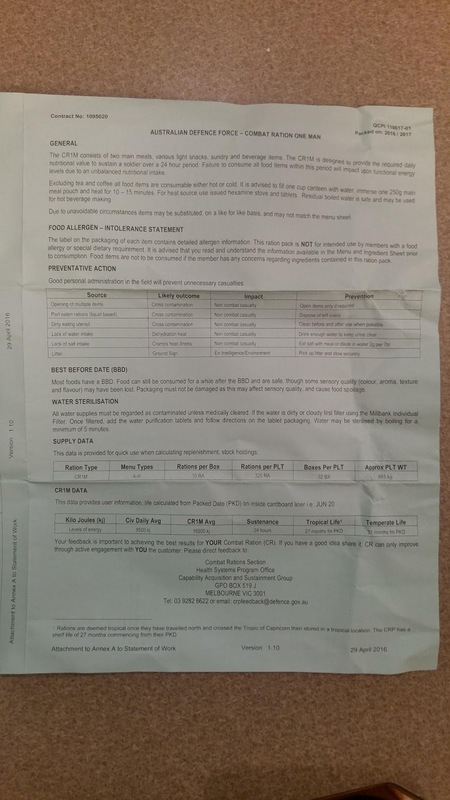 However, the Chinese FRH has TWO sheets included! 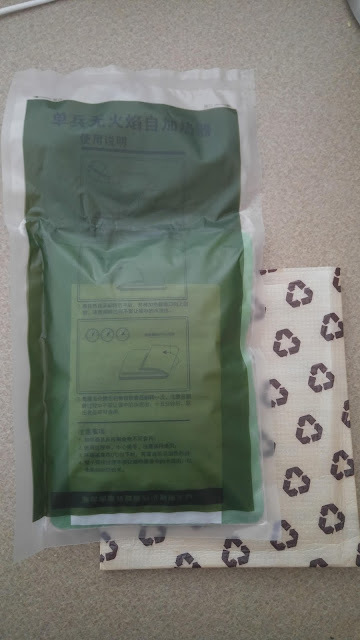 The styrofoam sleeve (pictured above) is very necessary for safe handling, since this FRH gets VERY hot! 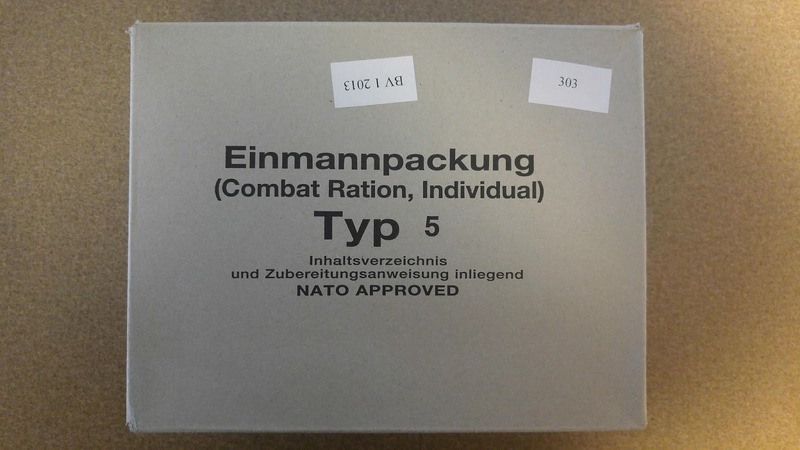 After German reunification, the military began to phase out their stockpiles of the original Types 1 through 4, but they were revived when Germany began to participate in UN peacekeeping duties. 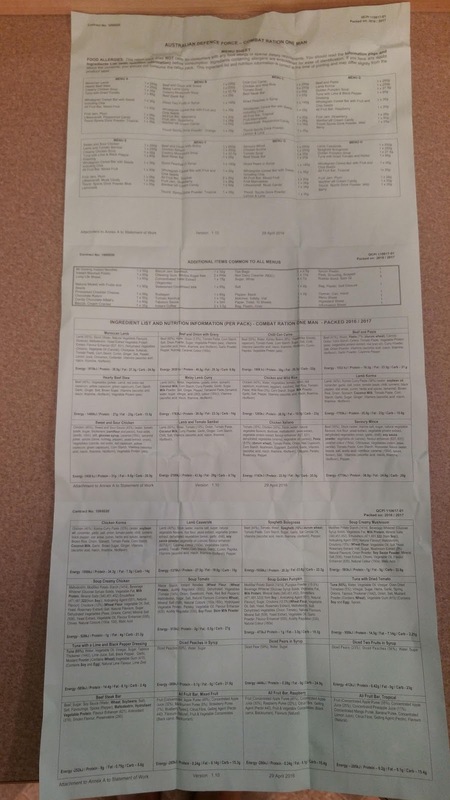 There are currently 12 Types of EPA. 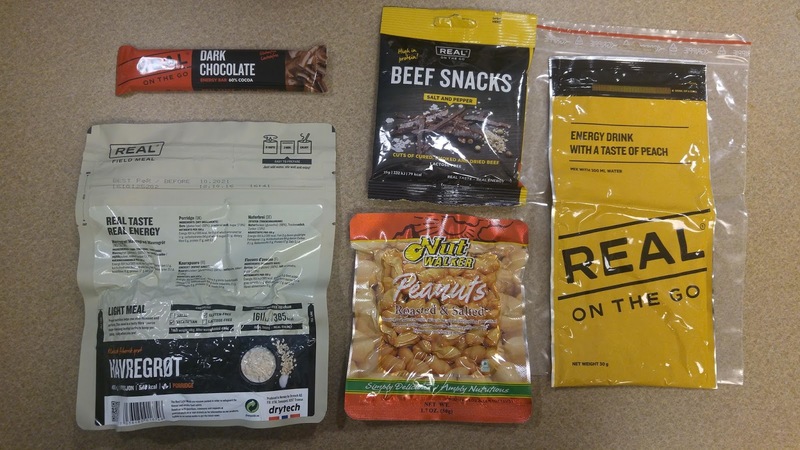 The EPA is a 24 hour ration, containing ample supplies for Breakfast, Lunch and Dinner. 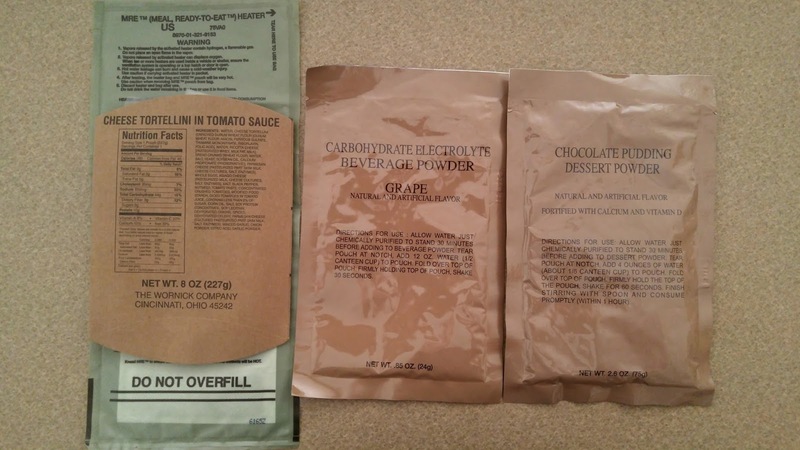 As pictured above, the ration comes fully packed - more than enough to keep an active soldier well-fed! 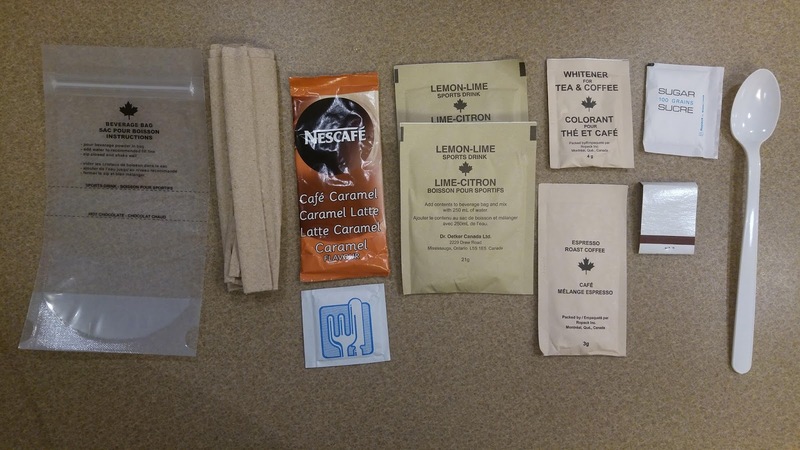 Here are just the beverage options! 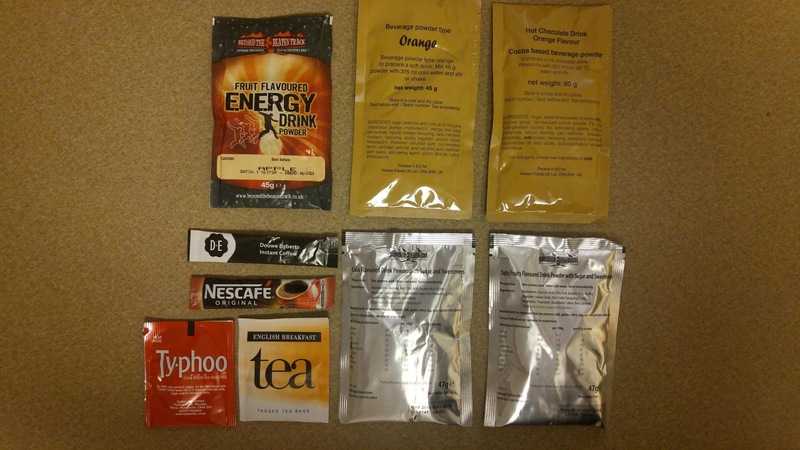 Four packs of different cold drinks, plus two coffee and tea, and four packs of creamer. 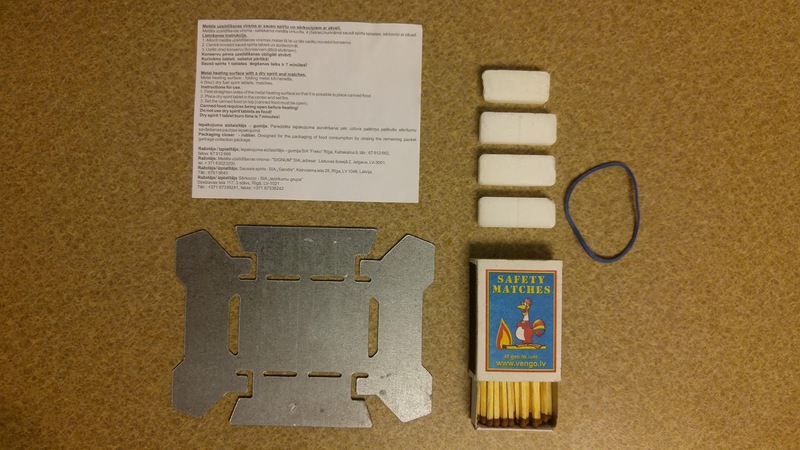 Matches are common accessories in military rations, and invariably fall into two categories: a book of cardboard matches, or a small box of loose wooden matches. The Germans considered their options and said, NEIN! We shall... be different! 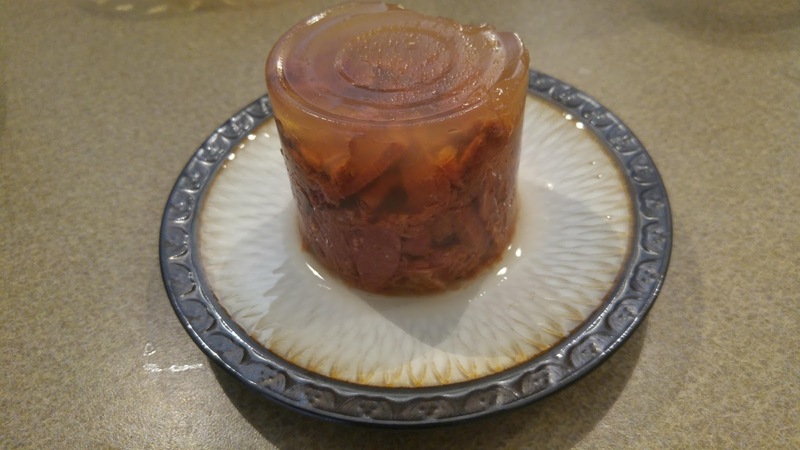 Behold! 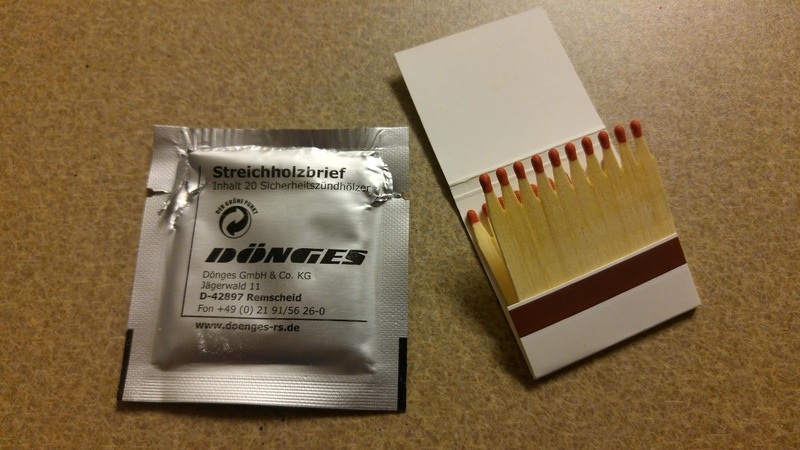 A book... of wooden matches. 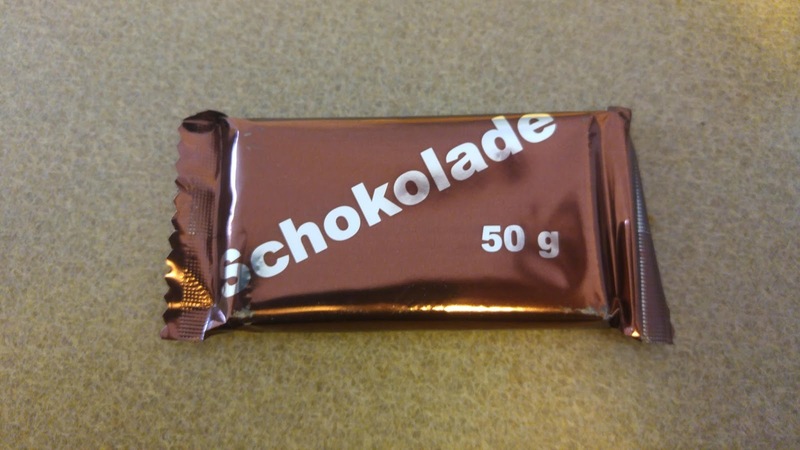 And of course, a nice bar of plain chocolate. 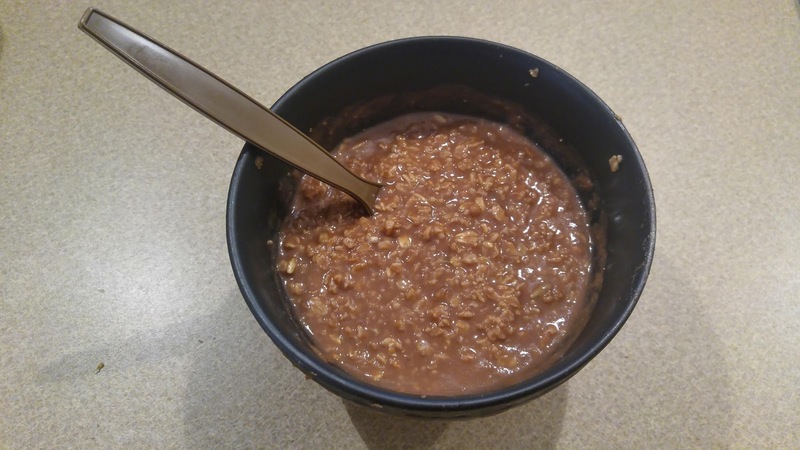 The chocolate muesli is a simple, but yummy way to start the day. 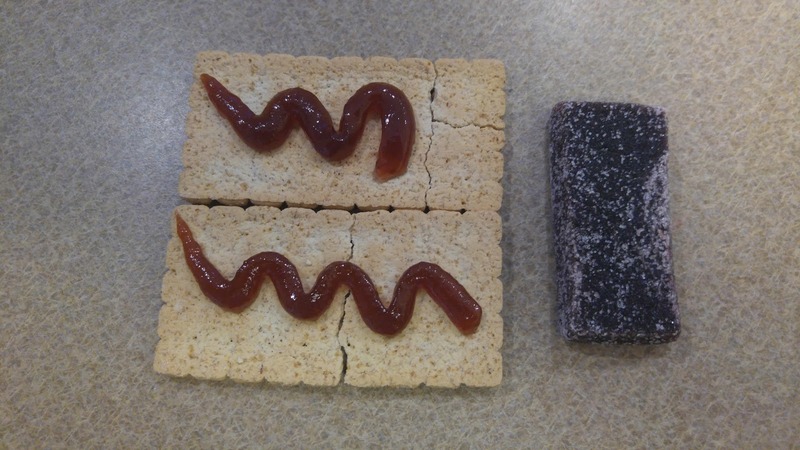 Black currant jam and cheese spread. 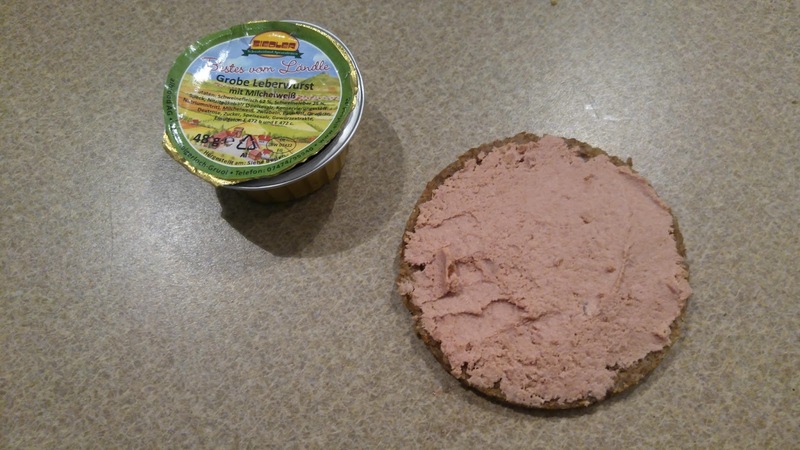 Liverwurst on rye grist bread. 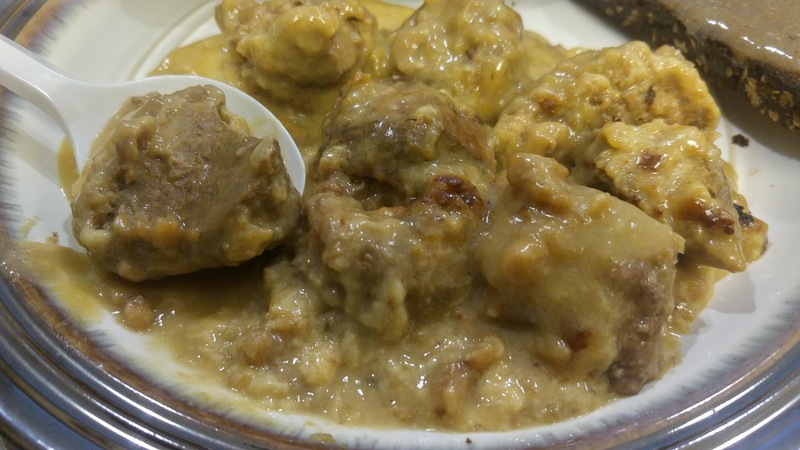 Noodles in cream sauce with meatballs. 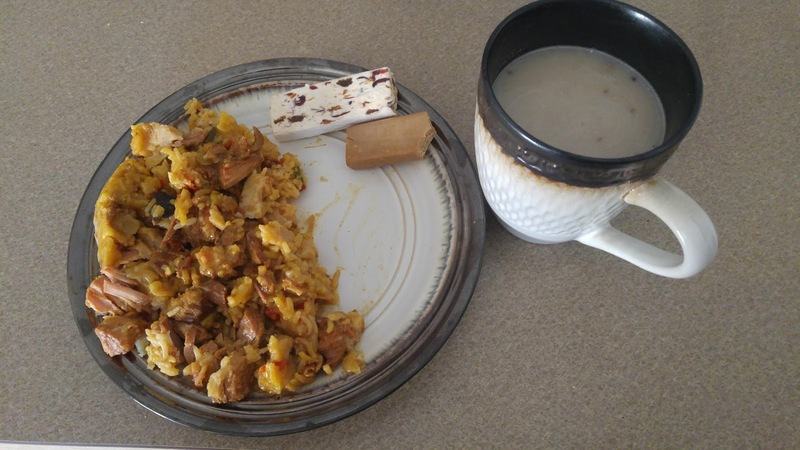 Risotto with ground beef and pork. 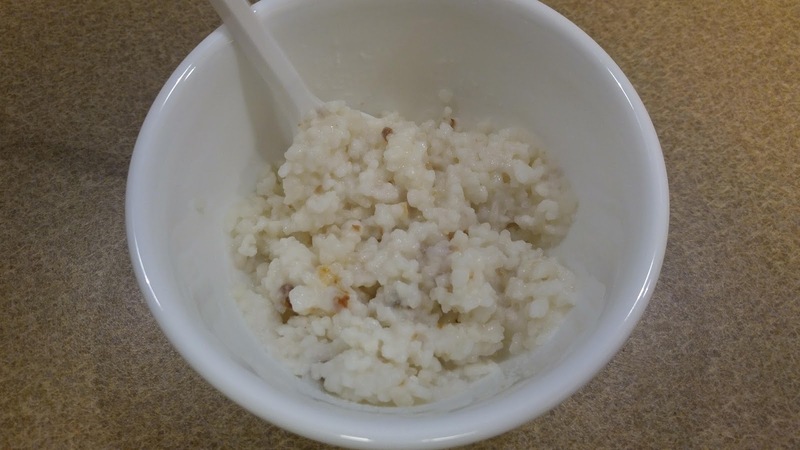 And for dessert, the rice pudding. 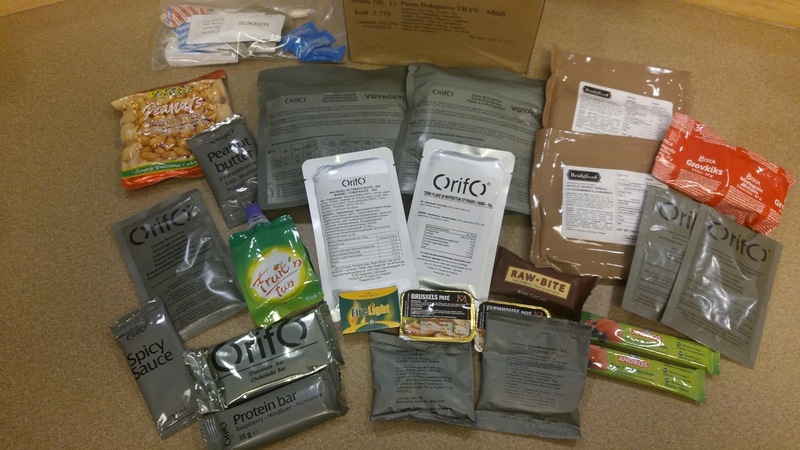 Military Issue 24-hour Combat Ration pack, type S-RG. 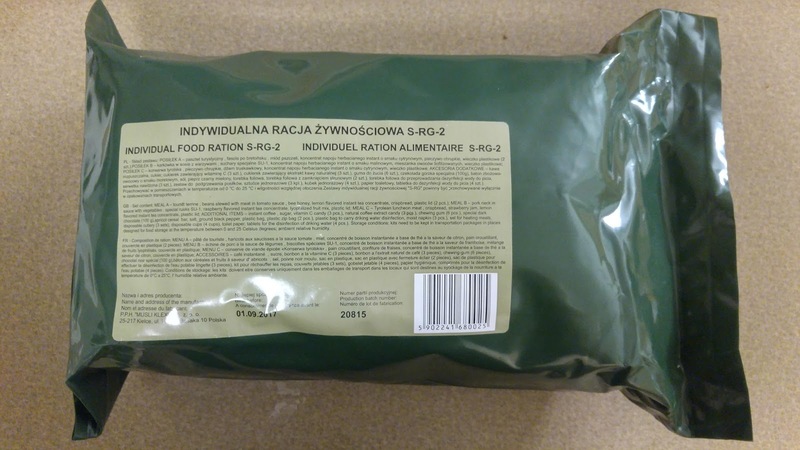 This ration is produced by ARPOL for the Polish military, and contains a combination of military-specific and civilian-origin items. 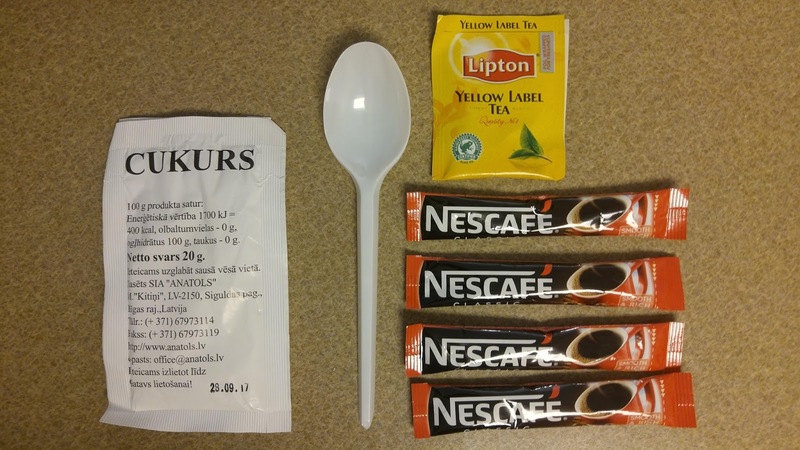 This ration is special for a few reasons. 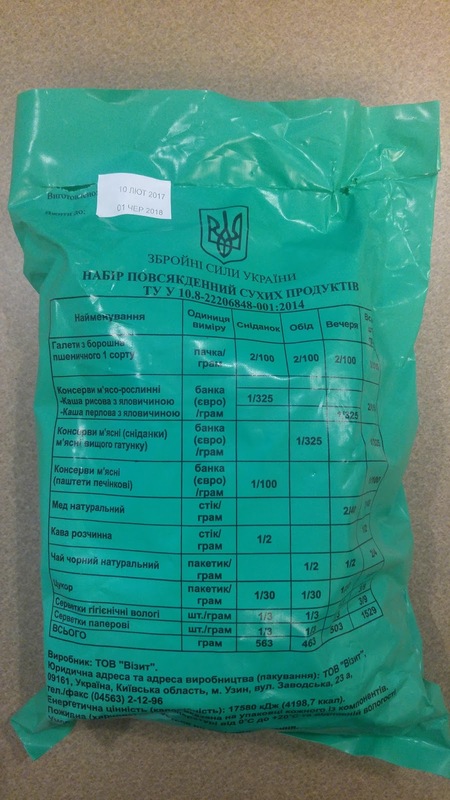 First, it is BIG - one of the largest and heaviest of all the rations , rivaled only by Russia. 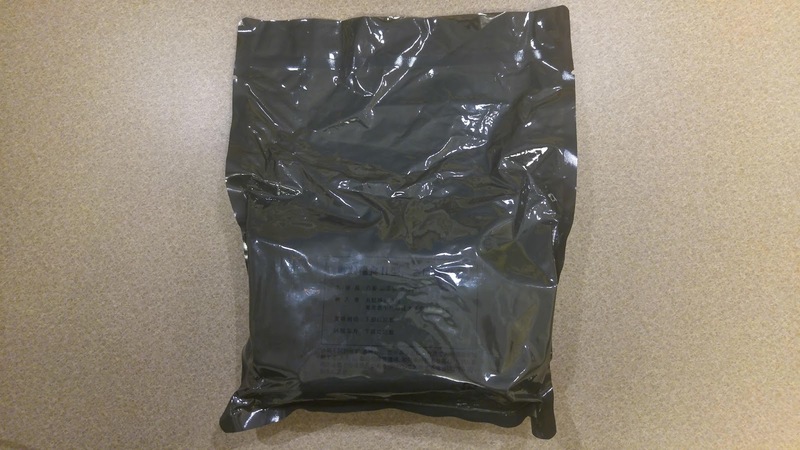 It comes in a heavy duty olive green plastic bag, and it is TOUGH. 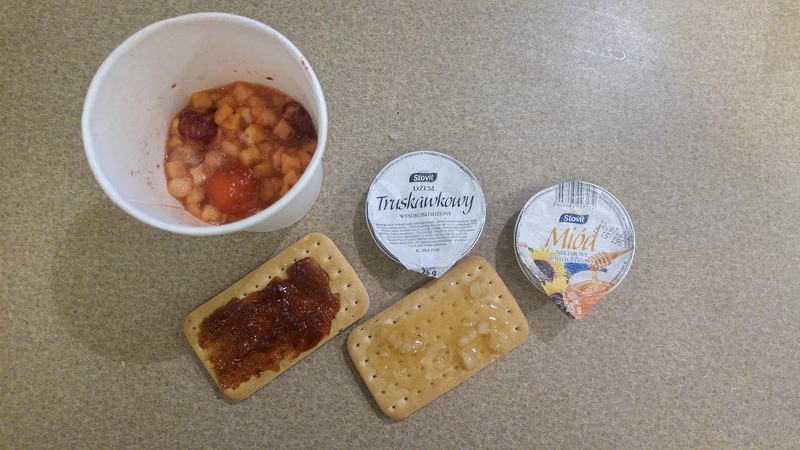 First, we have some light fare for breakfast - hardtack crackers with honey and jam, and an apricot cereal bar. 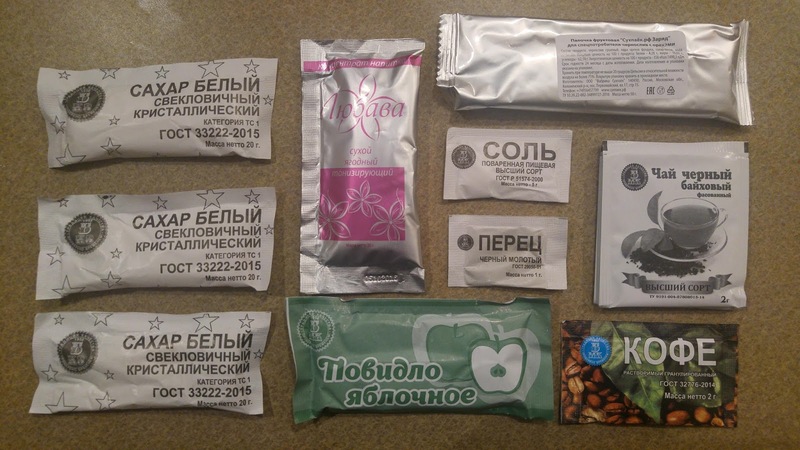 The foil packets contain drink crystals for lemon and raspberry flavored drinks, but unlike any drink crystals I'd seen before - they came in small, lumpy clumps that resembled fish food and took quite a bit of stirring to dissolve, and even then the flavor wasn't very strong. 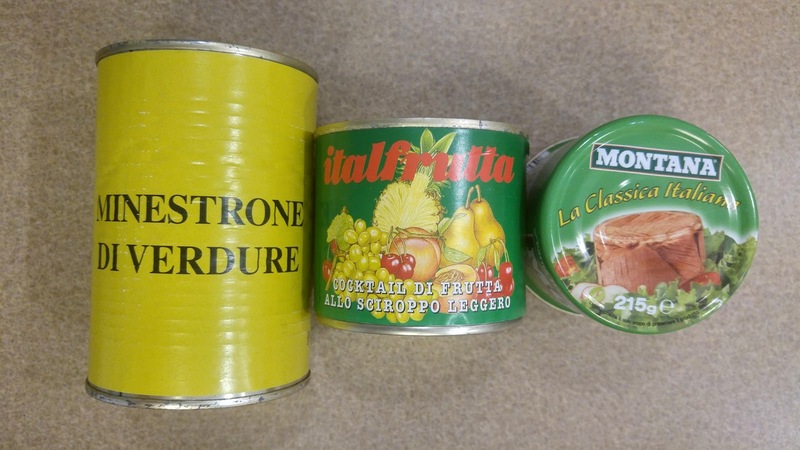 Next, we have these four big tins, The two 300g tins are the lunch and dinner mains - Pork Neck with vegetables in sauce, and Beans stewed with meat in tomato sauce. 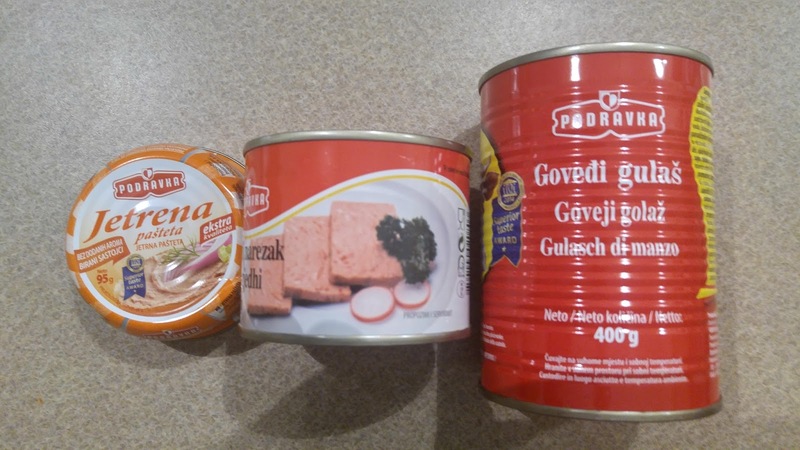 The smaller tins contain pates - konserwa tyrolska is canned pork, similar to spam, and the other translates as 'Tourist pate', which is more pork ground into a finer consistency. 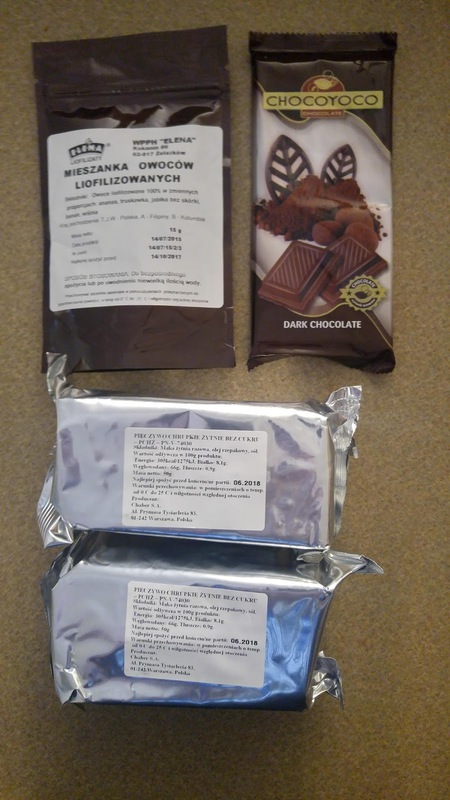 Also for breakfast is included a pack of freeze dried fruit chunks, and a nice, full-sized bar of dark chocolate. 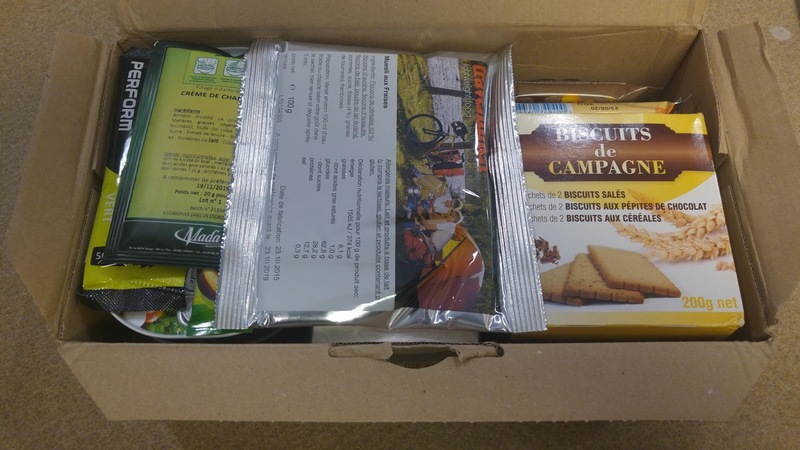 In addition to the hardtack biscuits, the ration contains two packs of rye crispbread. 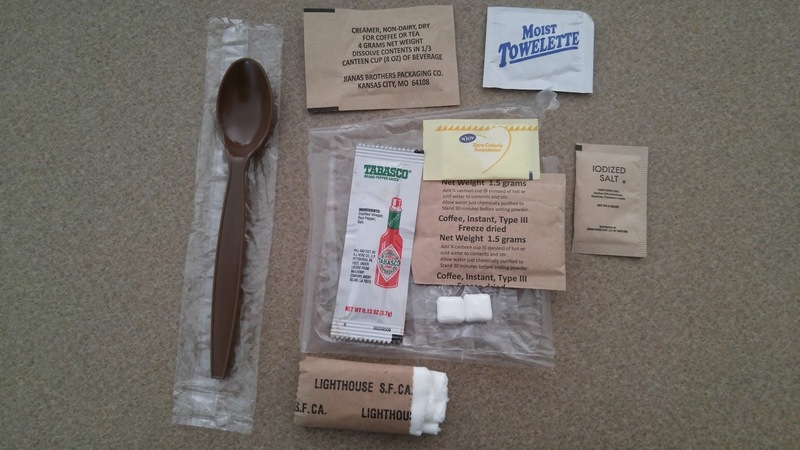 Most military rations will skimp on the accessories, providing only a long-handled spoon and a napkin. 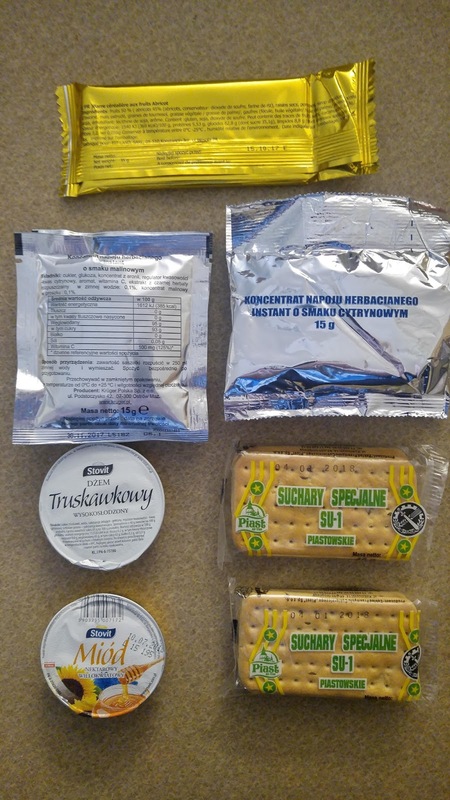 This ration comes with no less than THREE full utensil packs with napkins, plus FOUR paper cups packed with even more goodies! 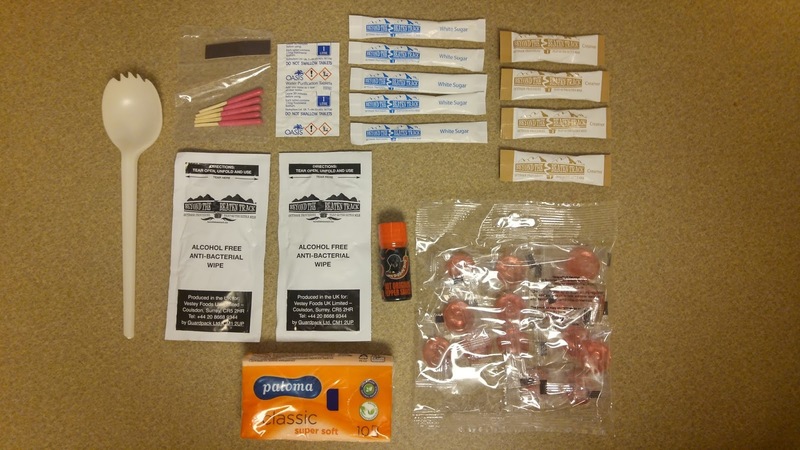 Truly the gold standard for accessory packs! 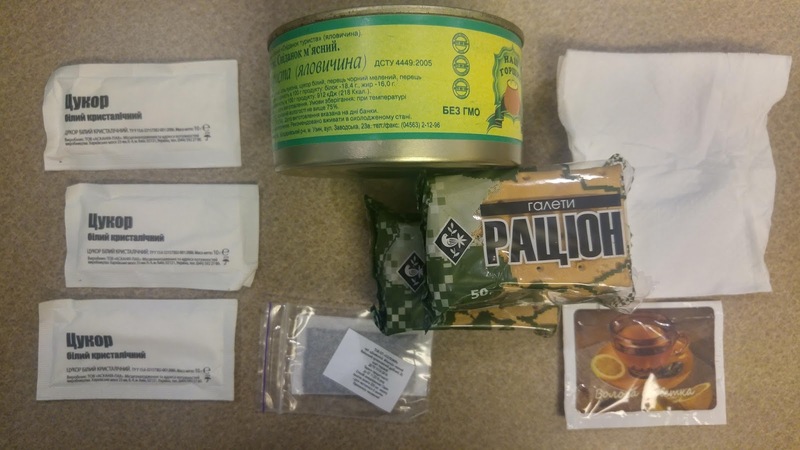 Included in the Polish ration is your miniature field stove, complete with two types of matches - the normal wooden kind, and three special windproof matches. These pack some serious flame power! 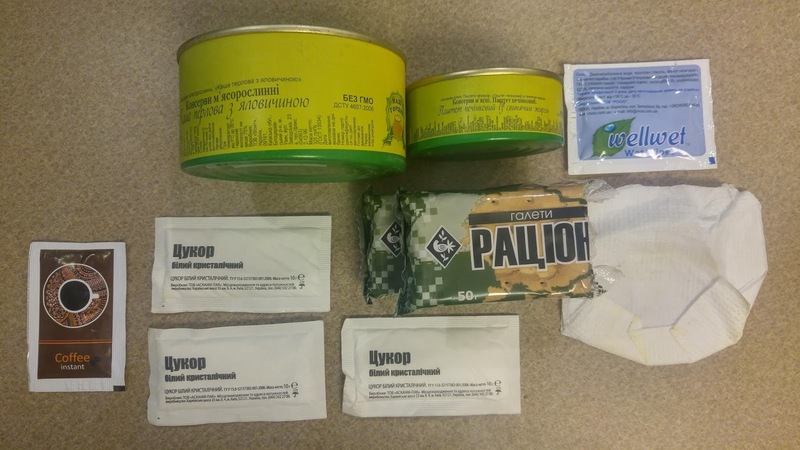 And you will notice a grand total of TWELVE solid fuel tablets - by comparison, the Russian 24-hour ration only comes with three. 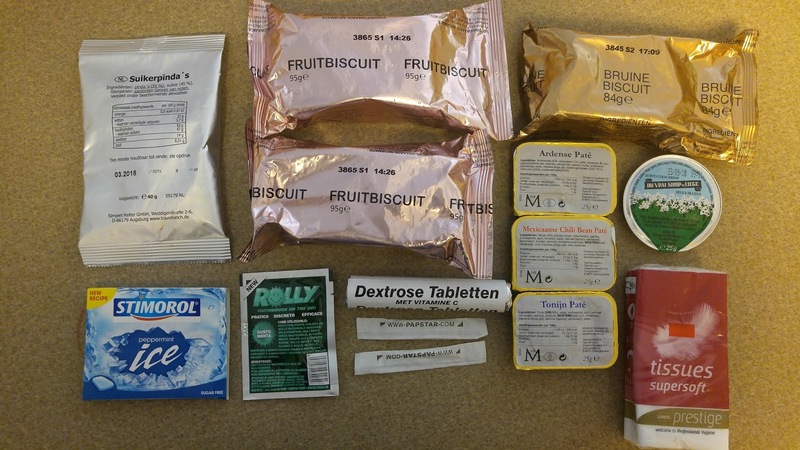 Just one of these tablets is sufficient to leave a main entree piping hot. 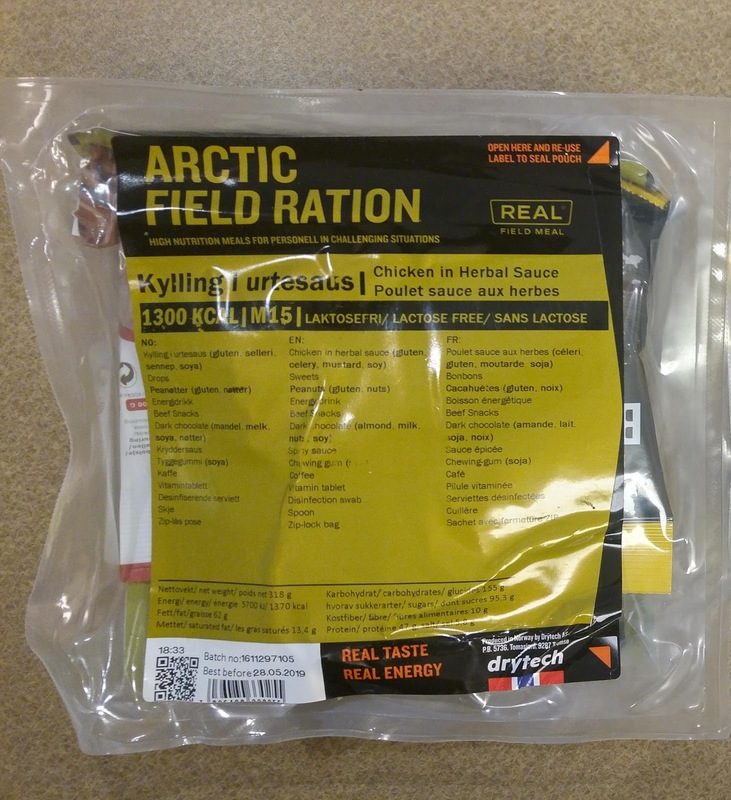 Here is what the freeze-dried fruit looks like in the pouch. 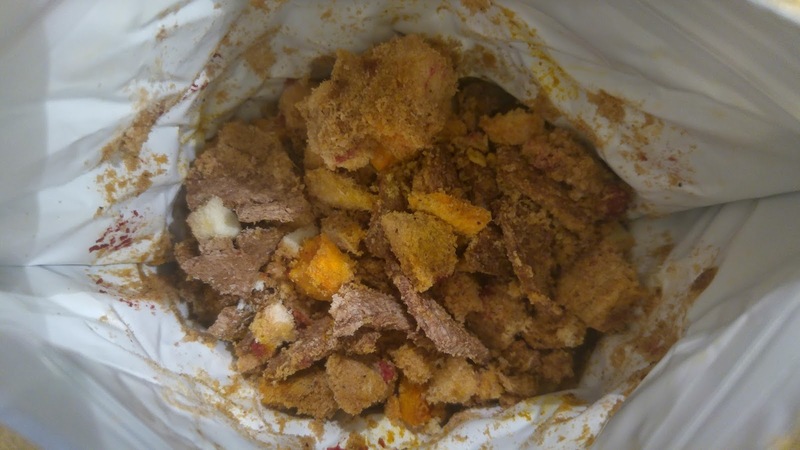 It's a surprisingly diverse mix of apple, strawberry, pineapple, and grape. 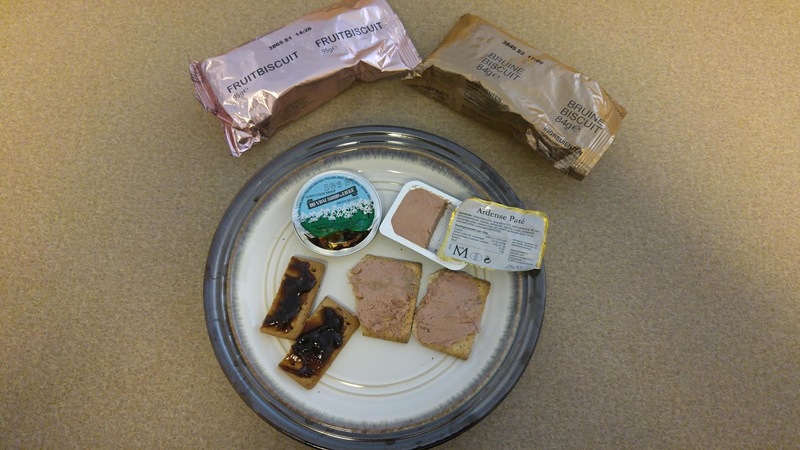 Here is the tourist pate on crispbread. 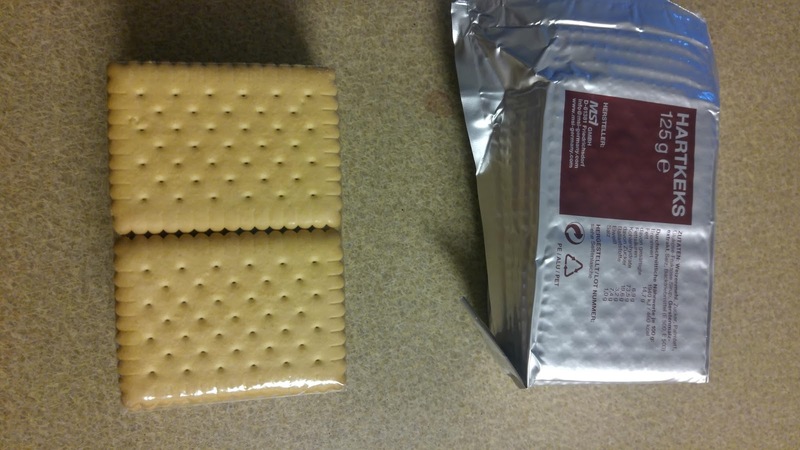 You can see how smooth the texture is, and no separation or gelatin. For lunch, the pork neck with vegetables. 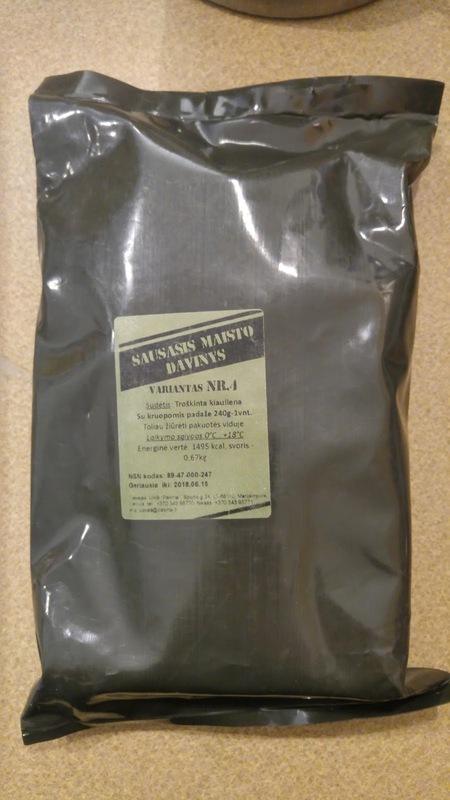 The quality of the meat was very good, and there were lots of nice, big vegetable chunks mixed in. 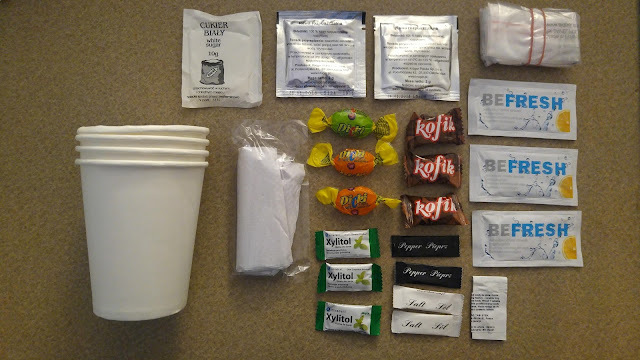 On the bottom right hand corner is the apricot cereal bar. The French military ration is commonly referred to by its acronym, the RCIR. 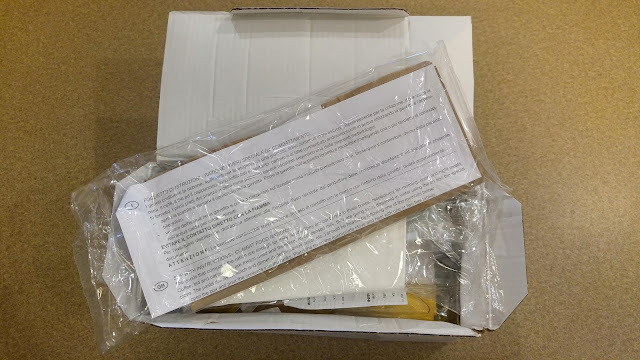 It comes in a heavy-duty corrugated cardboard box, with pull tabs along the side to open it up. 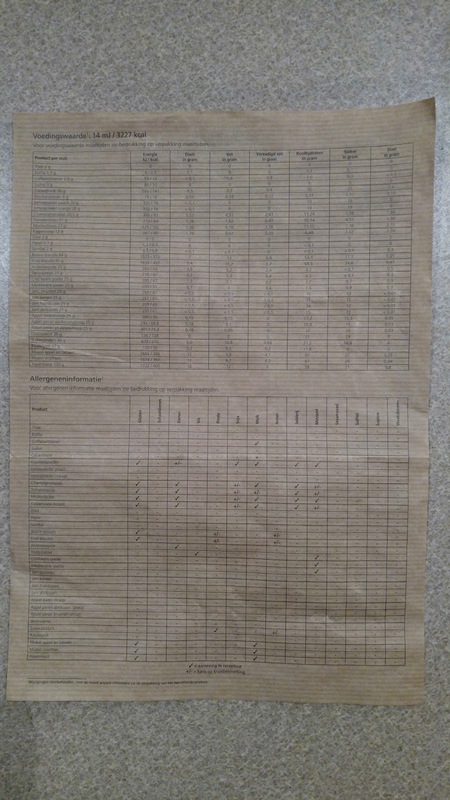 There are currently 14 menus, and in fine French tradition, they are updated every few years. 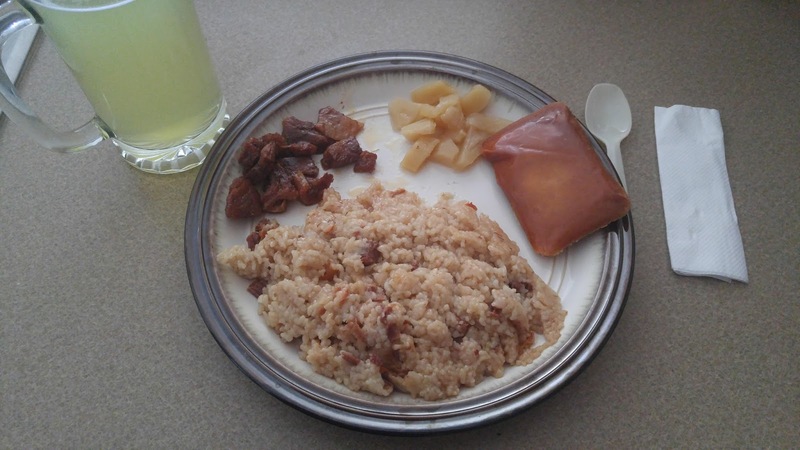 Some menus are sought after more than others for their assortment of unique, exotic dishes: deer pate, duck, veal, shrimp, squid and rabbit (in previous years), and even OSTRICH. 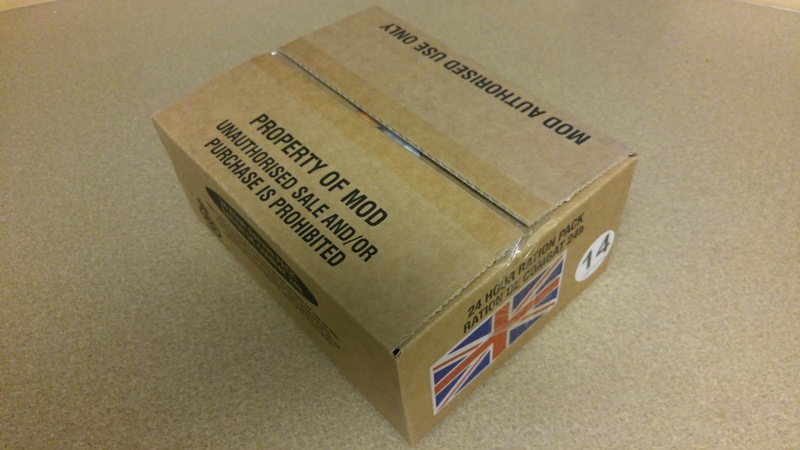 Fortunately, they are readily available on eBay, though a bit on the high side price-wise. 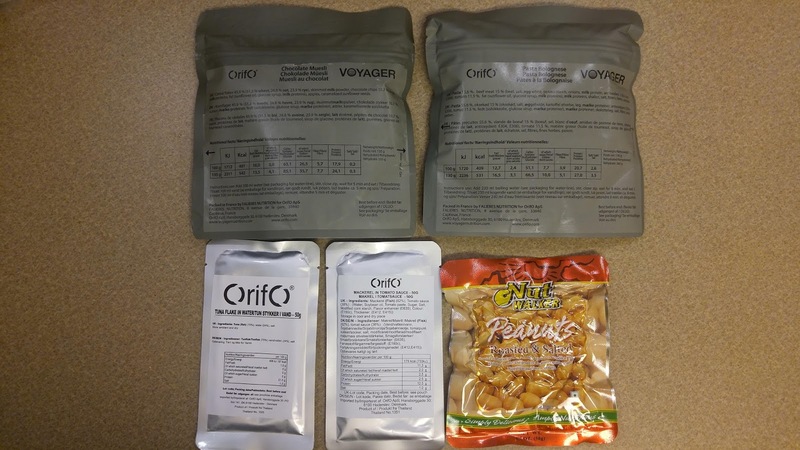 The RCIR is a 24-hour ration, and its contents are sourced exclusively from the civilian market. 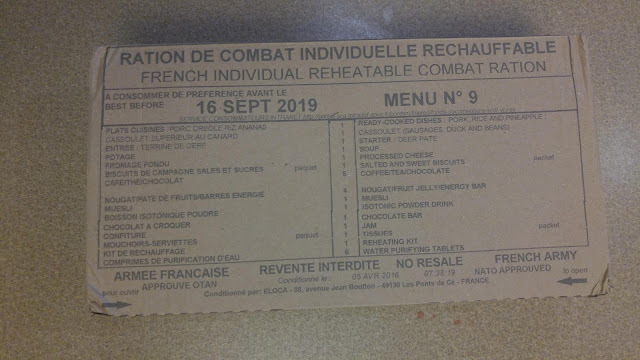 Only the best for a French repas! 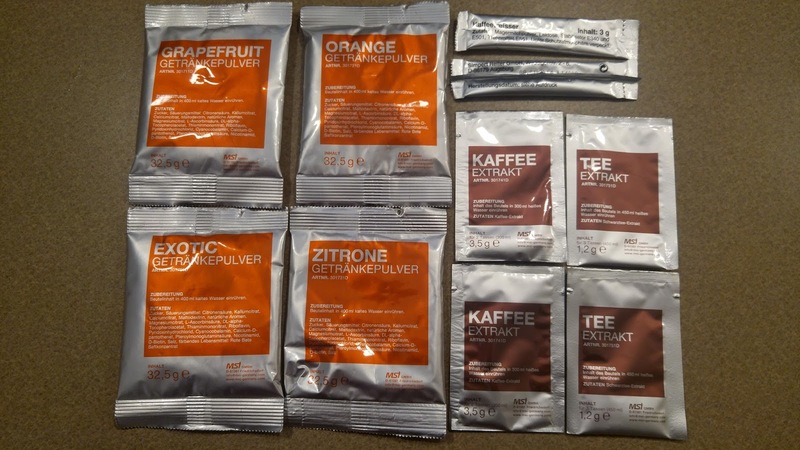 *The isotonic drink mix is different from the more common drink powders. 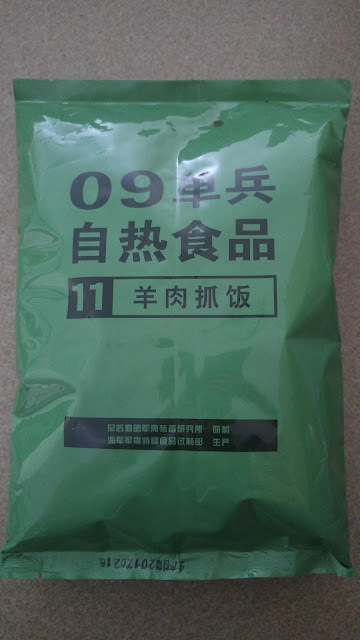 It is far less sweet, and is designed for rehydration and quick energy. This one didn't mix particularly well, leaving a bunch of sediment at the bottom of the glass. 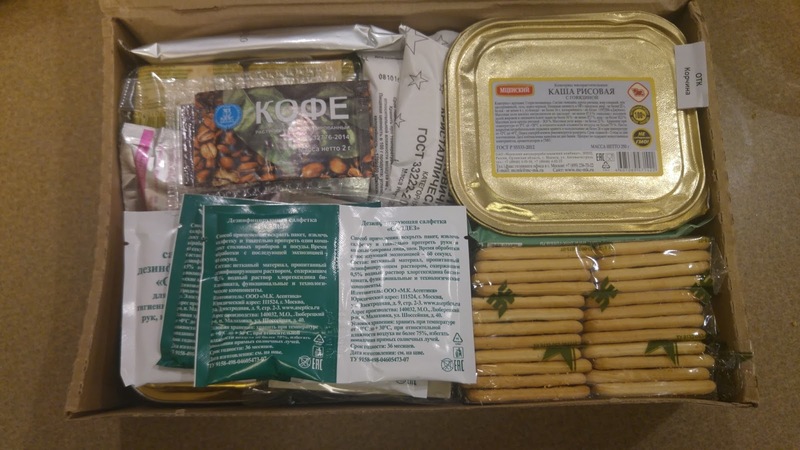 - Box of wooden matches. 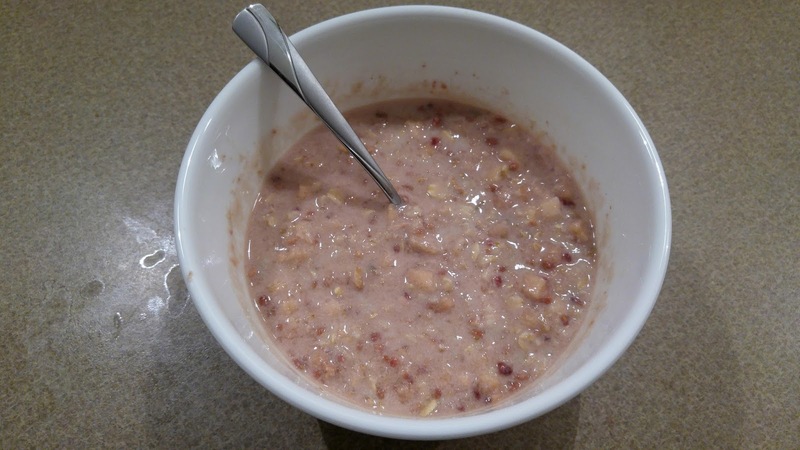 We start breakfast with the fruit muesli. 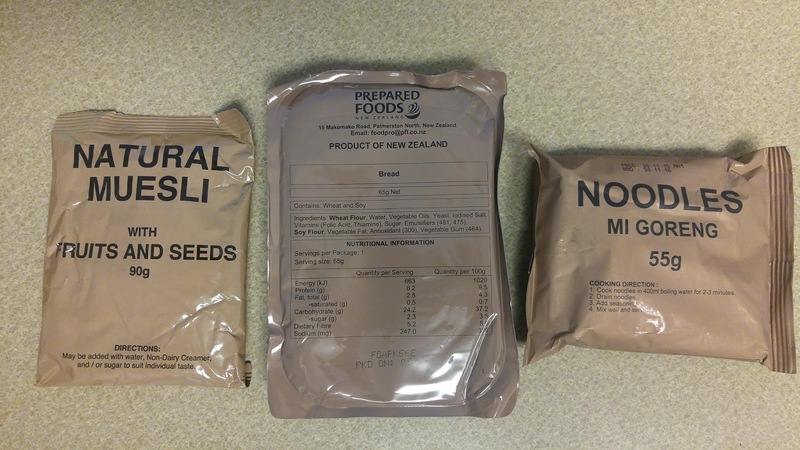 Cheese does not normally feature in military rations. 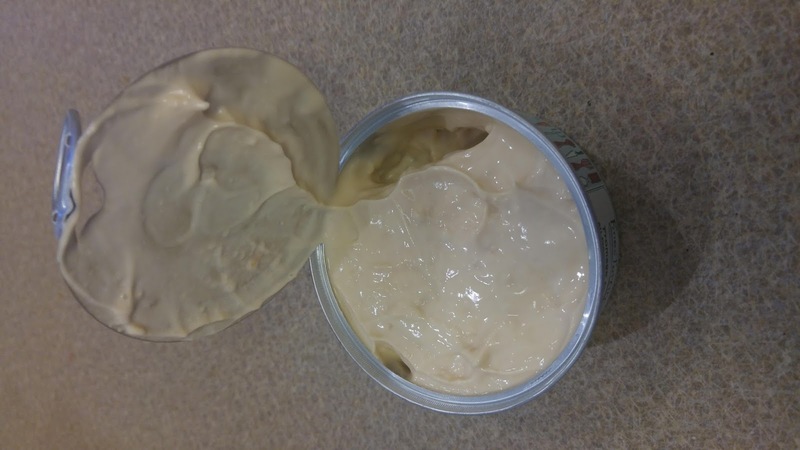 As a dairy product, it is prone to spoiling and does not have a good shelf life compared to most ration items. 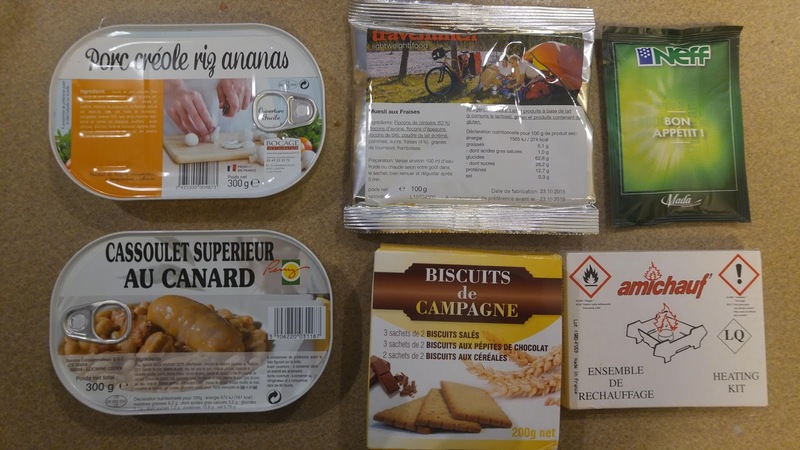 However, if any country is going to have a nice cheese as part of their ration, it has to be France. 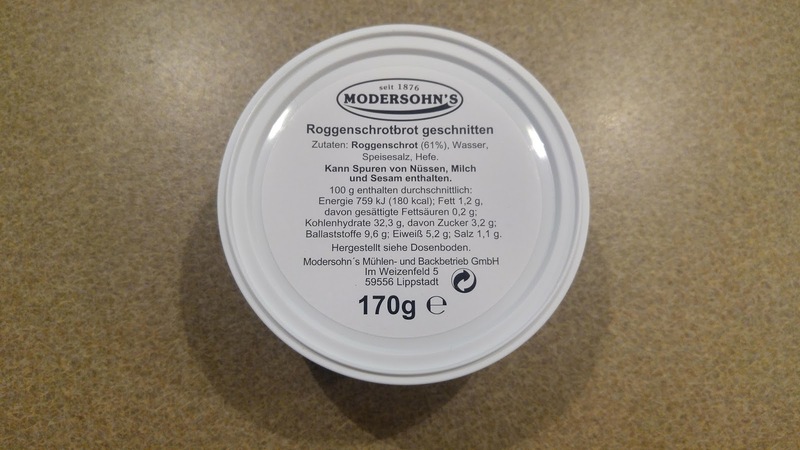 This lovely fromage de chevre (goat cheese) had a creamy, buttery texture and a slightly salty flavor with strong earth tones, particularly mushroom. 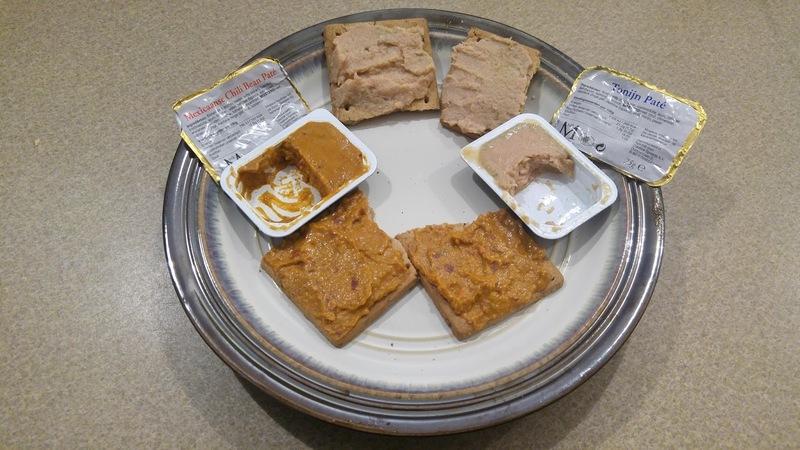 A great spread to put on top of the salty or wheat crackers. 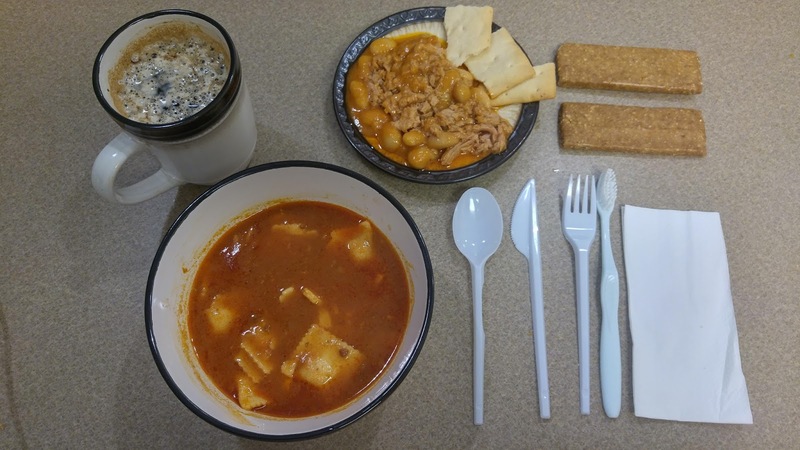 For lunch, the pork with rice and pineapple, as well as the nougat and cafe bars, and the cup of mushroom soup. 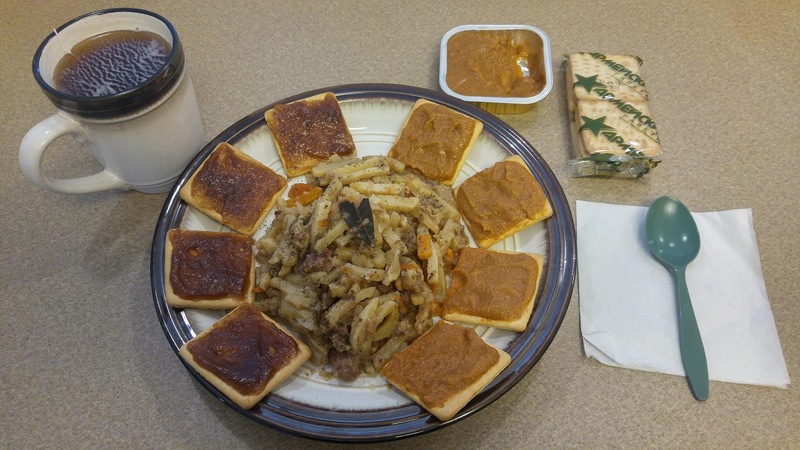 Supper was the cassoulet, plus plum jam on chocolate chip crackers and the dark chocolate for dessert. 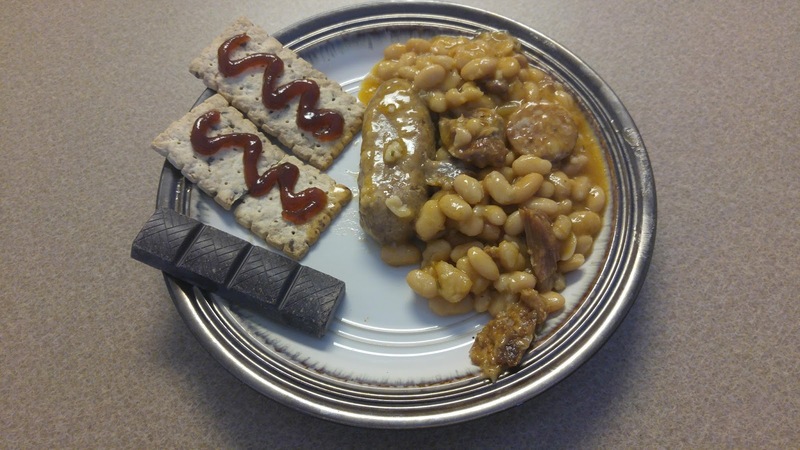 The sausages were tender and chewy, and the beans were cooked just right - not too soft. 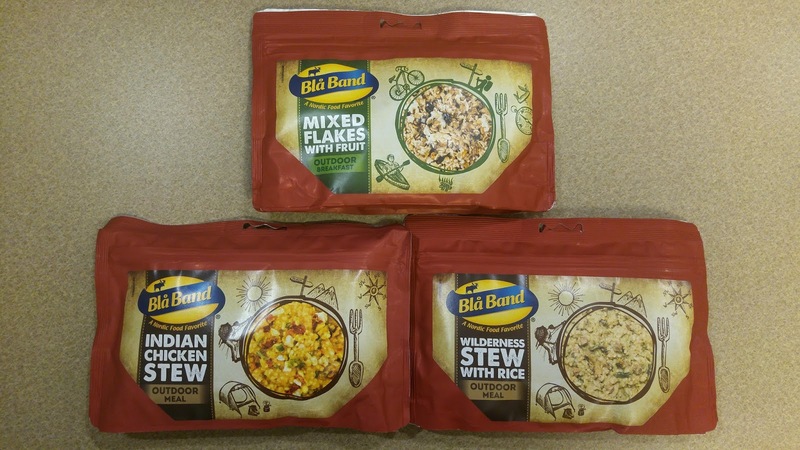 Perfect for an evening meal. 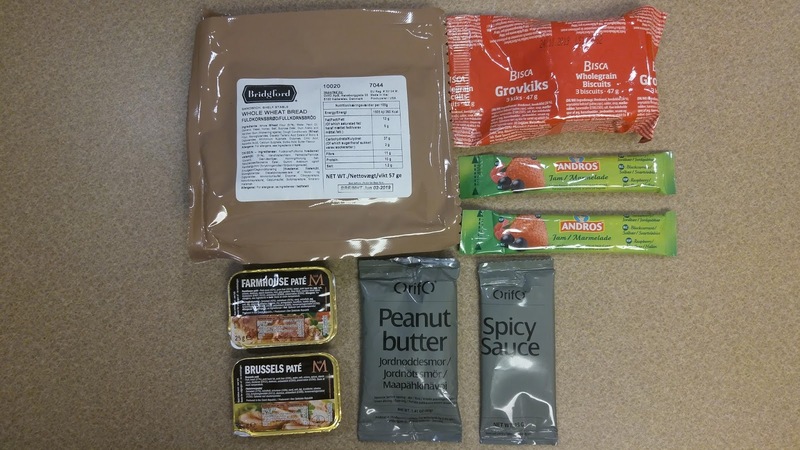 In 1941, Dr. Ancel Keys walked into a local supermarket and picked out a variety of inexpensive, but energy-rich and shelf-stable foods to design a non-perishable, ready-to-eat meal that could fit in a soldier's pocket. 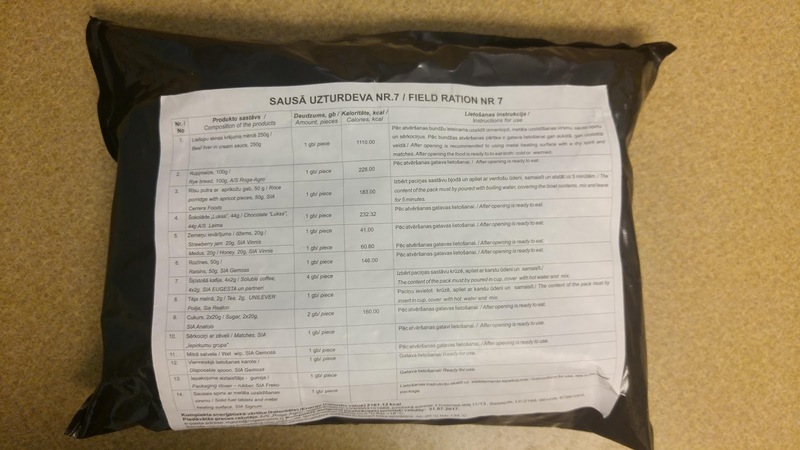 The ration received evaluations ranging from 'palatable' to 'better than nothing' from soldiers on a nearby army base, but provided a foundation for American rations that have fed soldiers and civilians the world over from World War 2 to the current day. 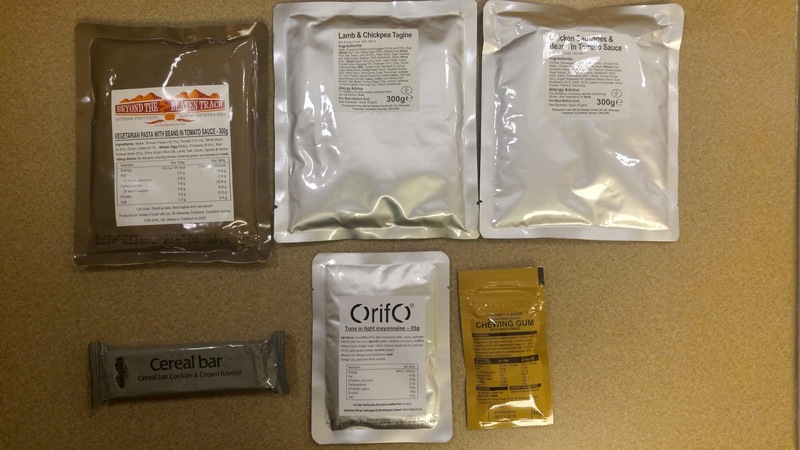 Due to the sheer size of the United States military, no one supplier is large enough to produce sufficient quantities of the MRE, and thus the current version can be found with multiple variations in packaging. 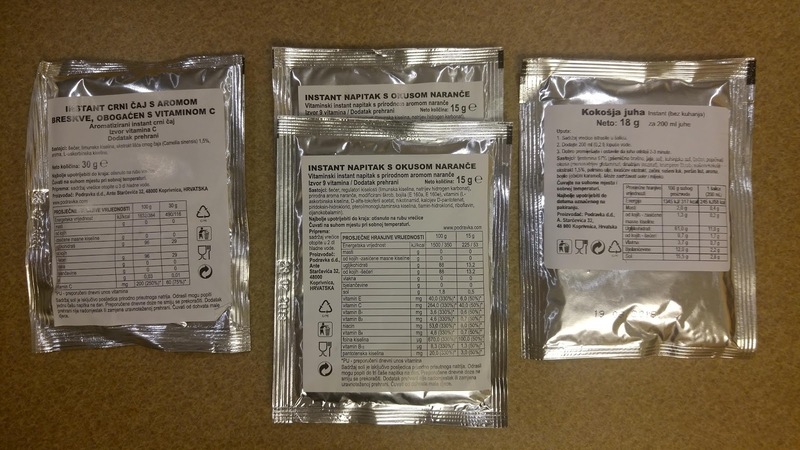 Seen above are three MREs purchased from the same Base Exchange grocery. 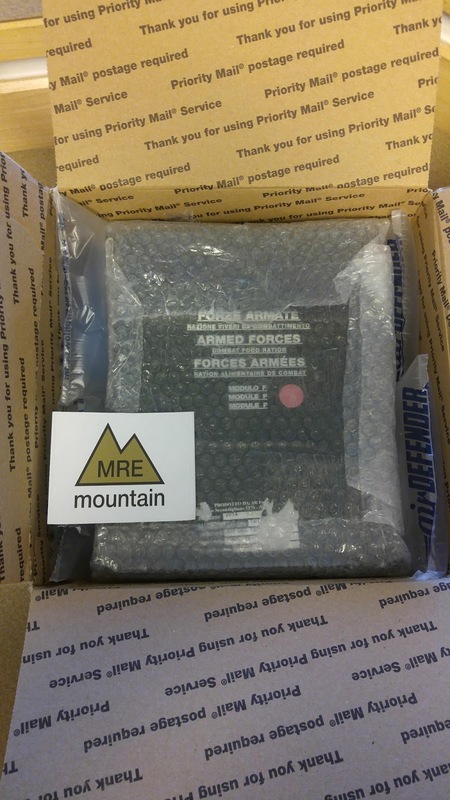 To be sure of authenticity, look for the Department of Defense seal and the label "U.S. Government Property / Commercial resale is unlawful". 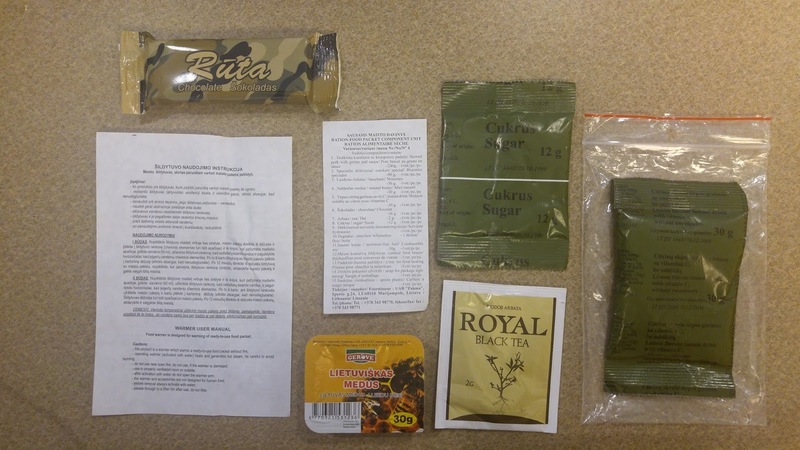 Note that it is legal for currently serving military members and US veterans to purchase these rations. 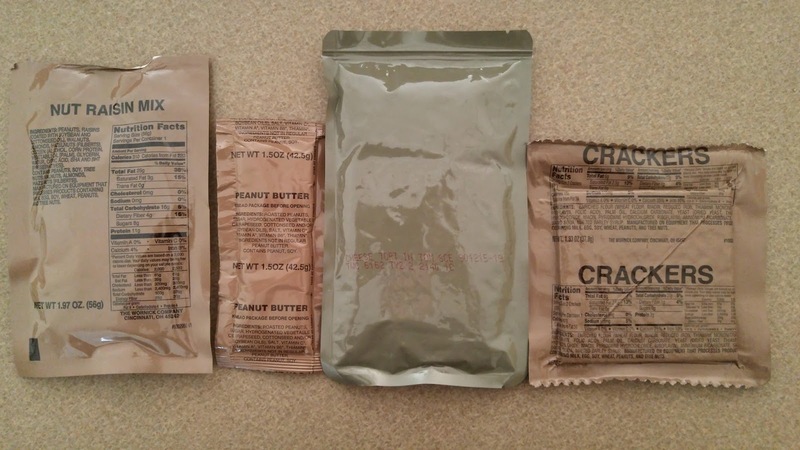 US military MRE's come in sealed, thick plastic pouches which are designed to be peeled open at the top with relative ease. The basic formula for an MRE's items includes one to two pouches for the main entree, a bread or cracker pouch, one to two spreads, a cold drink, a hot drink, a snack, dessert item, spoon, accessory pouch, and flameless ration heater. 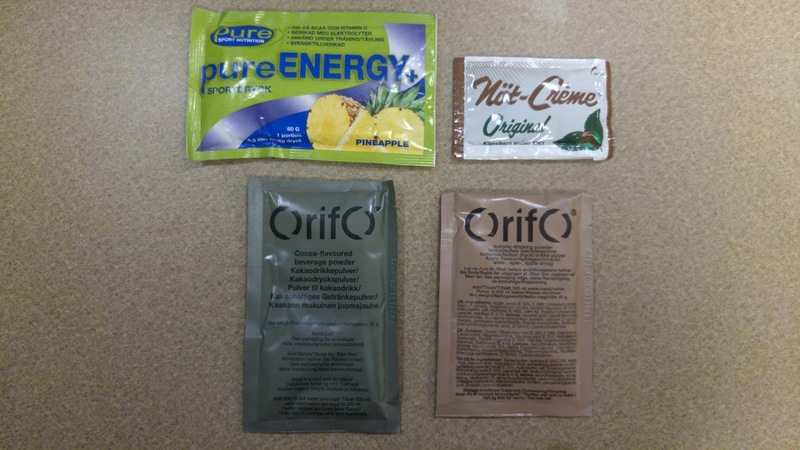 These pouches are almost exclusively light brown or olive green, with black or red lettering. Some civilian-origin desserts like Skittles come in original packaging, while others such as Combos or Pop-tarts are repackaged. 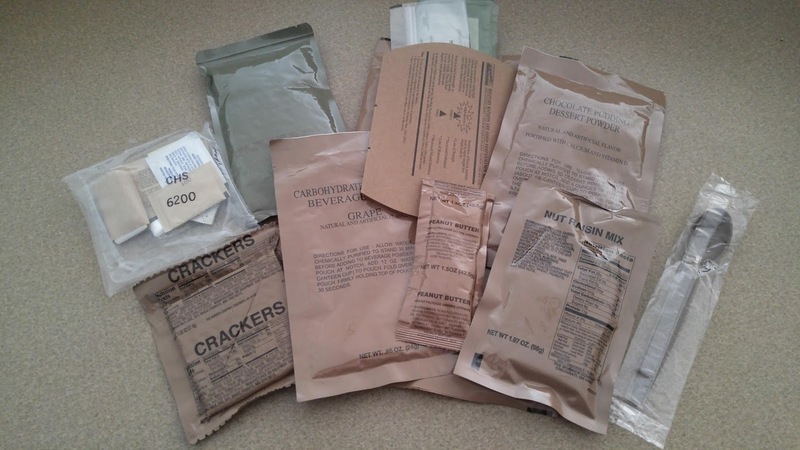 *Some may believe this is meant to be toilet paper, until they eat the MRE and remove all need. 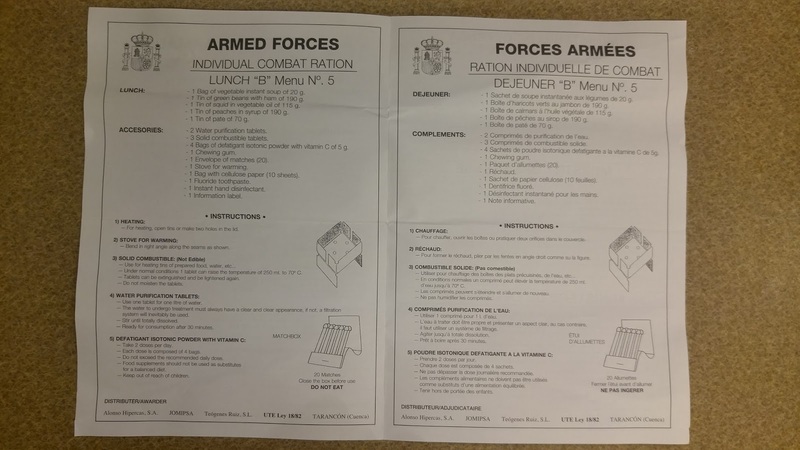 Helpful instructions for how to use the flameless ration heater. 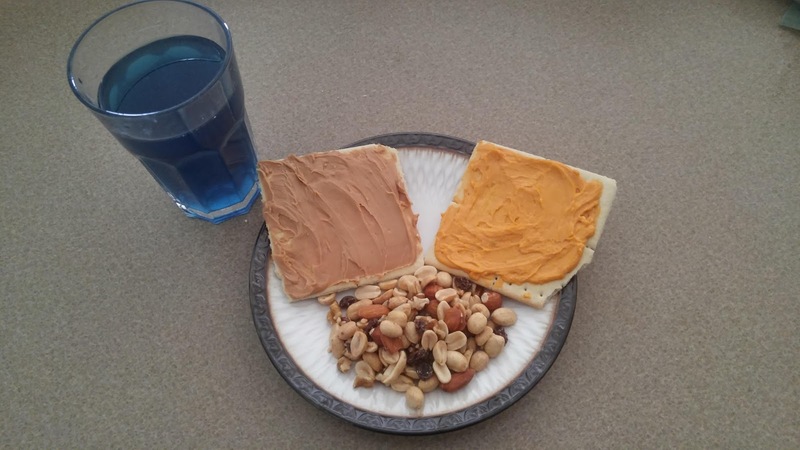 Grape drink, crackers and trail mix. 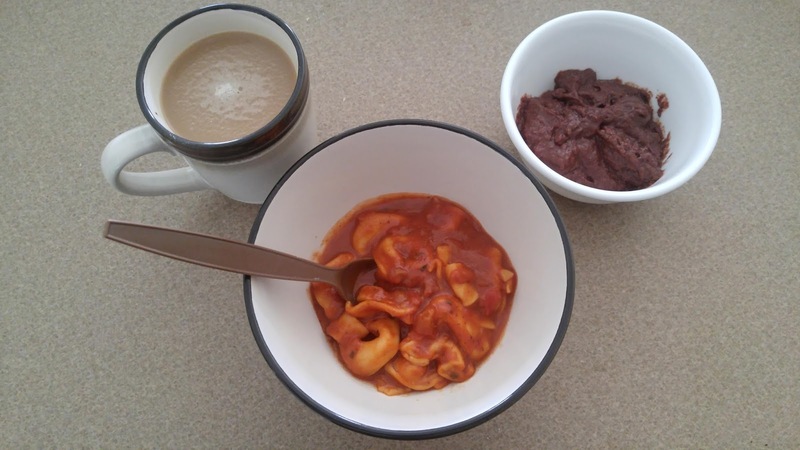 Main course: Coffee with cream and sugar, cheese tortellini, chocolate pudding. 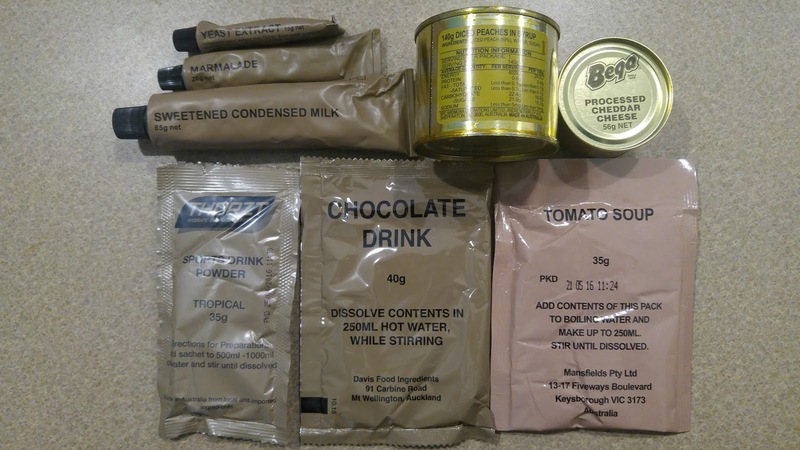 During World War 2, and for many years after, the British people - military and civilian alike - were subject to strict rationing. 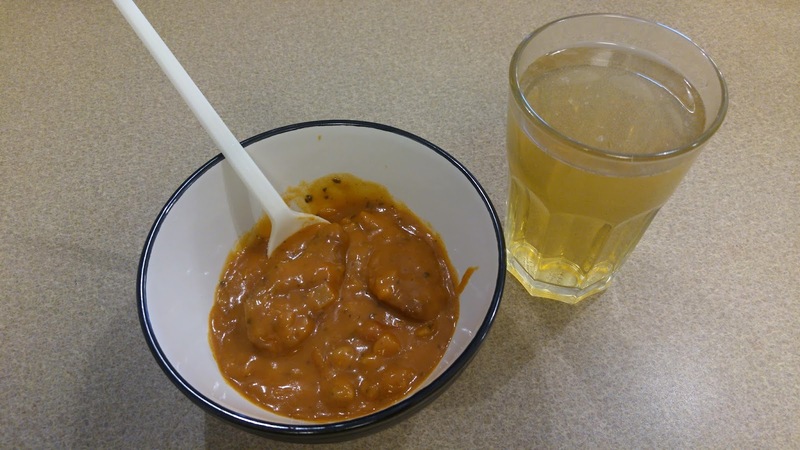 Foreign food was the stuff of fantasy, as even travel to nearby France was beyond the means of most Britons. 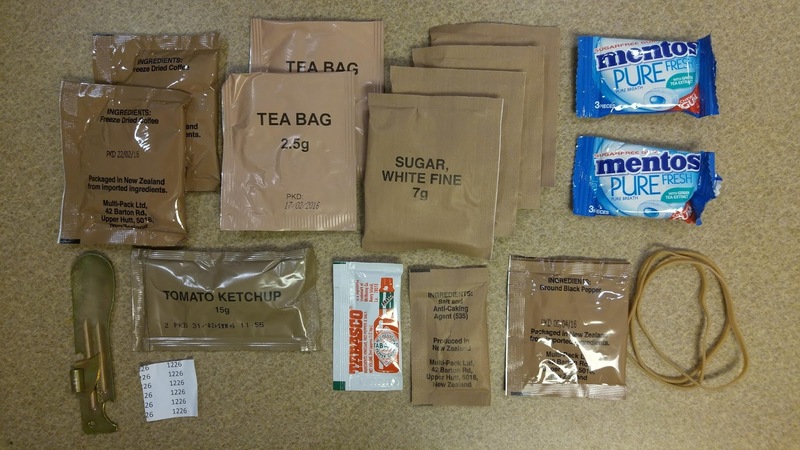 Today, Britain's rich love of food and ethnic diversity is reflected in their military rations. 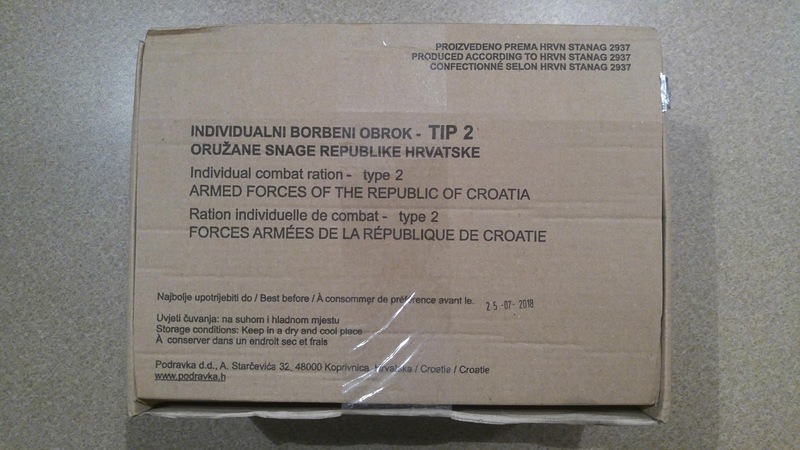 The 24-hour ration comes plainly packed in a sturdy cardboard box, with a proud Union Jack on the side. 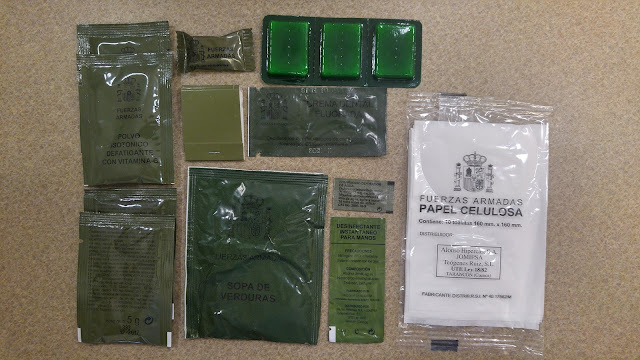 The items are a combination of military and civilian-origin, most of which are sourced from the 'Beyond the Beaten Track' company. 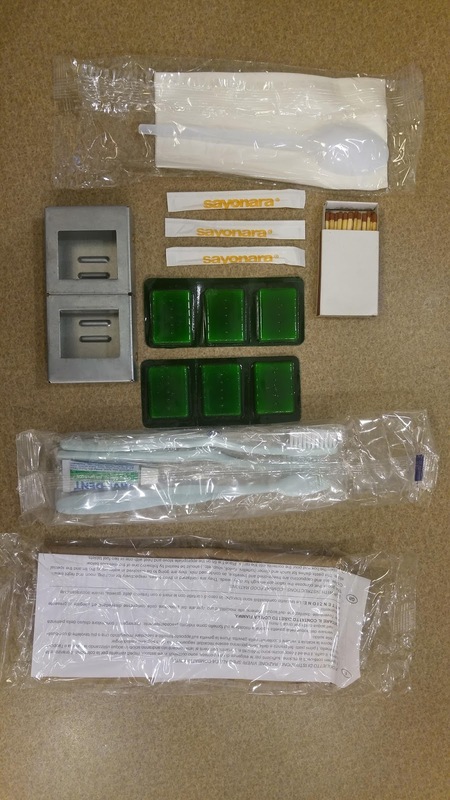 The accessories are helpfully contained within a large, sturdy ziploc back which can be reused for trash or storage of extras. 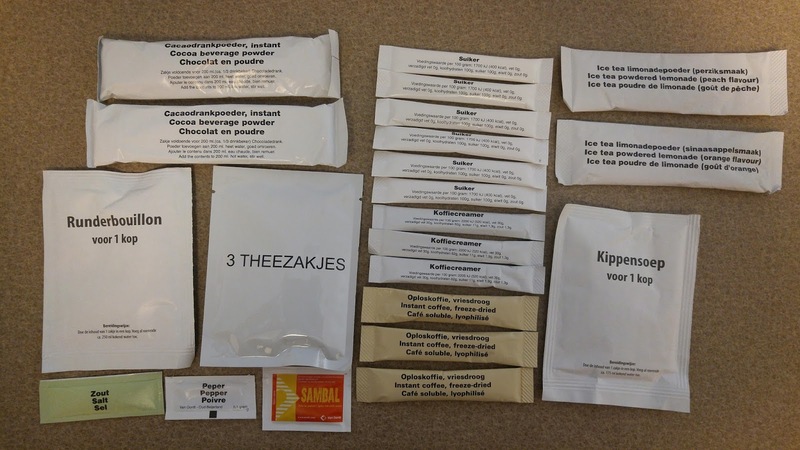 Enough drink options to make no less than nine cuppas throughout the day! 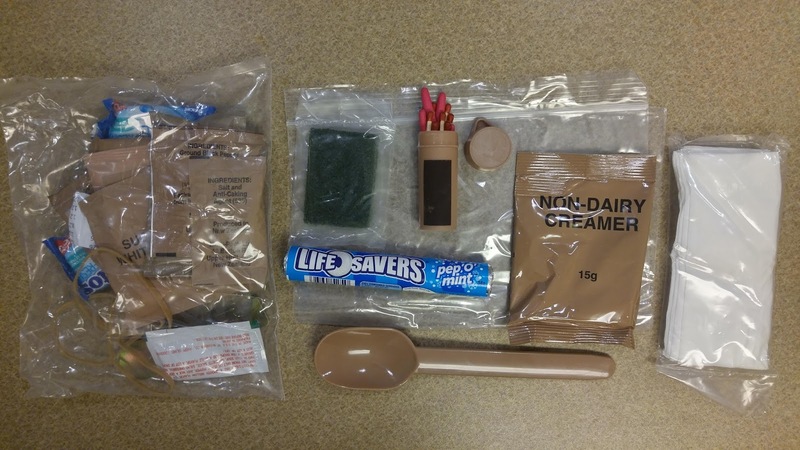 *The spork in the British MRE is made of good, sturdy plastic with relatively sharp tines, perfect for digging through ration pouches and trenches alike. 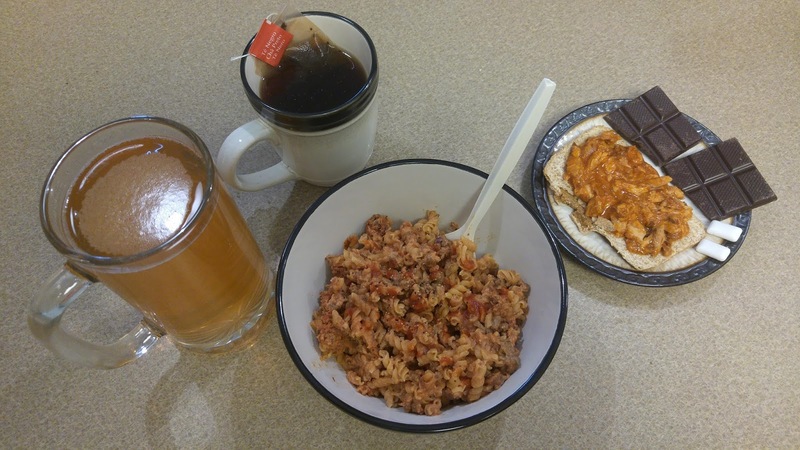 Second breakfast! 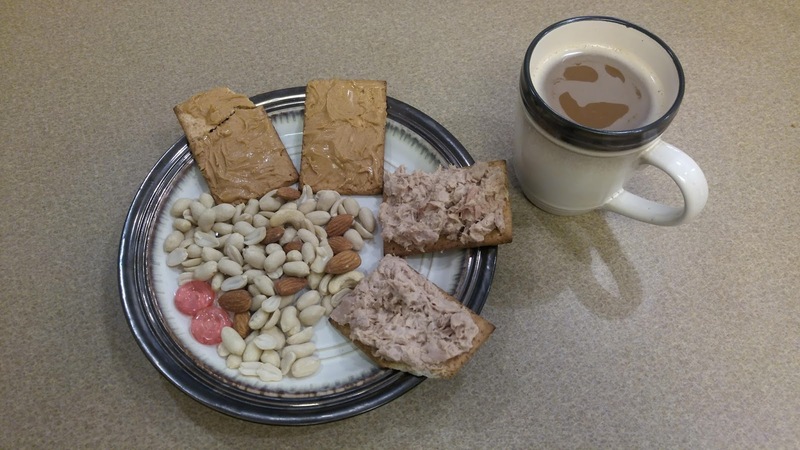 More peanut butter crackers, just nuts, boiled sweets, tuna on crackers, and a hot, fresh cuppa joe. 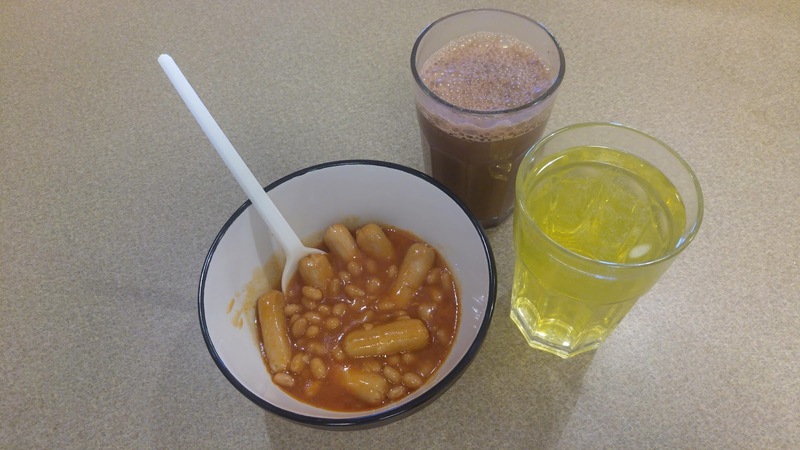 Vegetarian pasta with cola drink and boiled sweets. 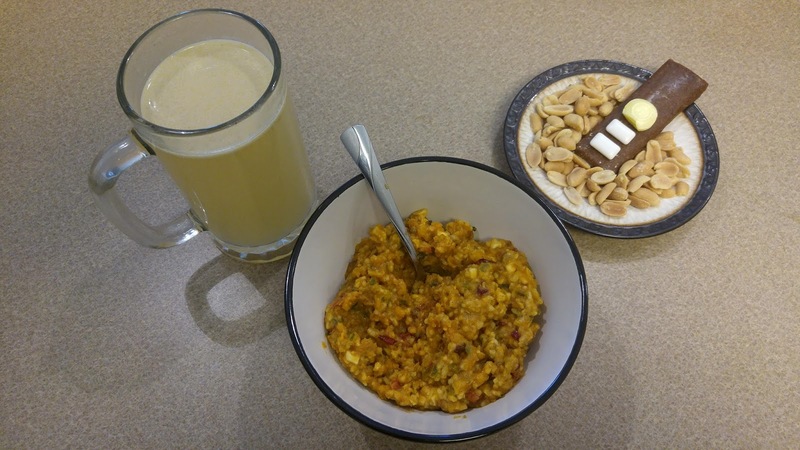 For lunch, lamb tagine with chickpeas, and apple energy drink. 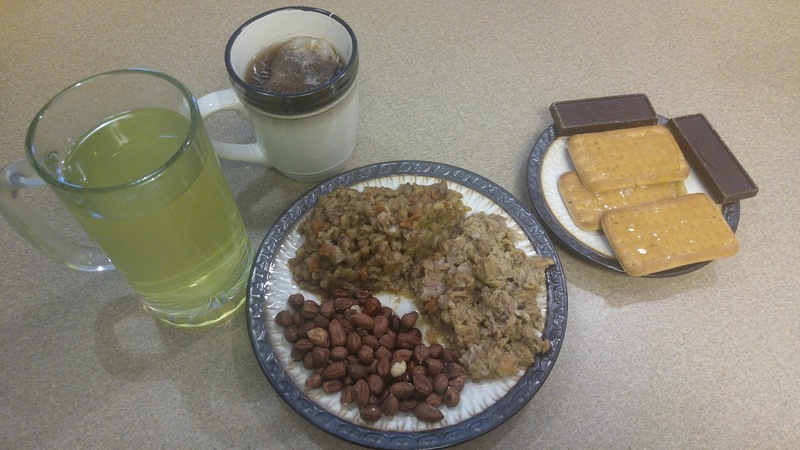 Last, for dinner was the chicken sausage and beans, hot chocolate with orange flavor, and the tutti frutti drink. 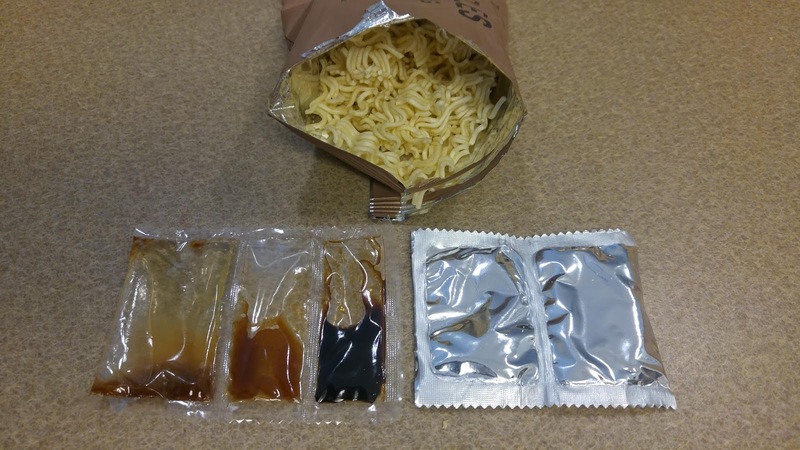 The ration comes in a clear plastic ziploc bag, with two smaller bags inside for the snack pack and the drink packets. 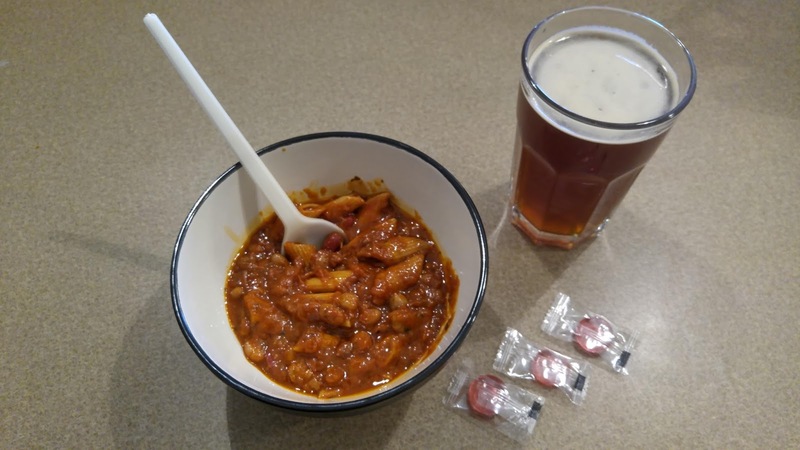 Plenty to drink, plus a few accessories! 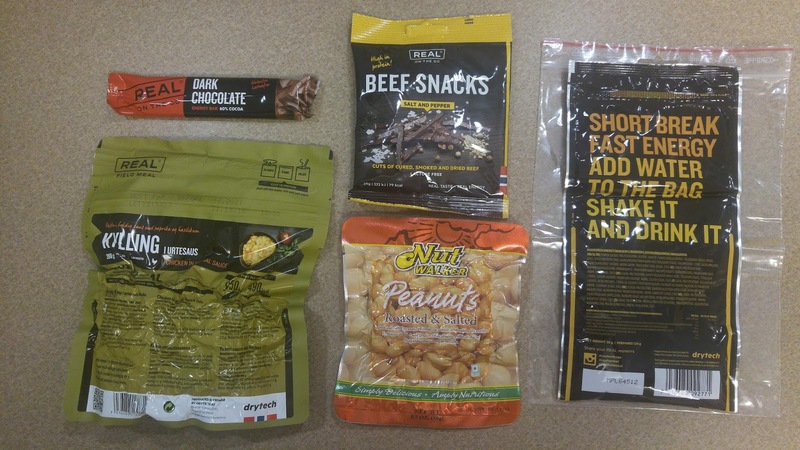 Lots to snack on! And some things you shouldn't swallow... see below. 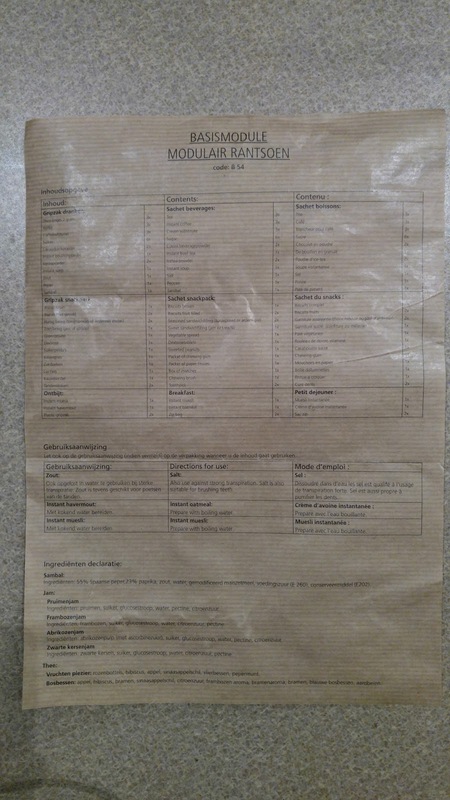 The ration also comes with a helpful menu page for translating into Dutch, English and French. 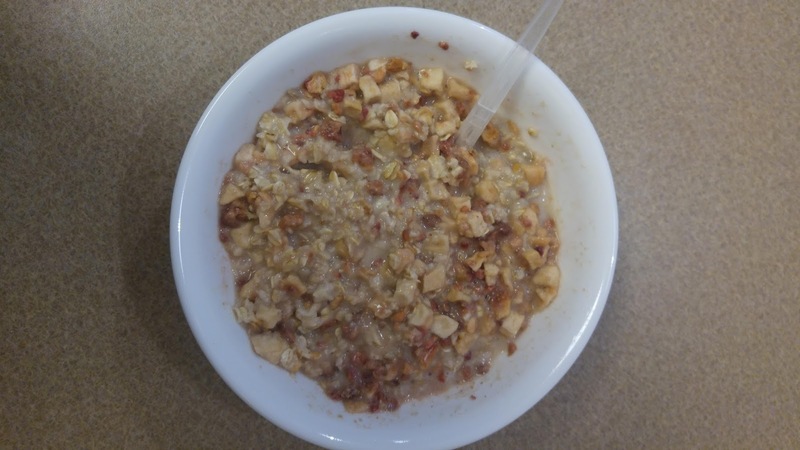 First up is the Muesli with Apple and Berries. 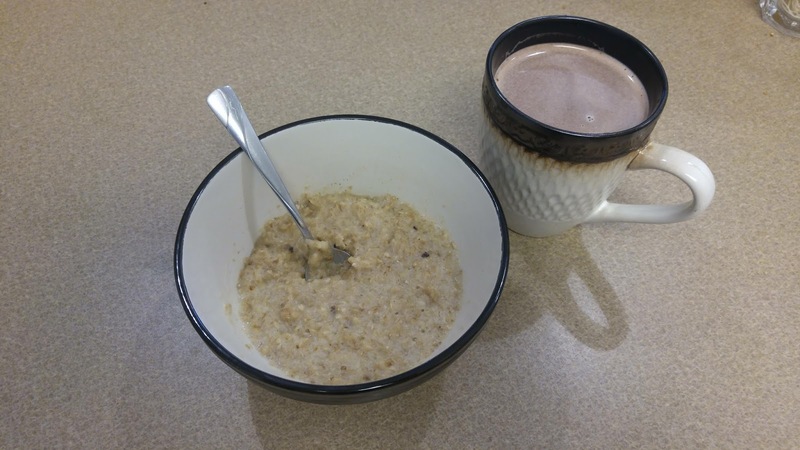 For the traditionalists, we have a plain oatmeal porridge. Add to that a cup of nice, smooth hot chocolate to offset the natural blandness. 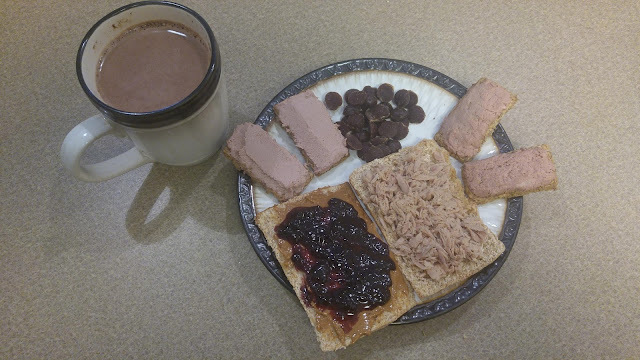 Our first snack, with a combination of fruit and brown biscuits. 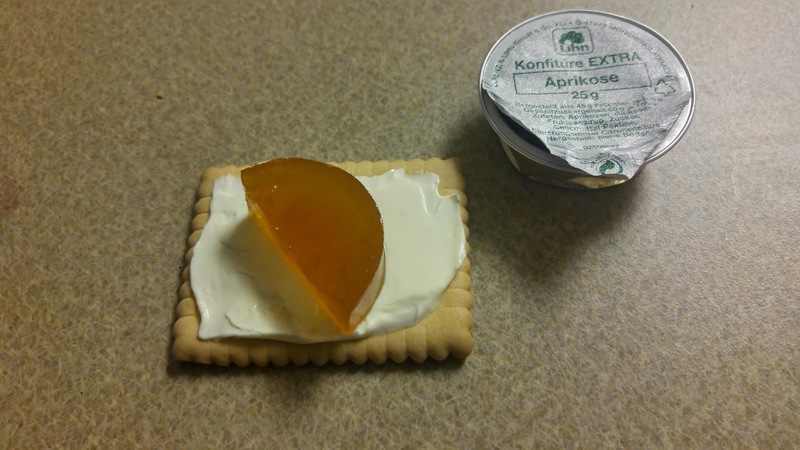 The fruit spread was thick and syrupy, more like a treacle, and had a slightly yeasty smell that gave me nasty flashbacks to trying vegemite in New Zealand. 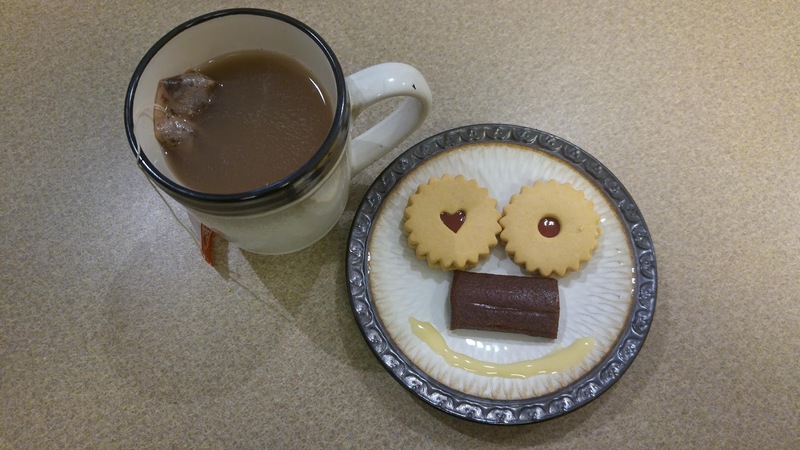 Mercifully, it tasted nothing like vegemite. 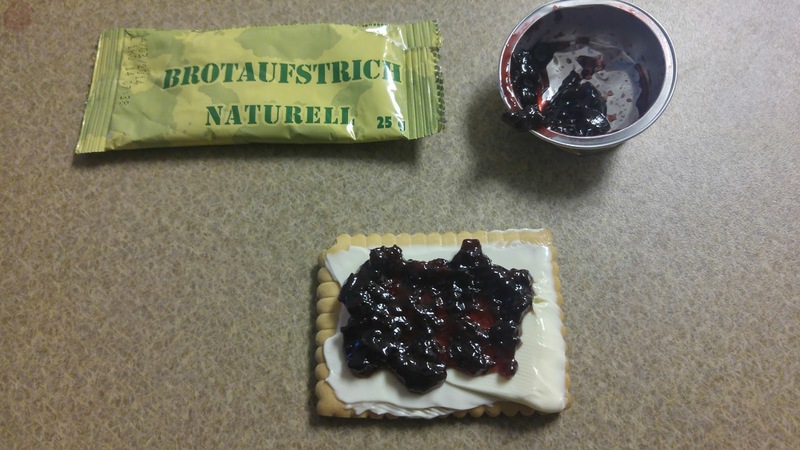 A nice, sweet snack on the fruit biscuits. 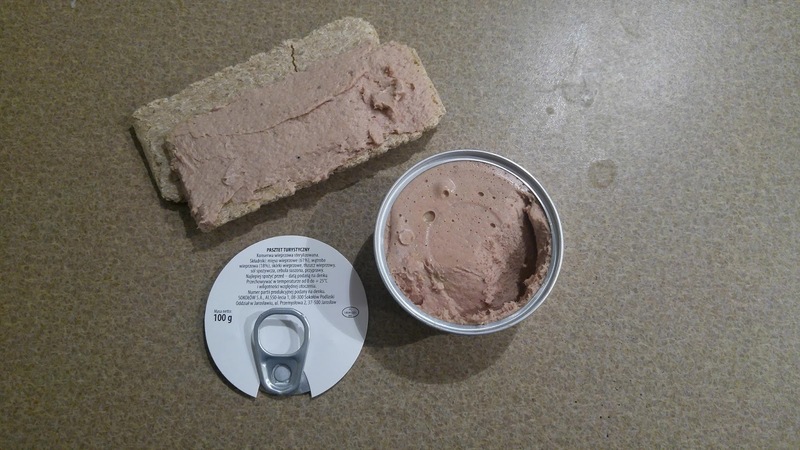 Ardennes pate is a combination of pork fillet, pork liver and pork fat blended to a very smooth texture. 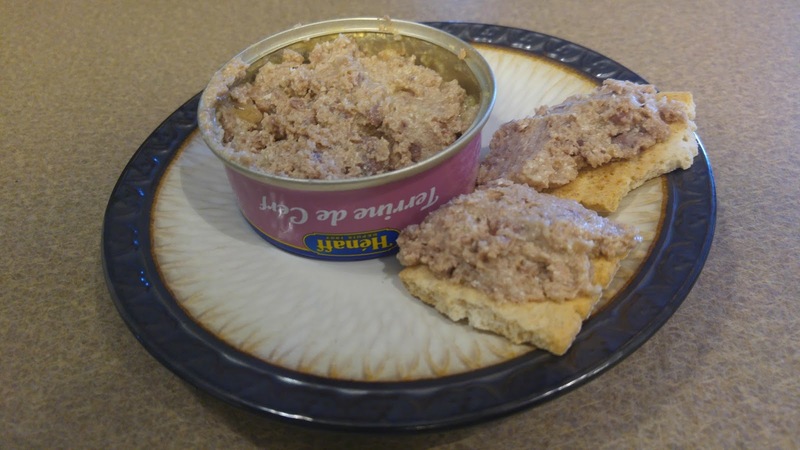 A good mix that downplays the offal flavor of the liver. 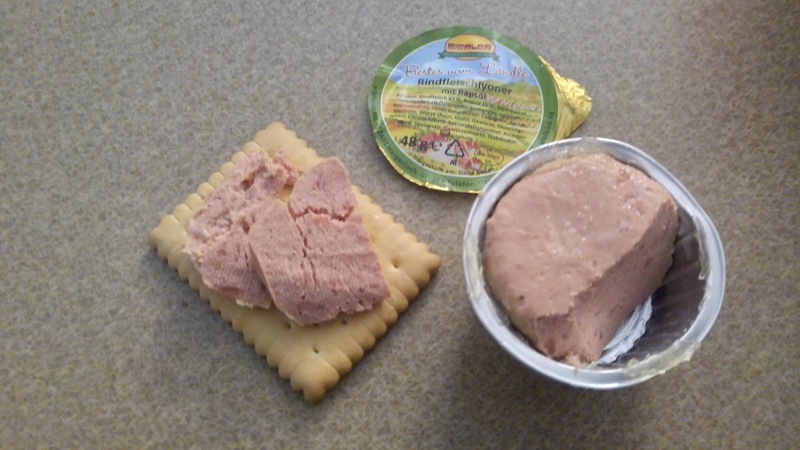 Second snack, tuna and chili paste on brown biscuits. 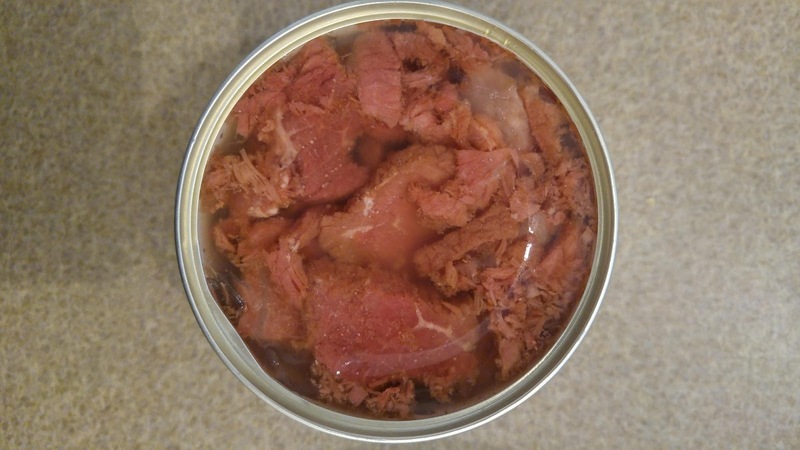 Nothing too special about the tuna, apart from its small size. 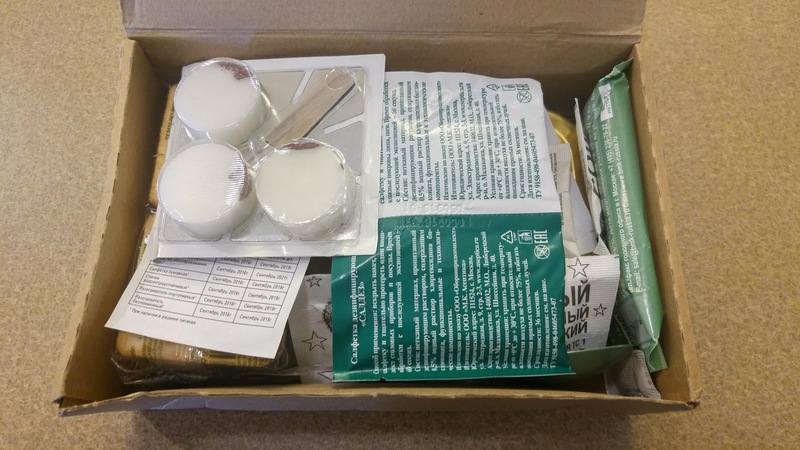 Most countries would have thrown this little blister pack back into the factory until it had grown up into a tin. 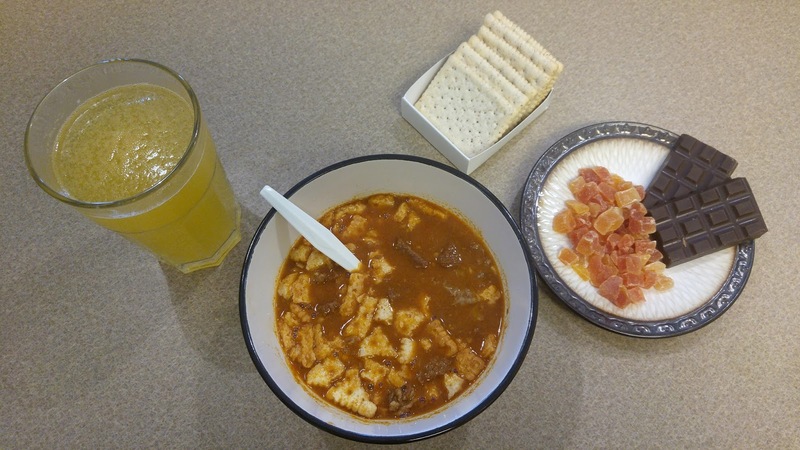 The Mexican chili bean paste was well flavored without being too hot. 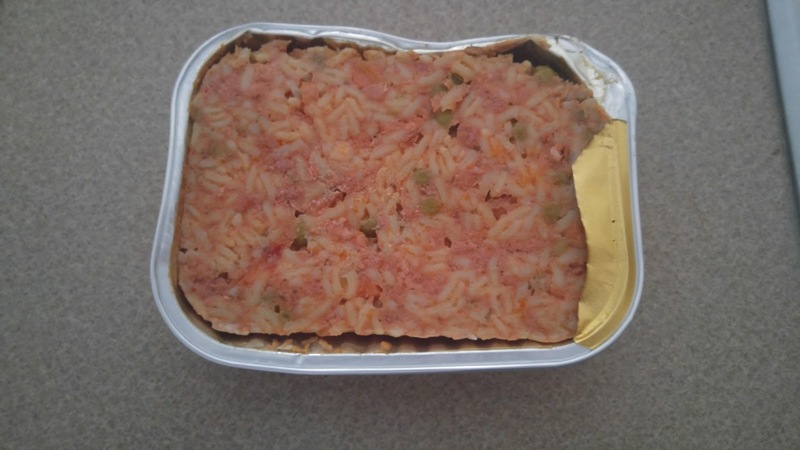 Seeing the little bits of bean mixed in was a nice touch. 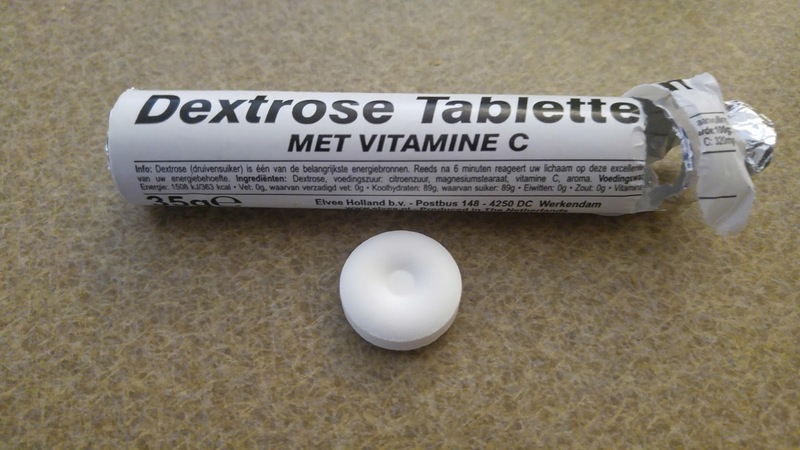 The dextrose tablets are essentially wintergreen Lifesavers, a nice sweet treat to carry around in your webbing. This soft, rubbery disc is covered with fine bristles and coated with a lightly mind-flavored sweetener. 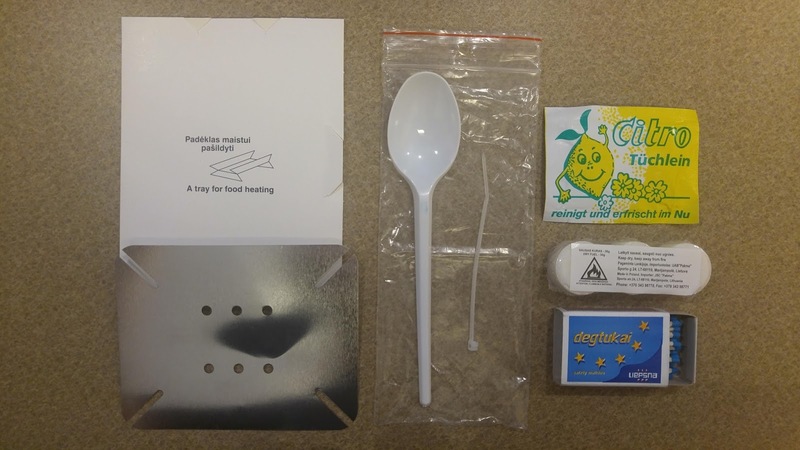 It can be rubbed against your teeth with the tip of your finger, or you can just pop it in your mouth and work it around with your tongue. 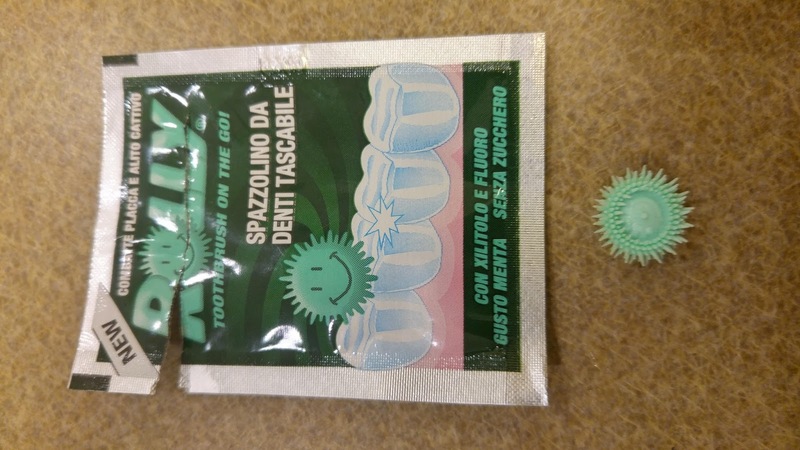 Just be careful not to swallow! 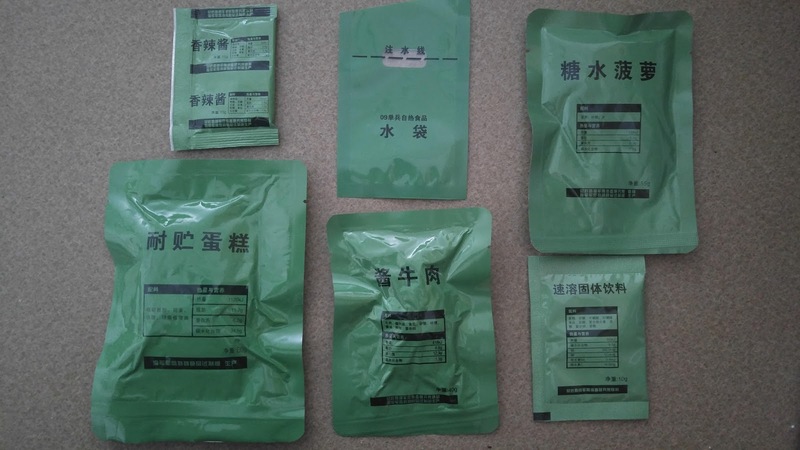 Packaged by individual meals, the ration comes in a cardboard box sealed inside a stiff, olive green plastic pouch. Note the Spanish coat of arms proudly stamped at the top, and the tasteful red and yellow stripe representing the colors of their flag. 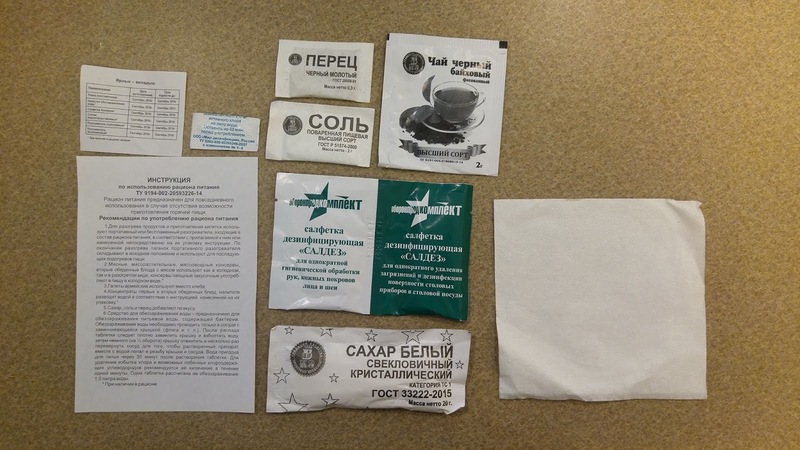 That coat of arms is stamped on practically everything in this ration - even the napkin. Inside, the items are uniformly packed in olive green tins and pouches, printed with black lettering. 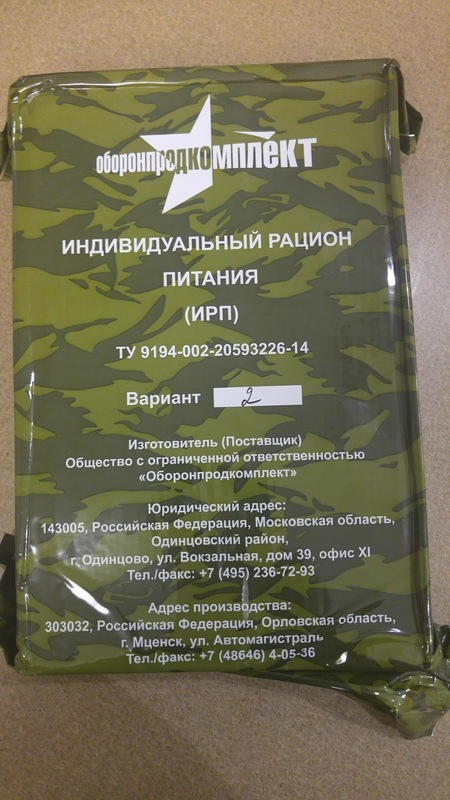 This would be very tactical, if the weren't so SHINY. 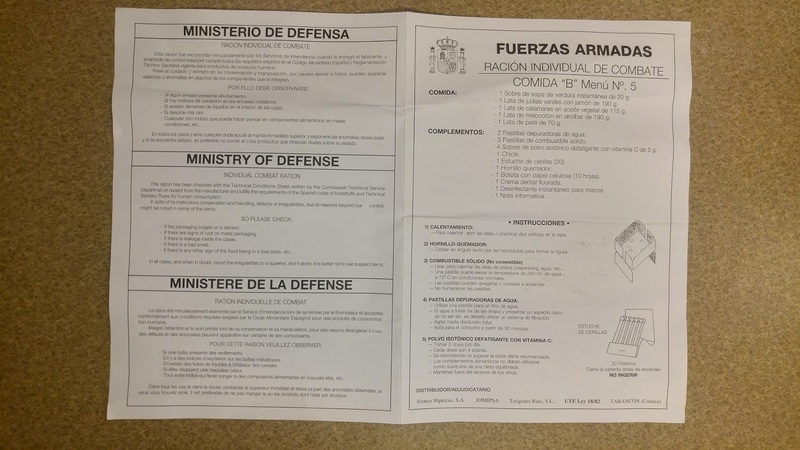 Also included is a helpful list of the menu items in Spanish, English and French. Time to plate it all! 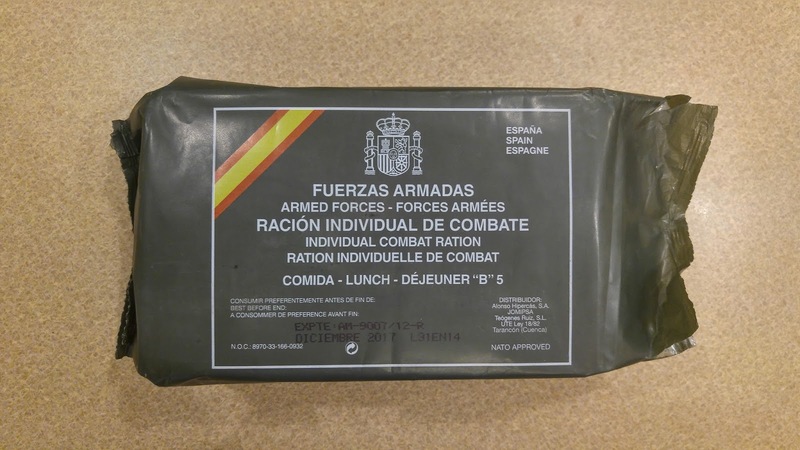 A lovely Spanish soldier's lunch in the field. The Canadian Individual Meal Pack, or IMP for short, comes in a plain brown paper bag style of package with an additional foil liner on the inside. 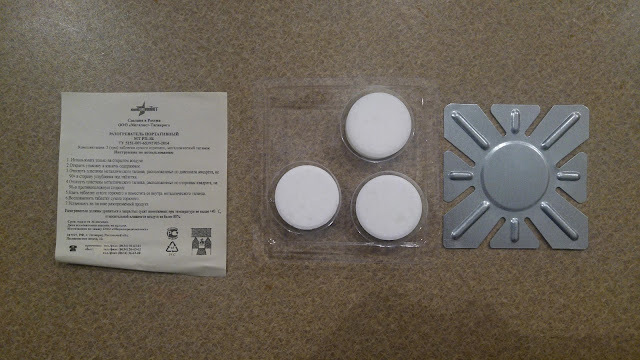 Despite its appearance, the packaging is actually quite tough, while still being easy to open. 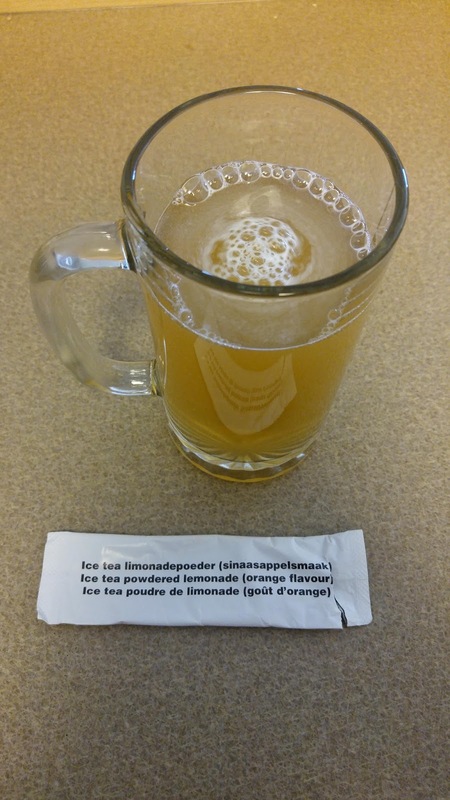 Since Canada has two official languages, all the labels are in English and French. 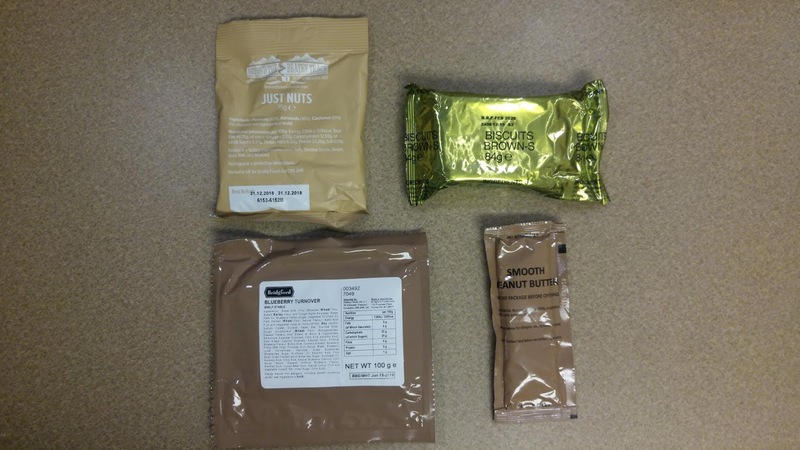 The meal items are mostly packaged for the military, with a few accessory items and desserts of civilian origin. 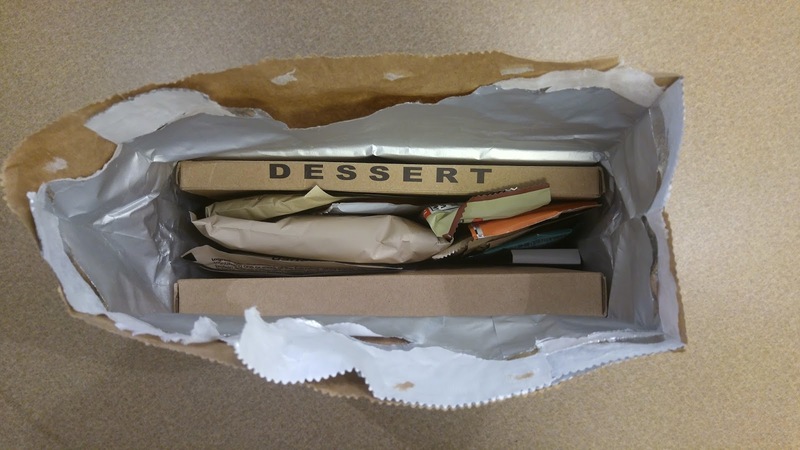 Main entrees and desserts come in flat cardboard boxes, and other items come in light brown plastic pouches. 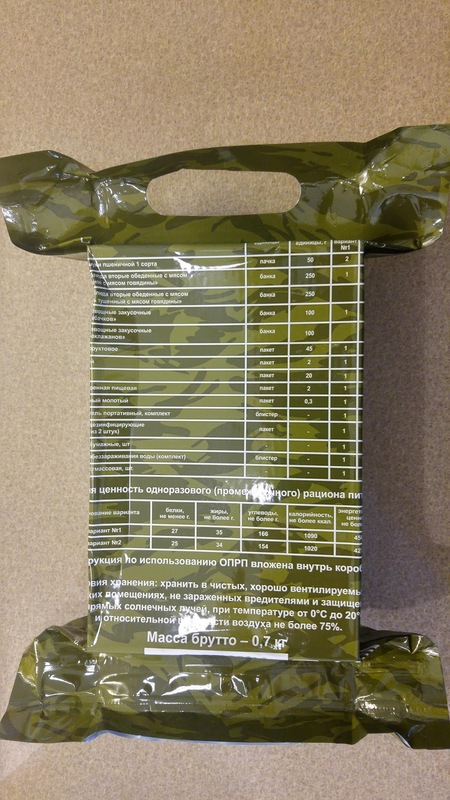 As you can see from the hamburger packaging, Canadian soldiers are particularly tough because PAIN IS AN INGREDIENT. 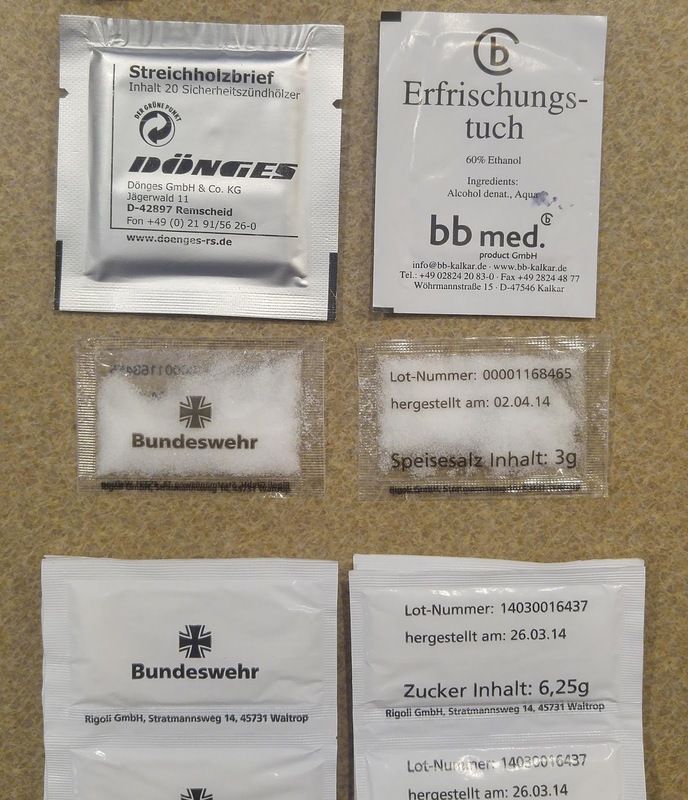 Enjoy your PAIN HAMBURGER! 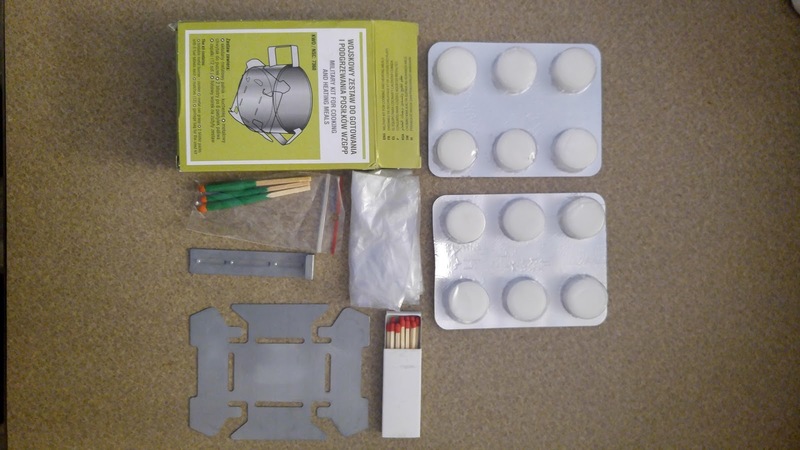 Canadian IMPs do not come with flameless ration heaters or miniature stoves since Coleman camping stoves and pressure cookers are used in the field to prepare hot food items. 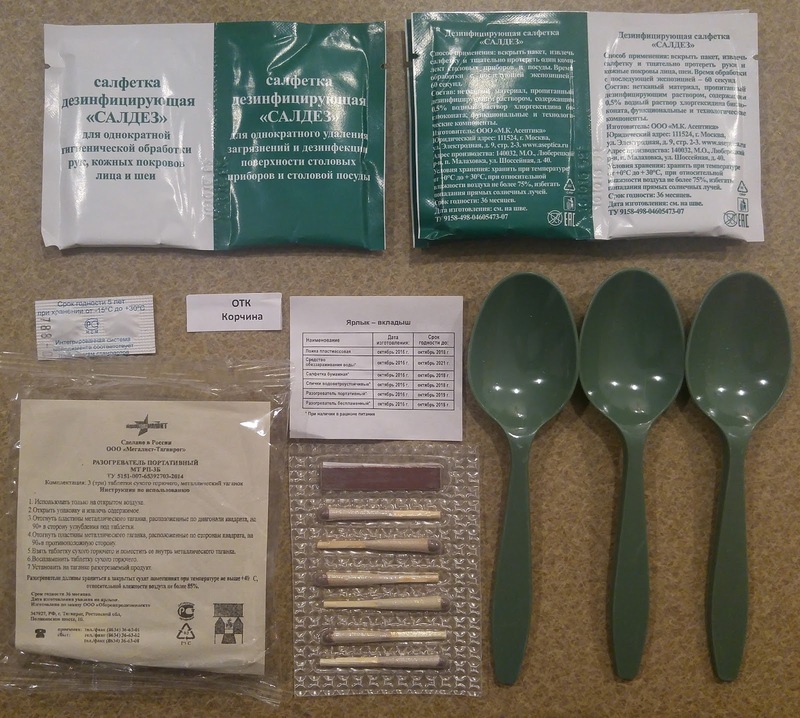 The Canadian IMP spoon is sought after in the field because it is the longest out of any military ration spoon, at eight inches long. 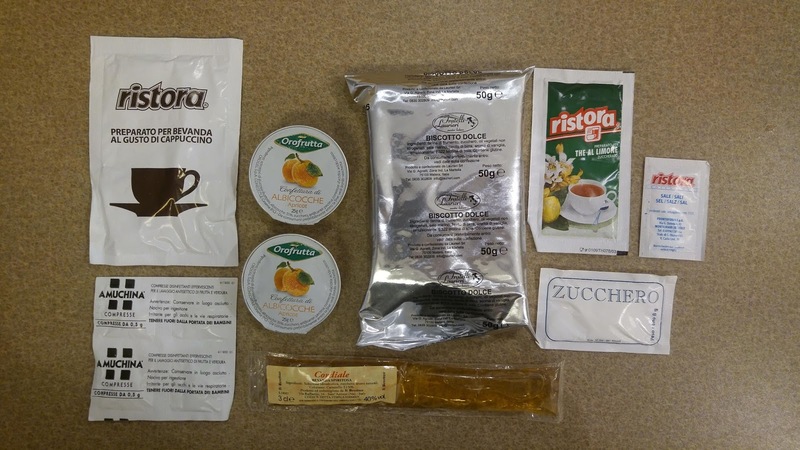 This is so it can reach the very bottom of the foil pouches that the main entrees and desserts come in. 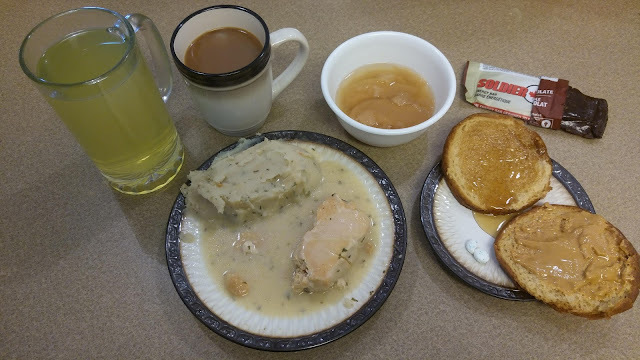 While it doesn't look the most appetizing, the mashed potatoes swelled up dramatically once mixed with hot water to create a thick, smooth texture that was not too heavy on the garlic and didn't have a powdery aftertaste. 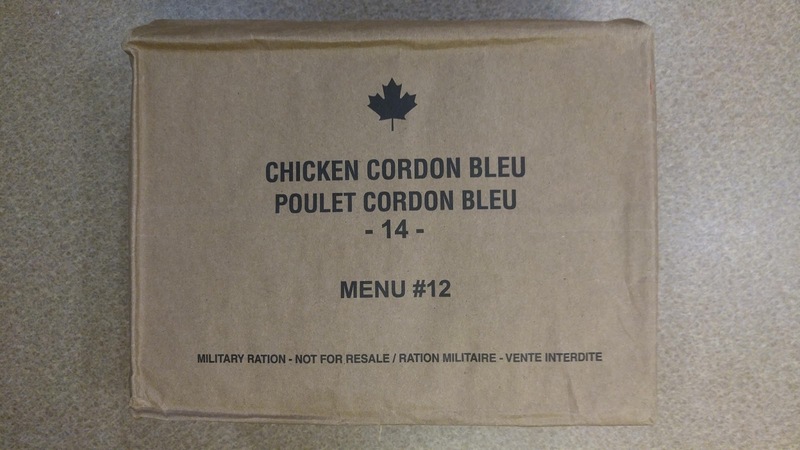 The chicken cordon bleu comes in a thick, very solid block, and was pretty dry - took some excavating to break it down. 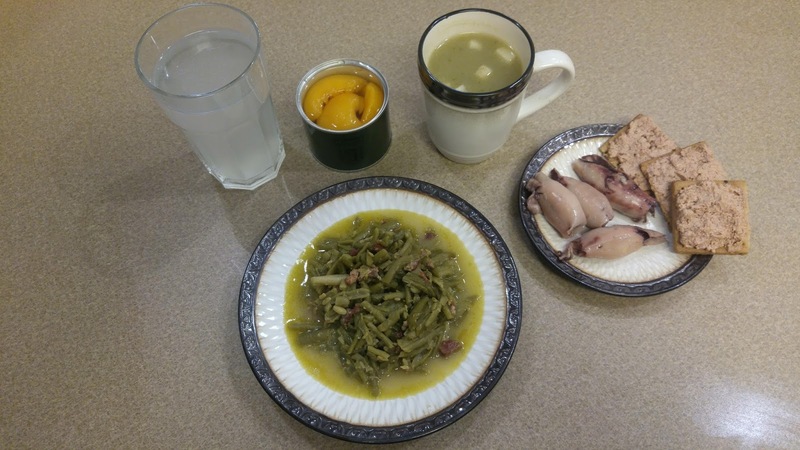 The chicken was kind of bland, but it's ultimately a great source of lean protein. 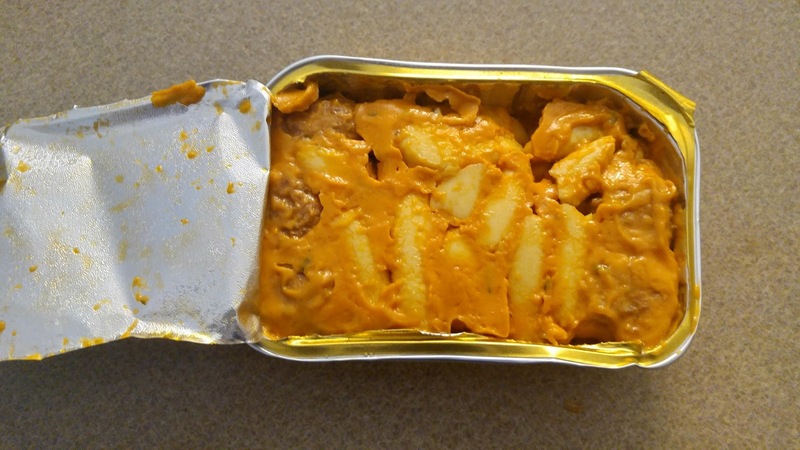 The dish is saved by the copious amount of rich, creamy sauce that it comes packed in - there's only about half of what was in the packet in the above picture. 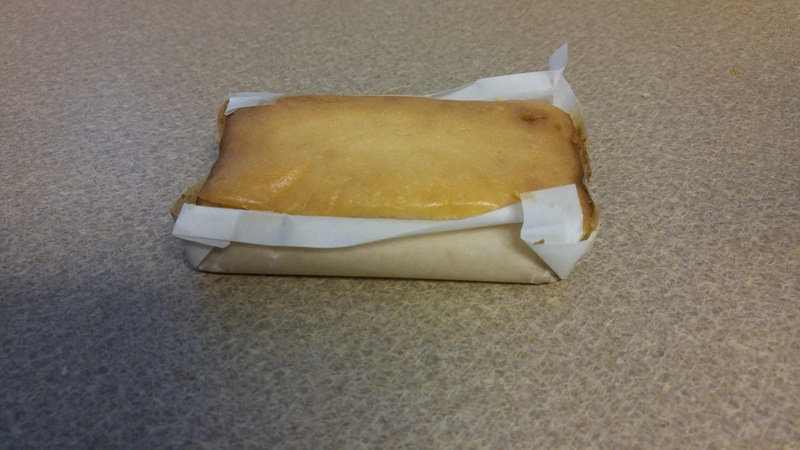 The hamburger bun, like the notorious IMP bread in a bag, comes out quite dry and a little stale. There are two ways to make the bread more palatable: either by toasting it, or boiling it in the bag along with the main entrees. This does rehydrate it slightly. 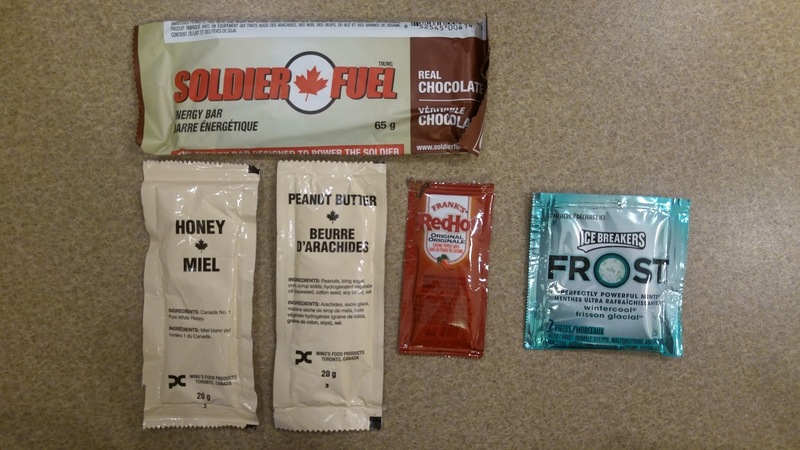 The soldier fuel bar is really good - soft and chewy, almost like toffee, with a mild crisped rice crunch. 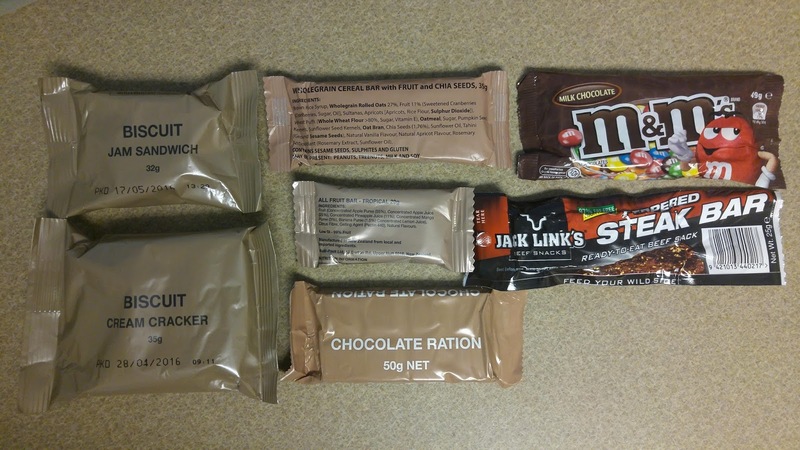 Better than most ration chocolate bars I've had. 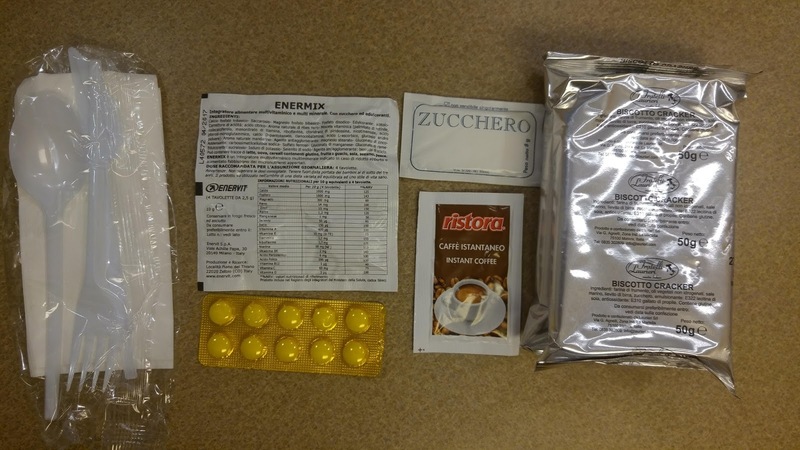 The espresso had a very bold, strong flavor to it - more so than most powdered or freeze-dried coffee. 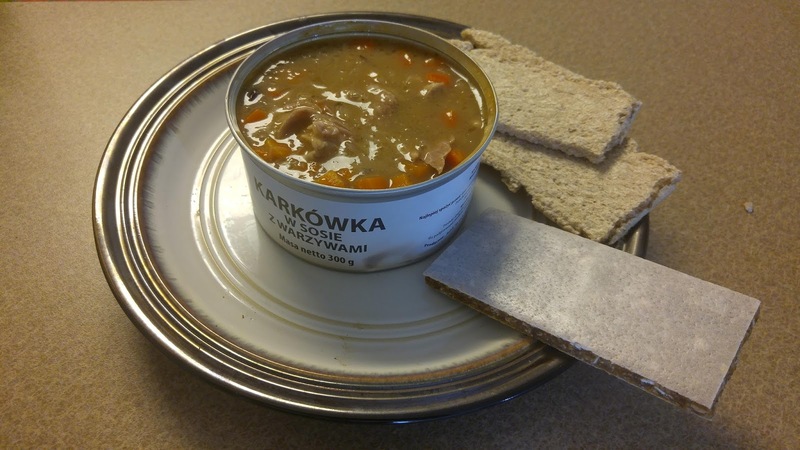 The Lithuanian 'sausasis maisto davinys' (dry food ration) is a single meal ration. 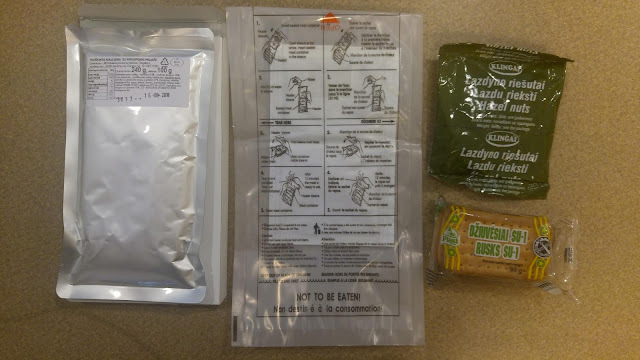 Based on the US MRE, it consists of a single main entree plus accessories, and is packed in a dark green, thick plastic bag. 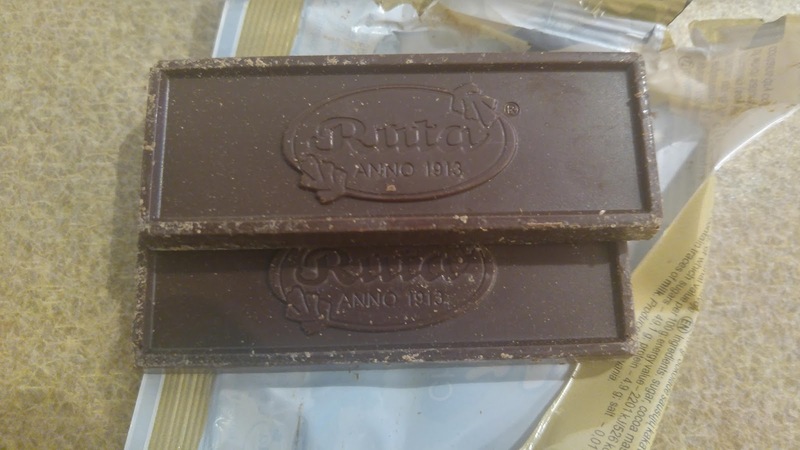 The chocolate was a really nice finish to the meal - good quality, smooth texture, melts in your mouth. 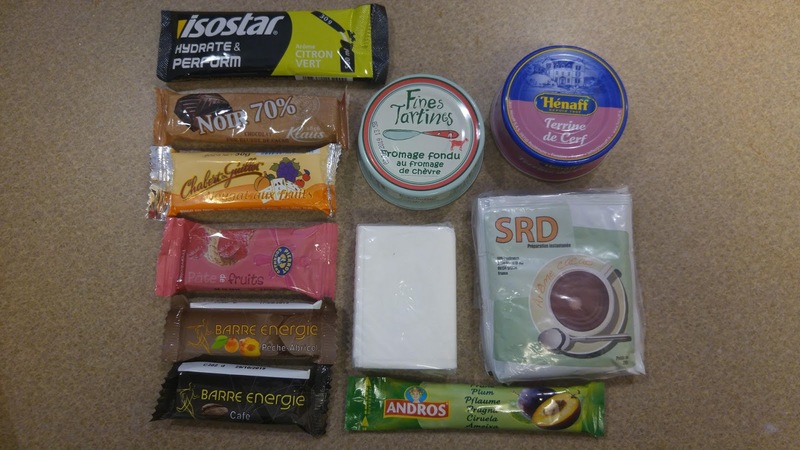 The Individualnovo Ratsiona Pitanee, or "Individual Ration Pack", comes primarily in a 24-hour pack. 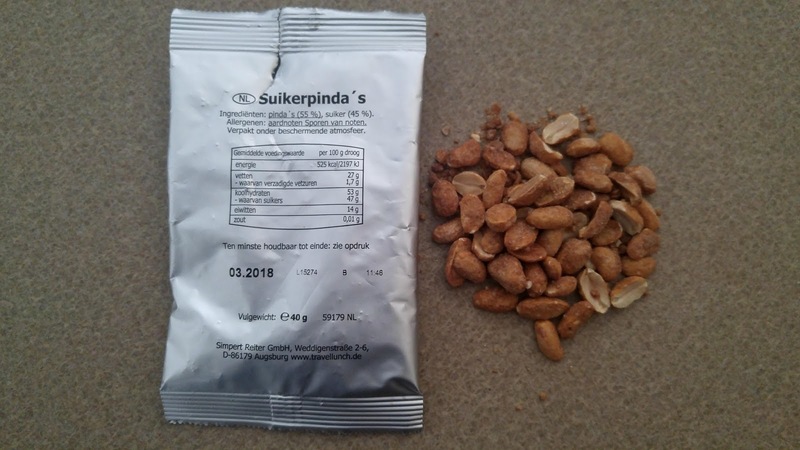 There are several variants for the outer packaging, depending on whom the ration is for, but the contents are generally the same. 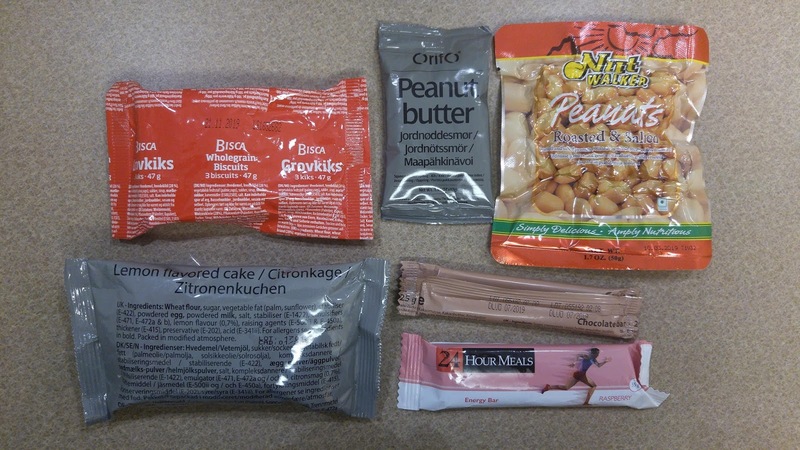 Most come packed in a cardboard box inside of a hard plastic pouch. 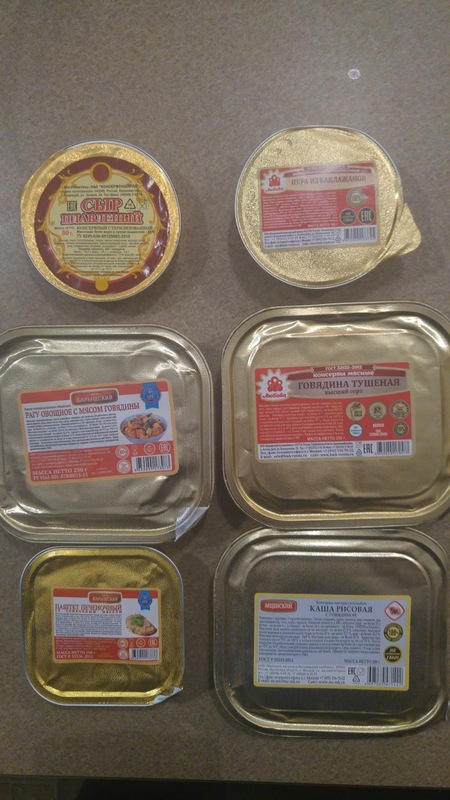 The main entrees and spreads come in aluminum foil packaging, sealed with peelable foil lids. 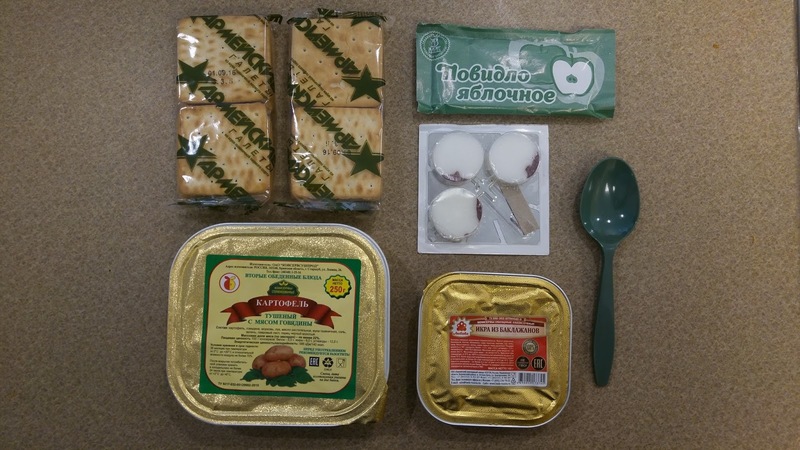 Here is the breakfast portion of the ration: Rice porridge with beef, plum fruit bar, crackers with vegetable spread and apple jam. 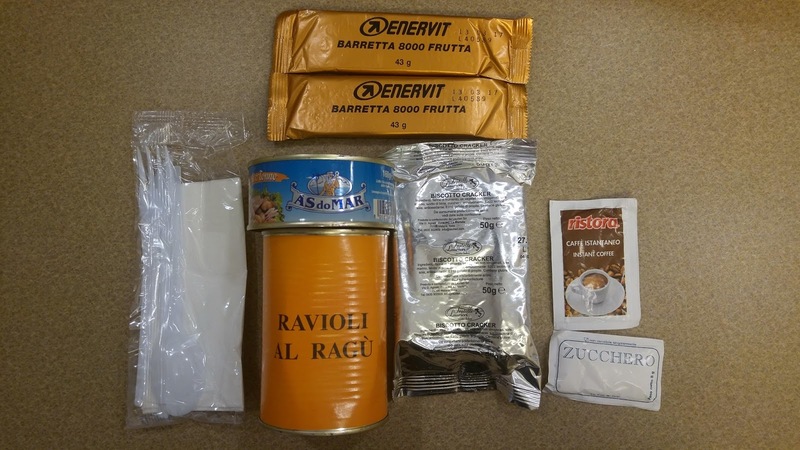 Italian combat rations are notoriously hard to come by (and thus, are very expensive). 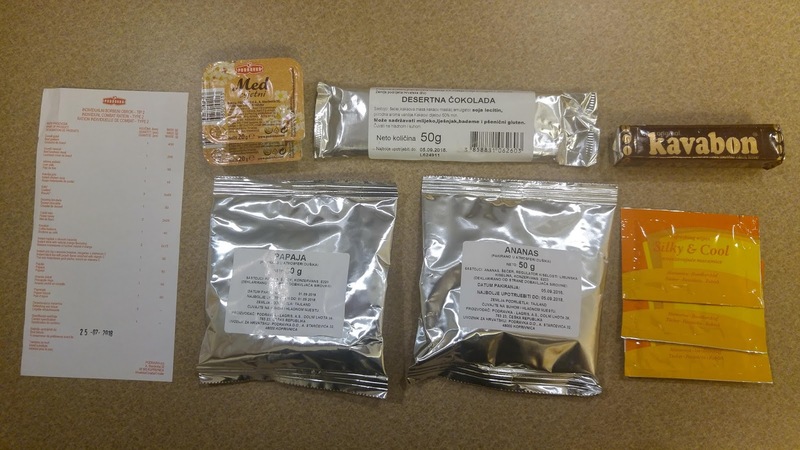 There are currently seven menus, or Modules, each of which comes with three components for breakfast, lunch and dinner. 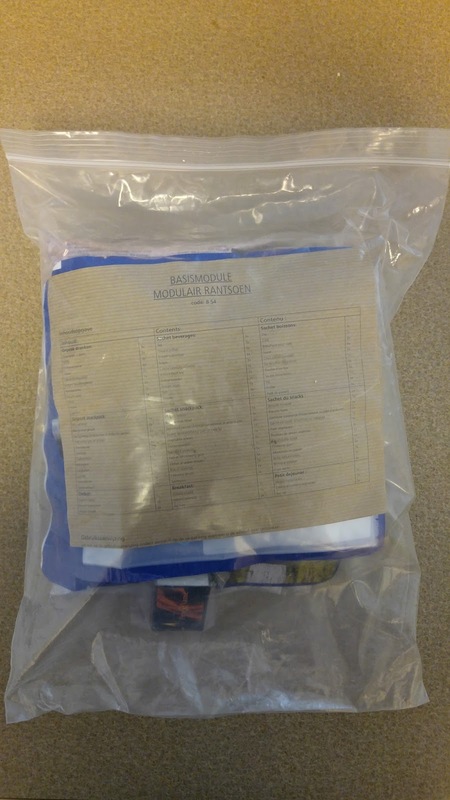 Modules B and F and extremely rare and highly prized because they contain something that no other ration in the world does. 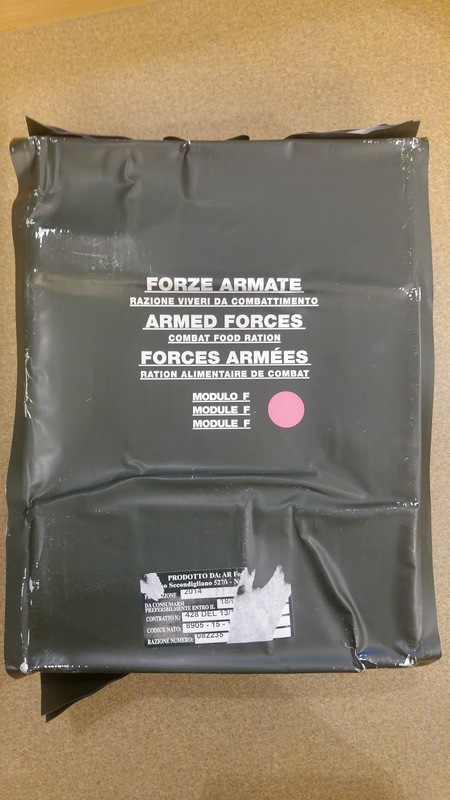 The Italian 24-hour ration comes in a foil-lined plastic pouch, which is marked with the Module letter on the front. 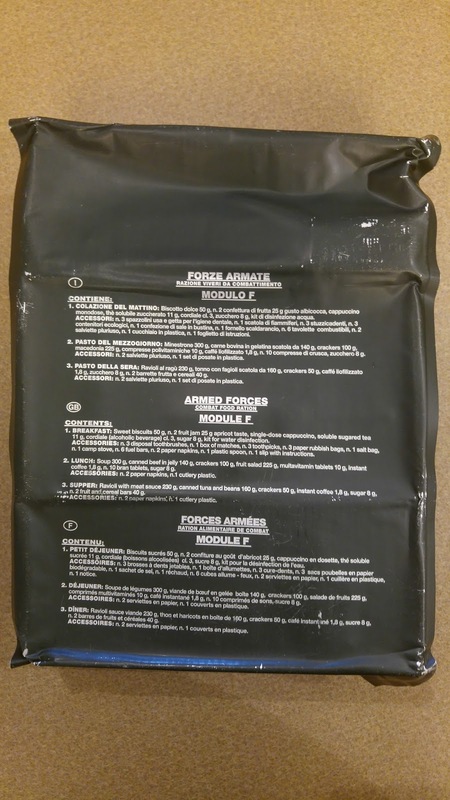 Each module also has a corresponding color - Module F is Pink. 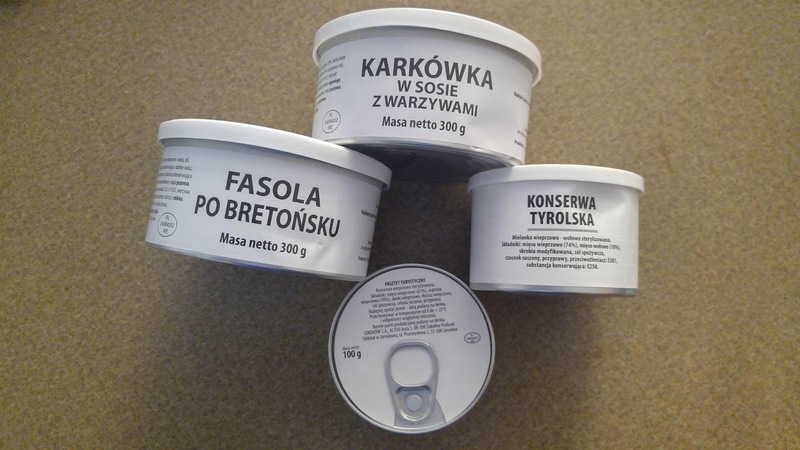 The labeling on the exterior and interior packaging are in Italian, English and French. 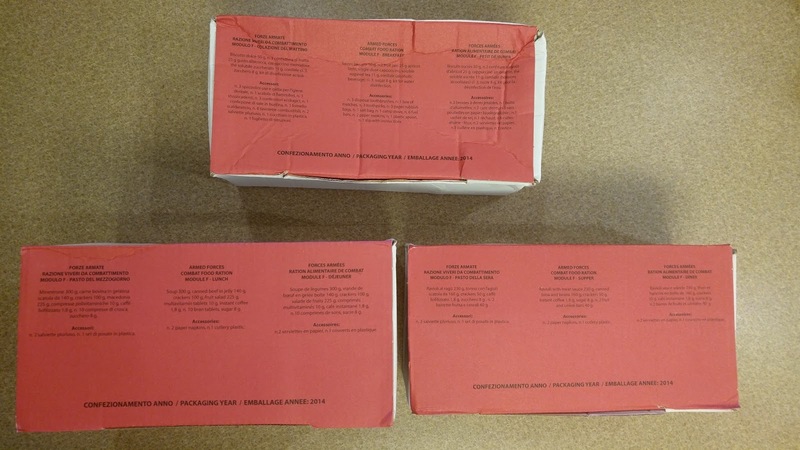 Inside, the individual meals are packaged in white cardboard boxes with red lids outlining the contained items. 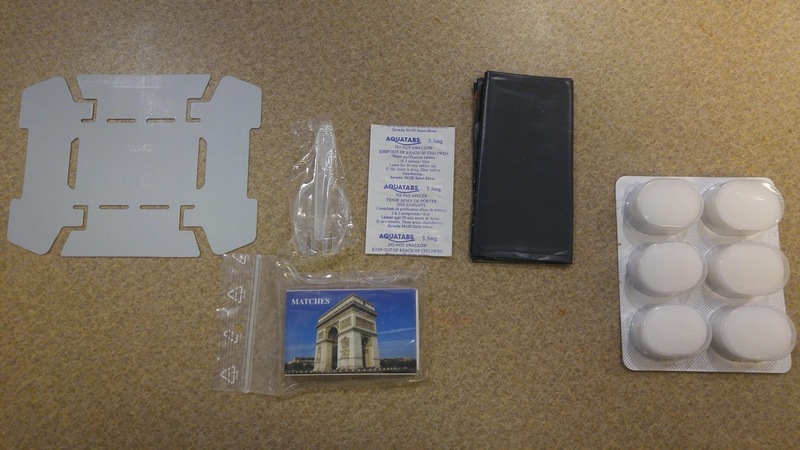 The accessory pack is included in the breakfast box. 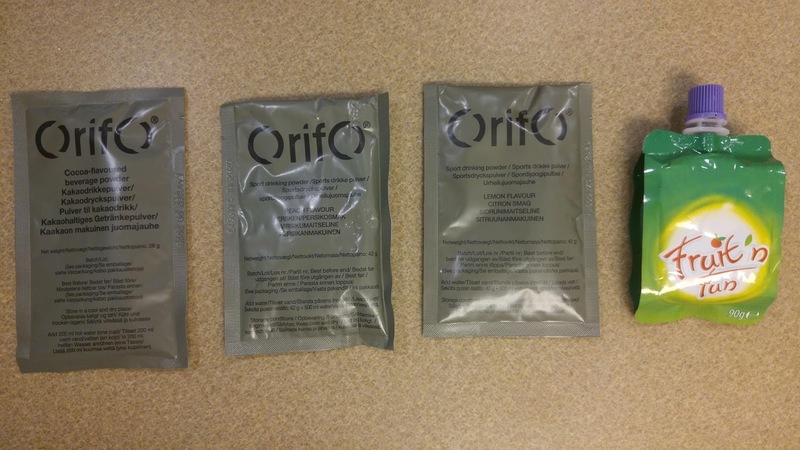 Green outer pouch, red and white on the inside... subtly patriotic. 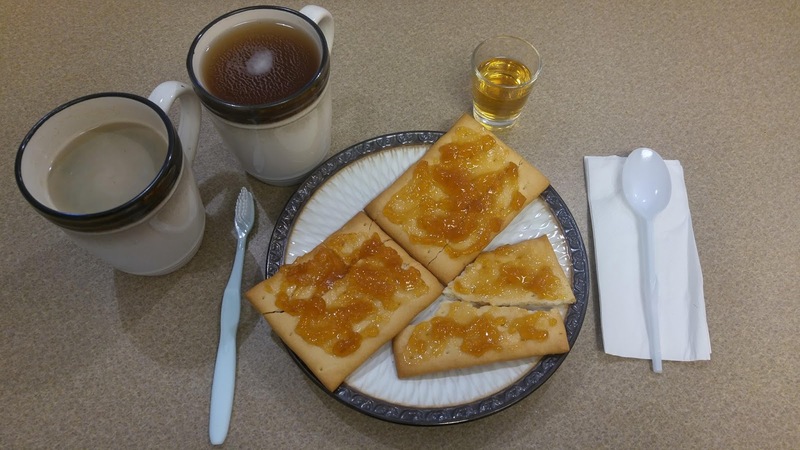 The breakfast meal is mostly liquid: cappuccino, lemon tea, cordial, and crackers with apricot jam. Lunchtime! 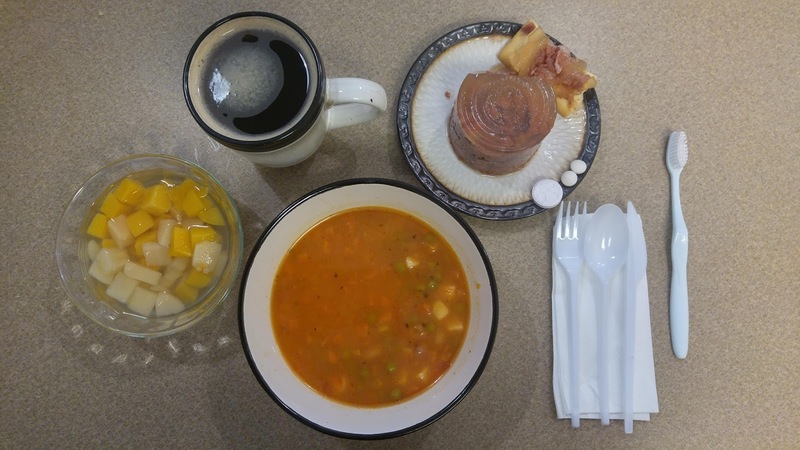 Minestrone soup, fruit salad, jellied beef and crackers, multivitamin and fiber tablets, coffee. 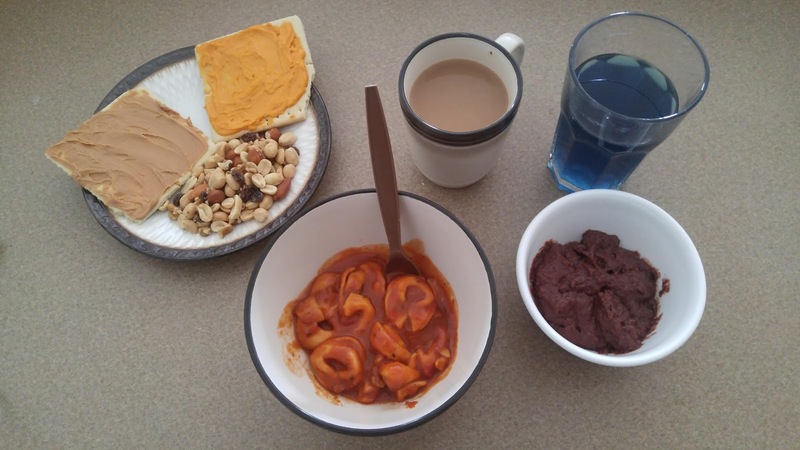 A nice spread for the last meal of the day: ravioli, tuna and beans with crackers, energy bars and coffee. 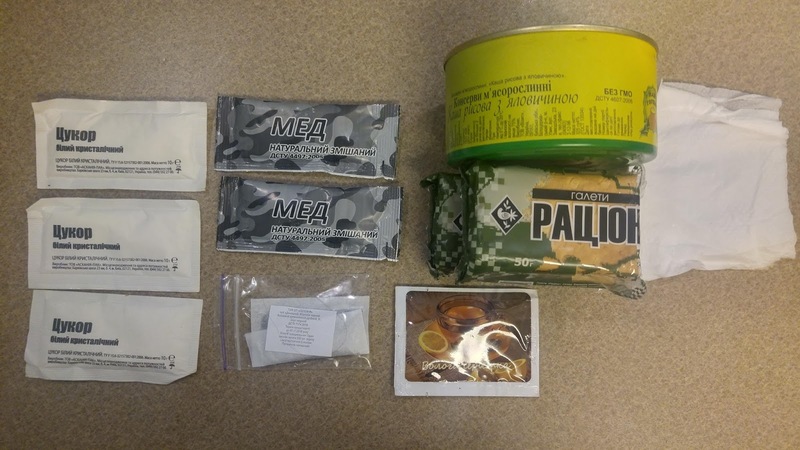 The Swedish military ration is a 24-hour pack, with sufficient meal options for breakfast, lunch and dinner as well as a few snacks. 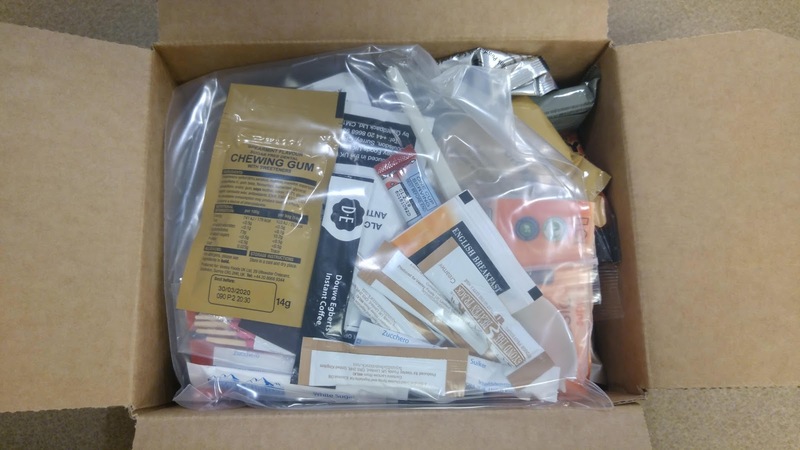 It comes in a clear plastic ziploc bag, which features an inner pouch wall so that unused items can remain on one side, and used packaging/garbage can be put on the other for later disposal. 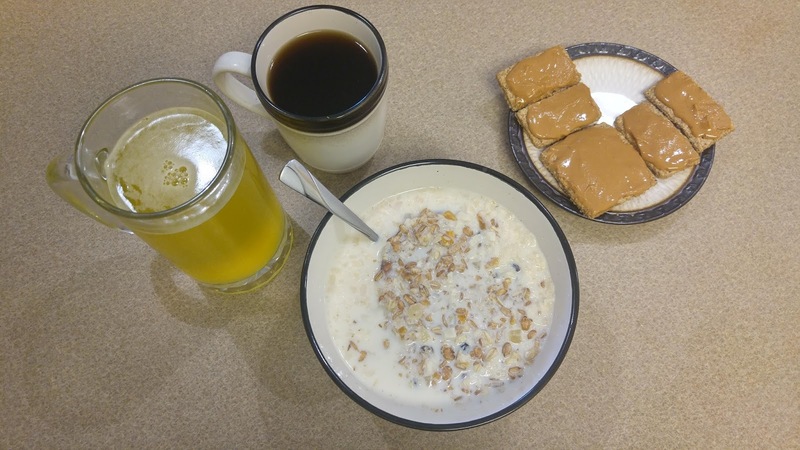 Let's start with breakfast! 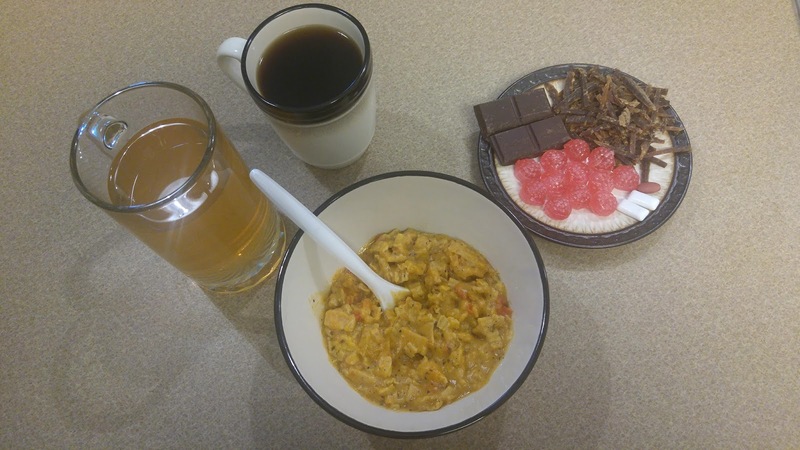 Muesli with fruit in milk, crackers with peanut butter, black coffee, and pineapple drink. 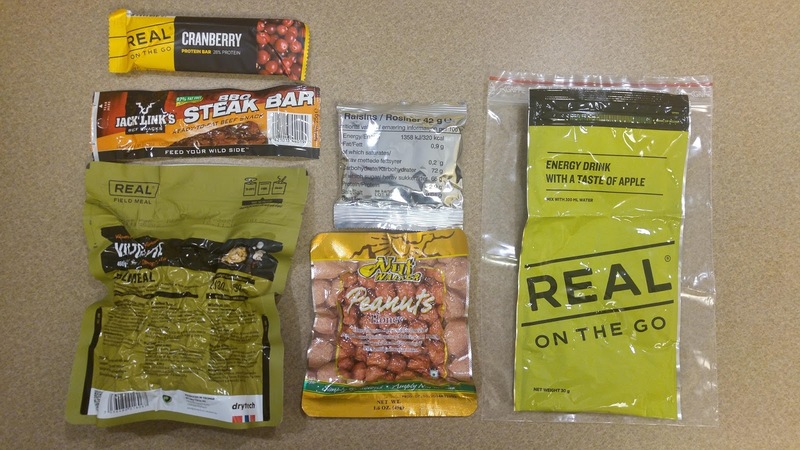 For lunch, the chicken curry, peanuts, raspberry energy bar, apple isotonic, gum and hard candy. 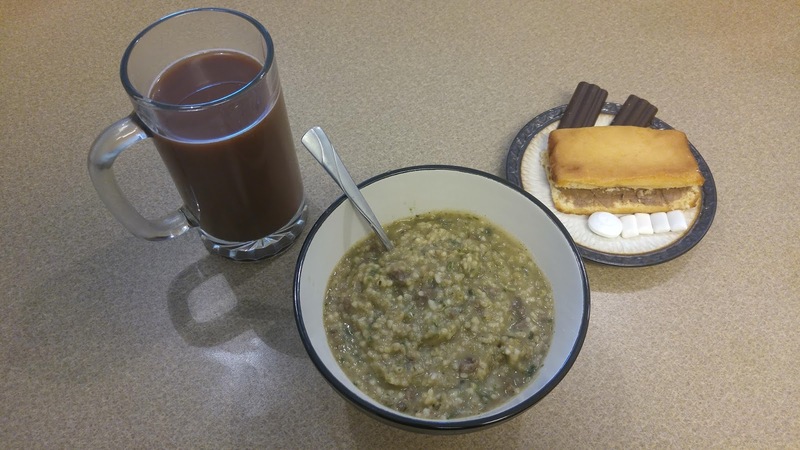 Finally, for supper, the wilderness stew with mocha drink, lemon cake and hazelnut spread, dark chocolate, chewing gum and hard candy. 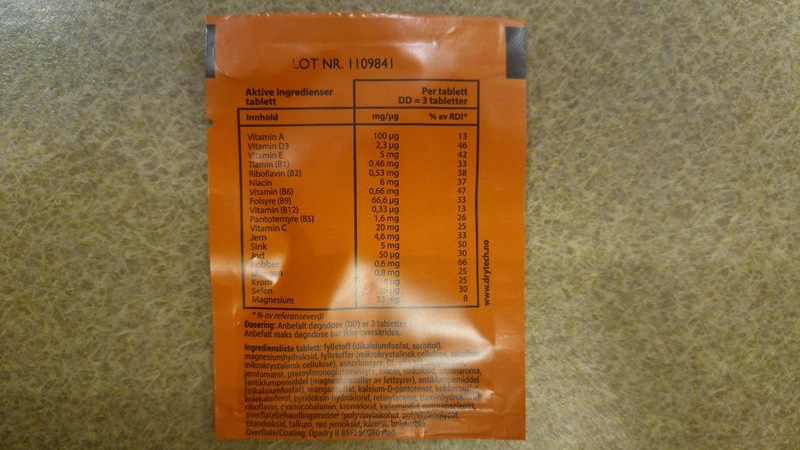 The Danish military ration comes in a square cardboard box, and contains sufficient food items for a 24 hour period. 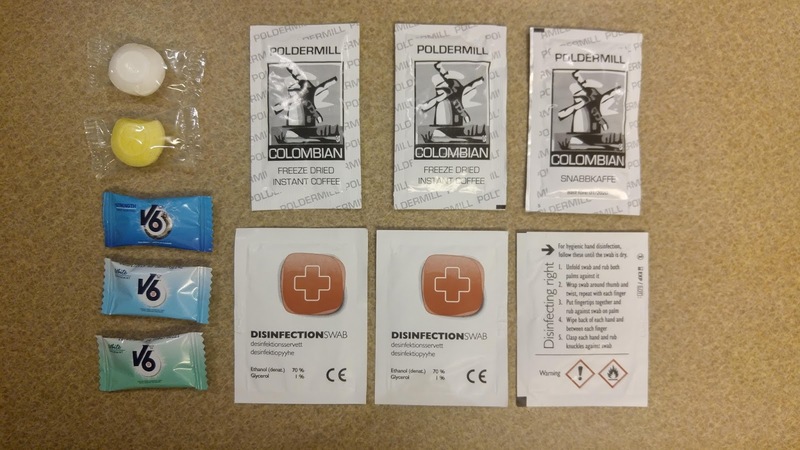 The diamond-shaped symbol with a Y on the top is for an international shipping requirement, and denotes a 'Limited Quantity Hazard', meaning it can only be shipped in limited quantities. 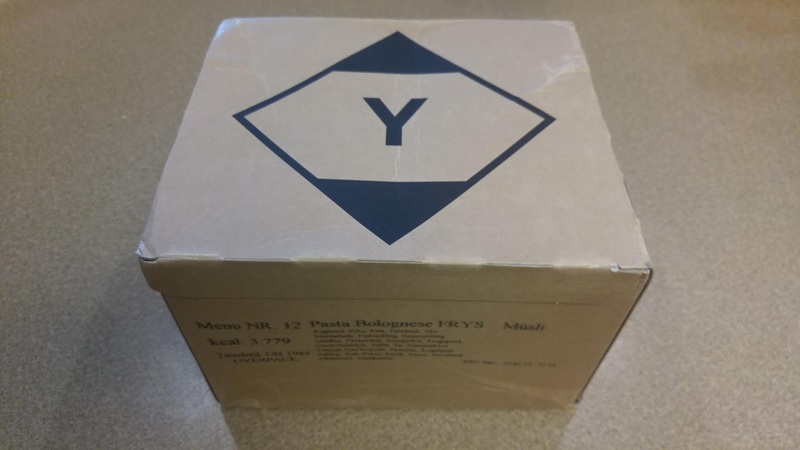 The Y symbol means that it is safe for air transit. 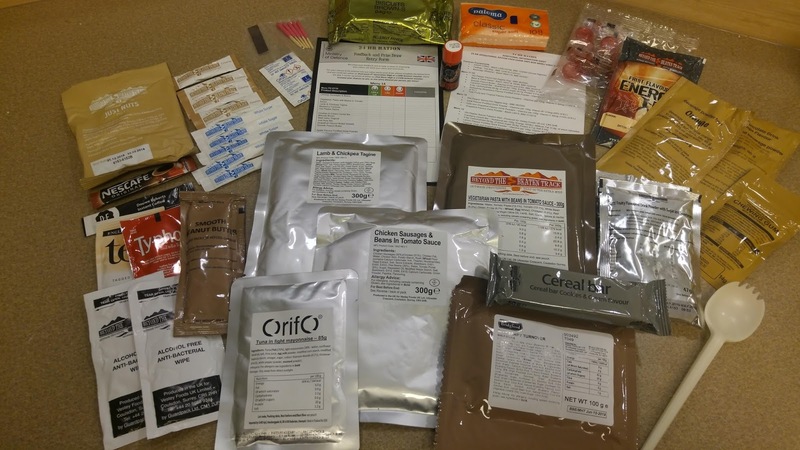 This is a requirement because some of their MRE's contain chemical heaters and matches. 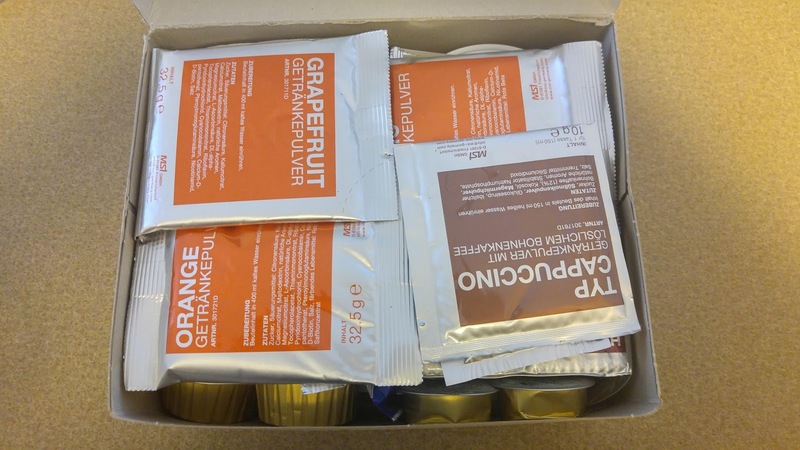 A very good accessory pack is included in the Danish ration! 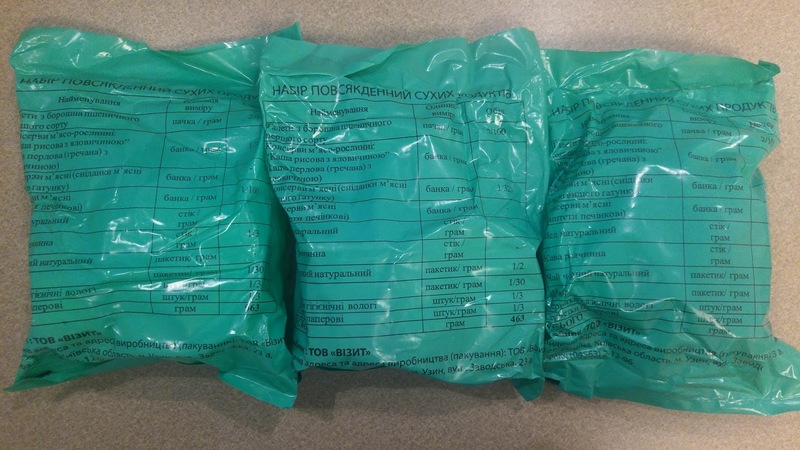 Not pictured is the big ziploc bag they were packaged in, which appeared to be Russian, since it had the three white stripes of Adidas. 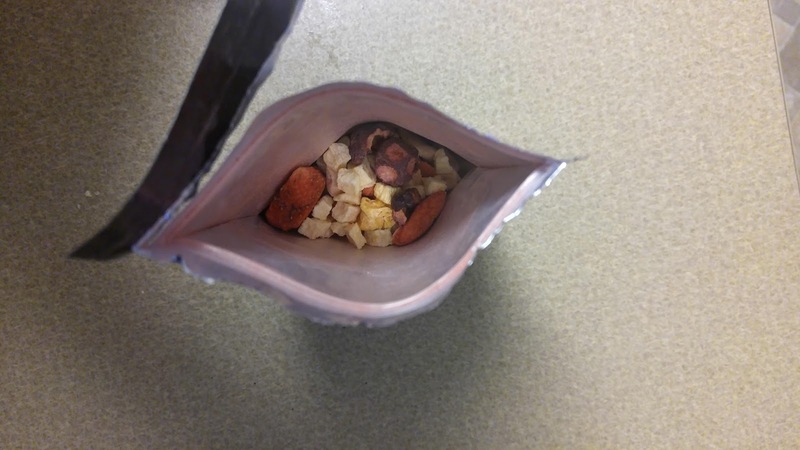 Starting with breakfast, here is a look at the inside of one of the freeze-dried pouches. 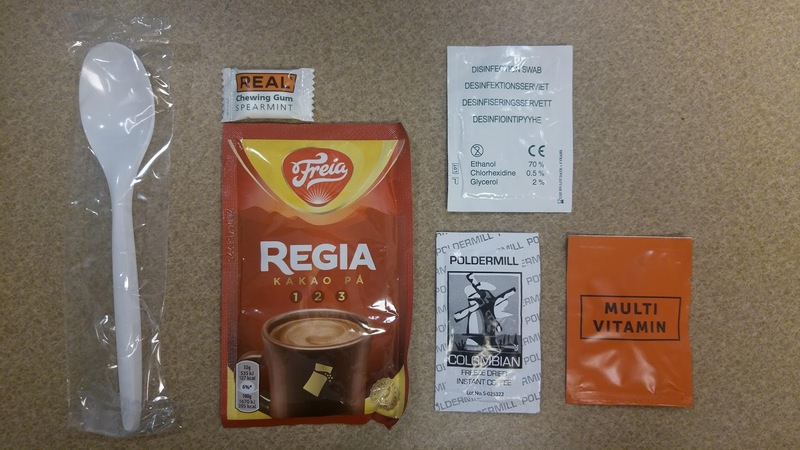 Like the Swedish ration, the inside of the pouches are marked with lines to show how much water to add. 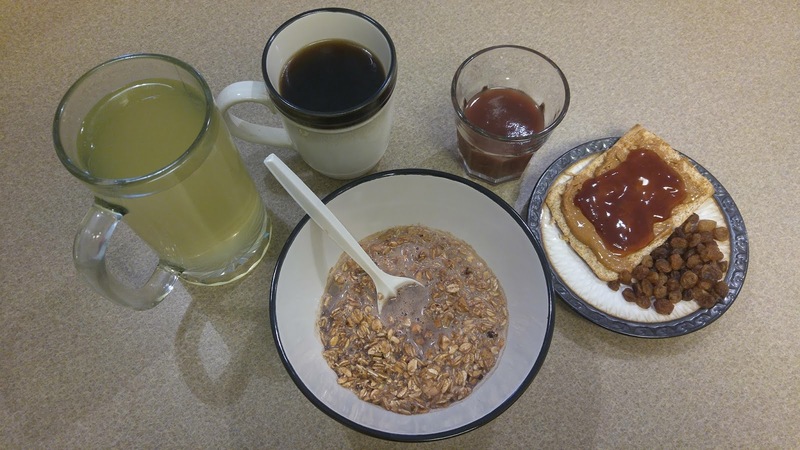 Breakfast: Chocolate muesli, fruit puree, peanut butter and strawberry jam on bread, sultana raisins, lemon drink and coffee. Lunch: Tuna on bread, blackcurrant jam and peanut butter on bread, farmhouse and Brussels pate on biscuits, fruit bites, and hot chocolate. 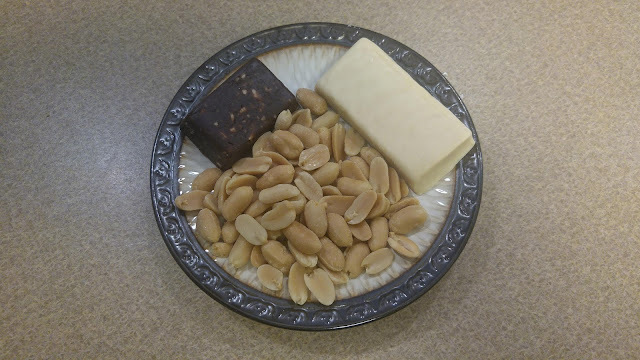 Mid-afternoon snack: Fruit and nut bar, raspberry protein bar, peanuts. 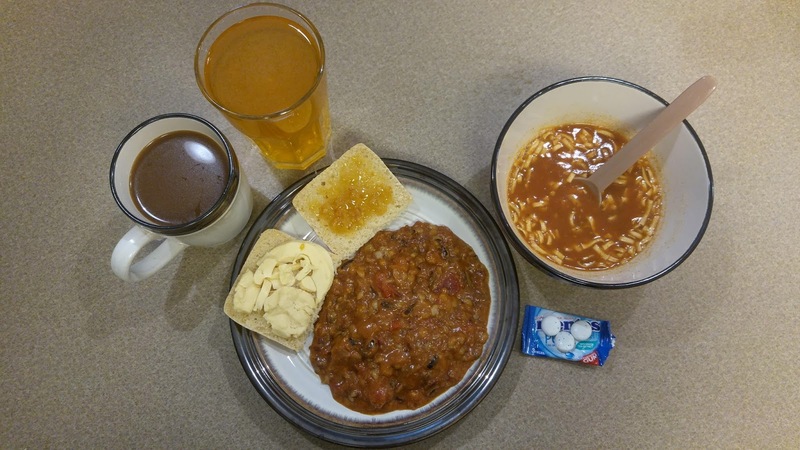 Supper: Pasta Bolognese, mackerel in tomato sauce on bread, dark chocolate and chewing gum, black tea, and peach drink. The CR1M (Combat Ration, One Man) is a 24-hour ration pack, and comes in a sealed, clear plastic bag. 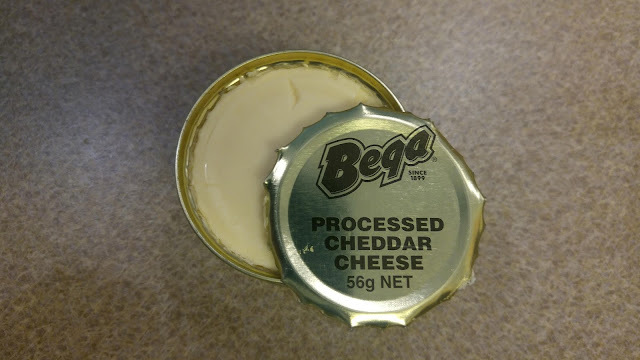 There are currently eight menus, lettered A-H, making this menu C.
Here is the notorious Bega processed cheese. 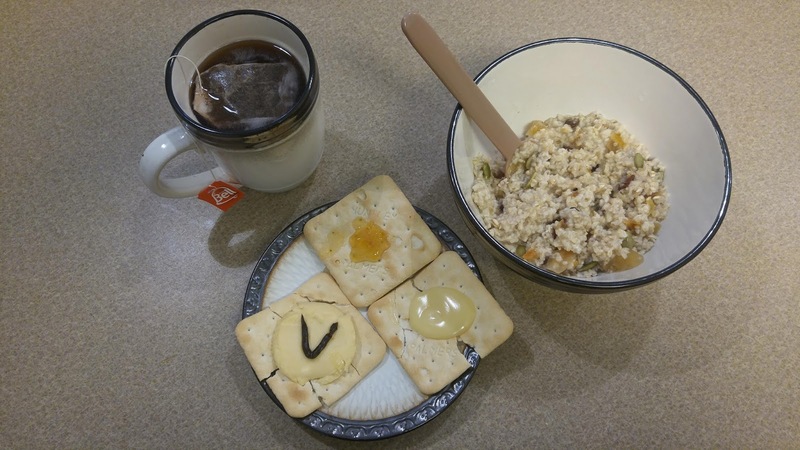 Breakfast: Muesli with fruit and nuts, crackers with spreads, tea. 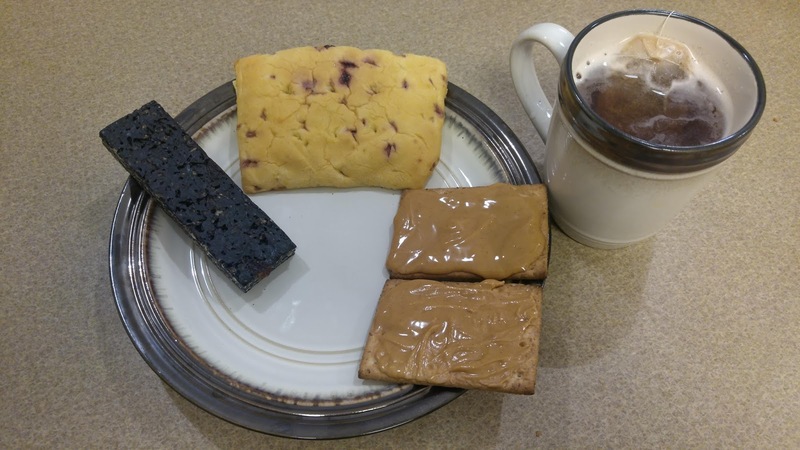 Second breakfast: Jam sandwiches, Tropical fruit bar, tea with condensed milk. 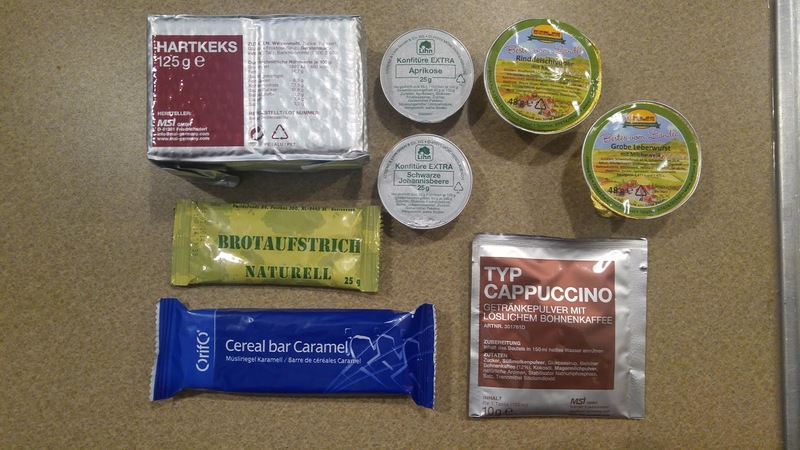 Lunch: Chicken with wild rice, Bread with cheese and marmalade, chicken soup, coffee, tropical sports drink, chewing gum. 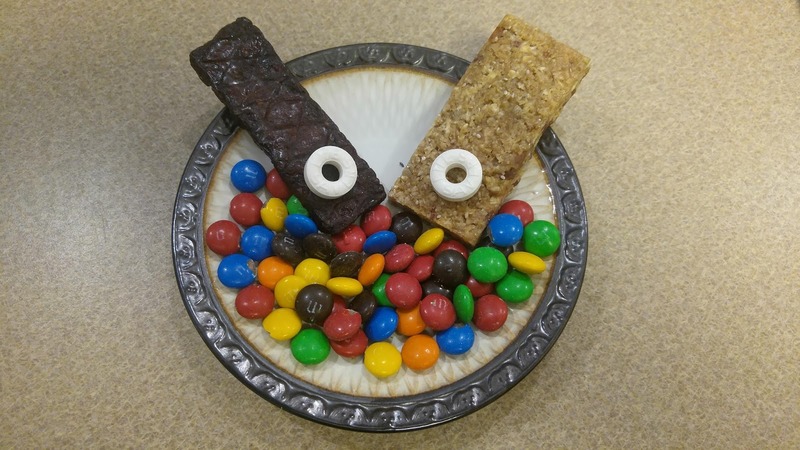 Afternoon snack: Beef steak bar, cereal bar, M&Ms, lifesavers. 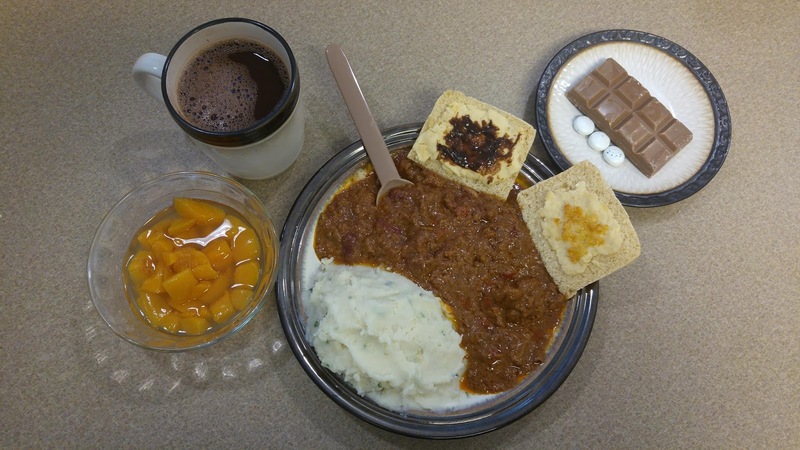 Supper: Chili con carne, bread with cheese and spreads, mashed potatoes, diced peaches, chocolate and mints, coffee. 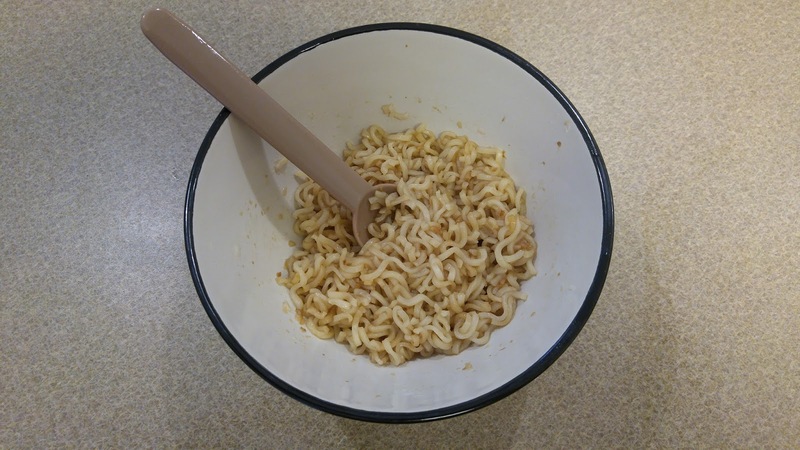 Midnight snack: Mi Goreng noodles. 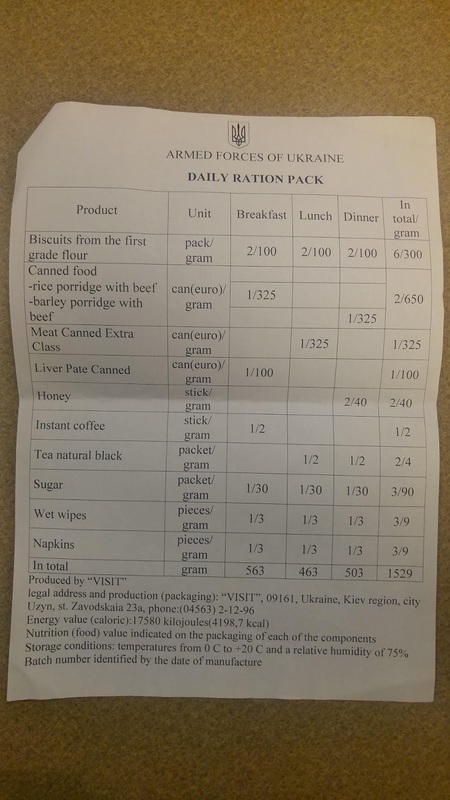 The ration also comes with a very detailed breakdown of what is in each ration, their ingredients, and some nutritional information. 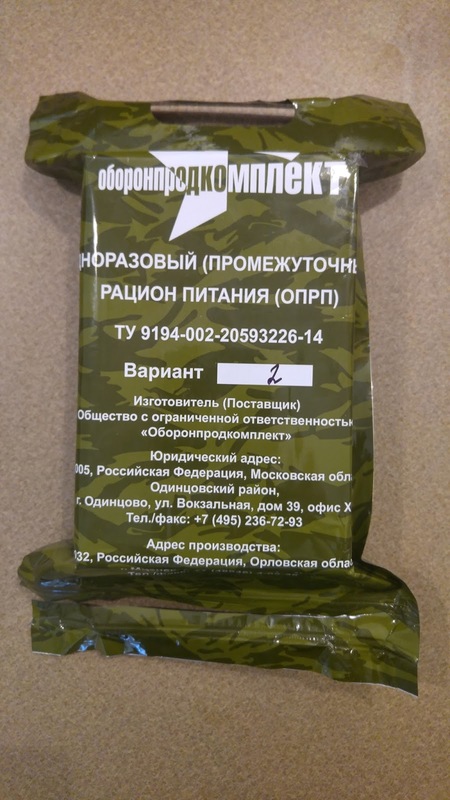 This one is a single meal ration, which comes in a black plastic pouch with the label on the side in Latvian and English. 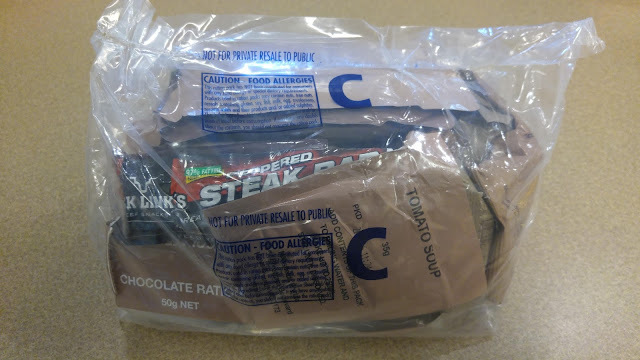 The plastic is a bit thinner than most ration pouches, comparable to a sturdy garbage bag. 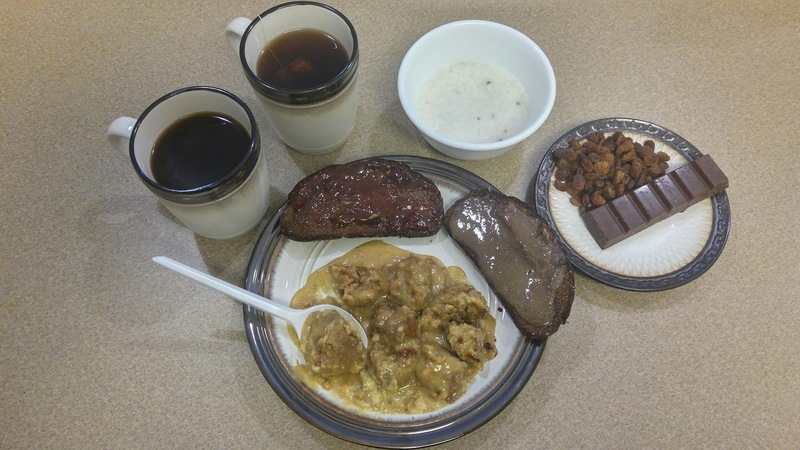 One Latvian dinner: Beef liver in cream sauce, raisins and chocolate, rice pudding, coffee and tea. 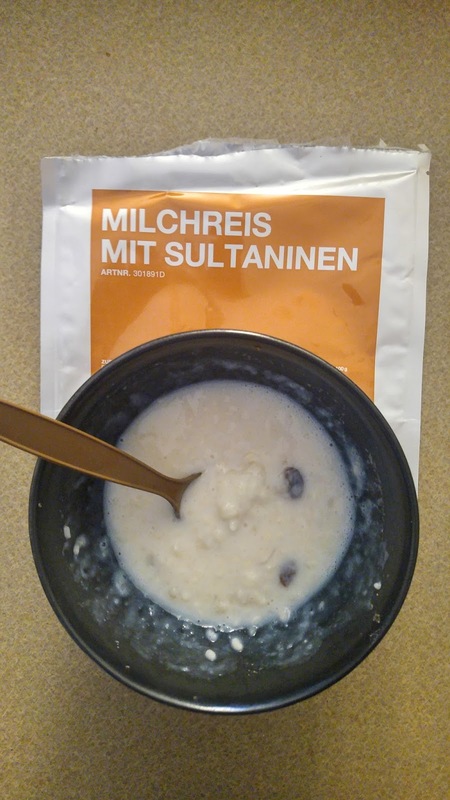 Lastly, for dessert: Rice pudding. 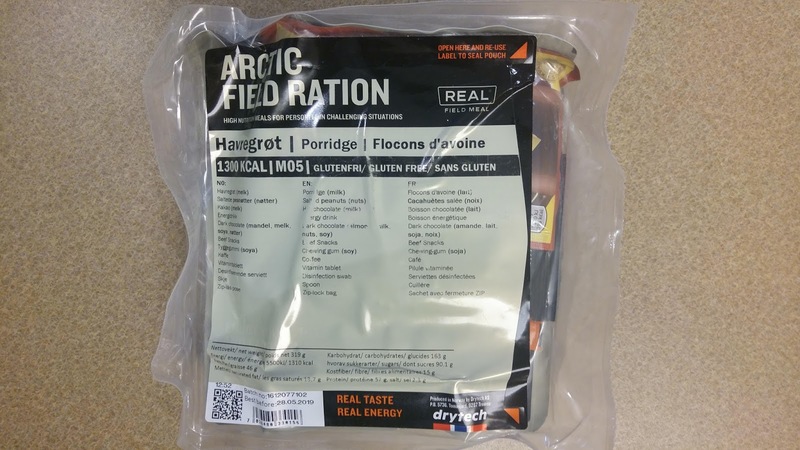 The Norwegian arctic field ration is packaged in a clear plastic retort pouch, with a list of items in Norwegian, English and French on the label. 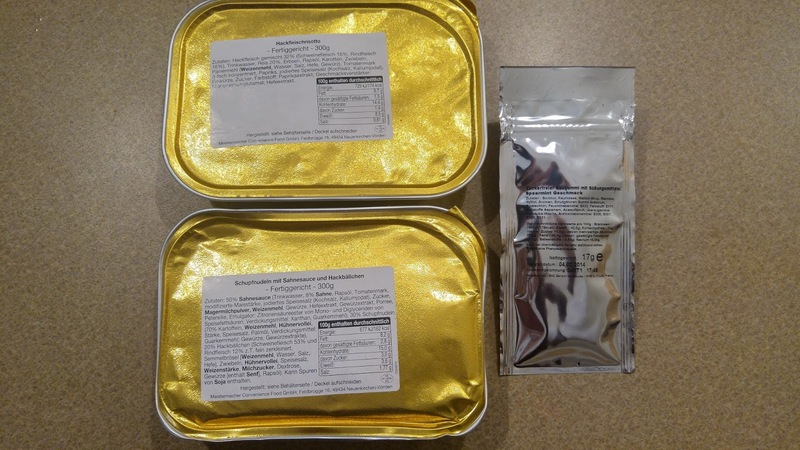 Each main entree is freeze-dried and requires only hot water for preparation. 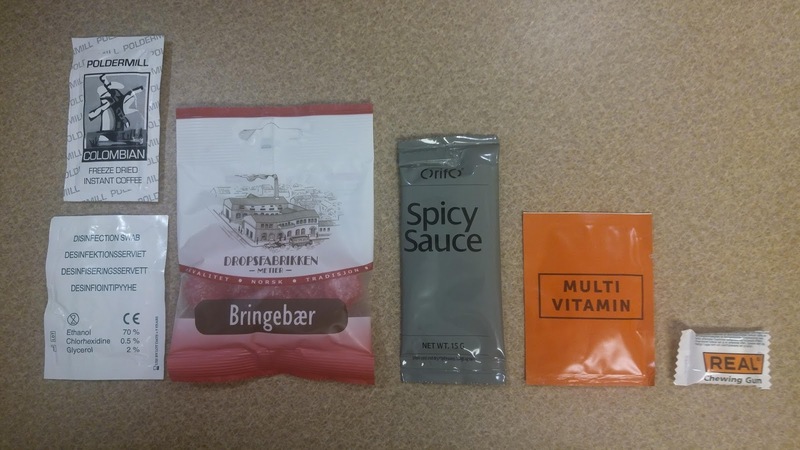 I think the multivitamin is a nice touch. 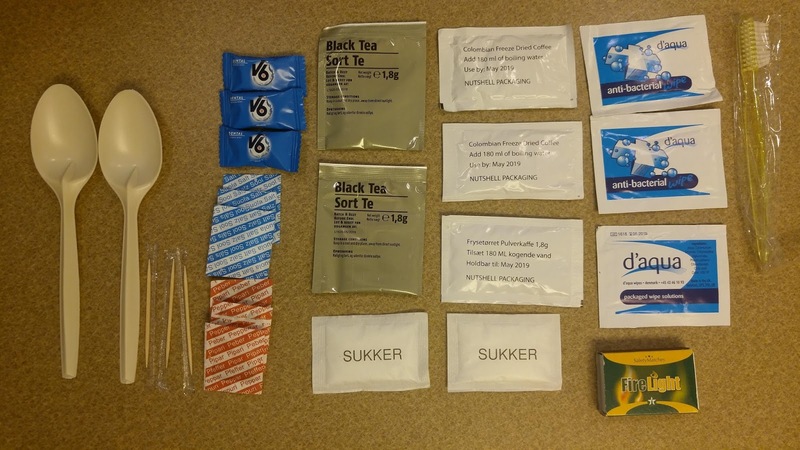 It's a simple way to promote a soldier's health in the field. 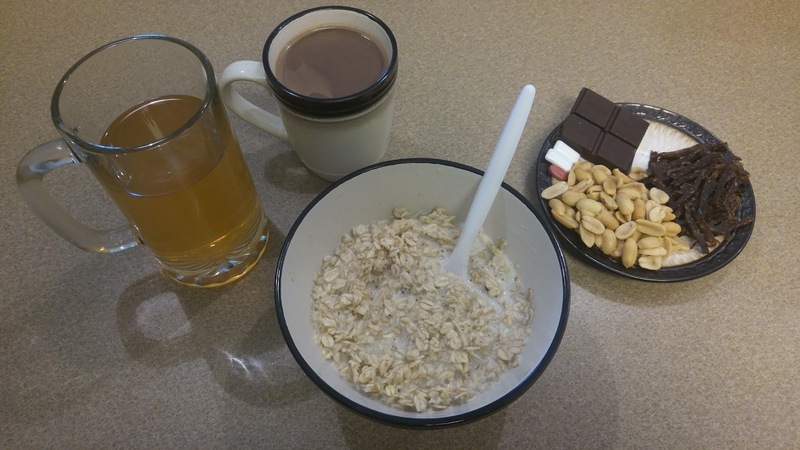 Breakfast: Porridge with milk, peanuts, beef jerky, dark chocolate, mocha, peach drink. 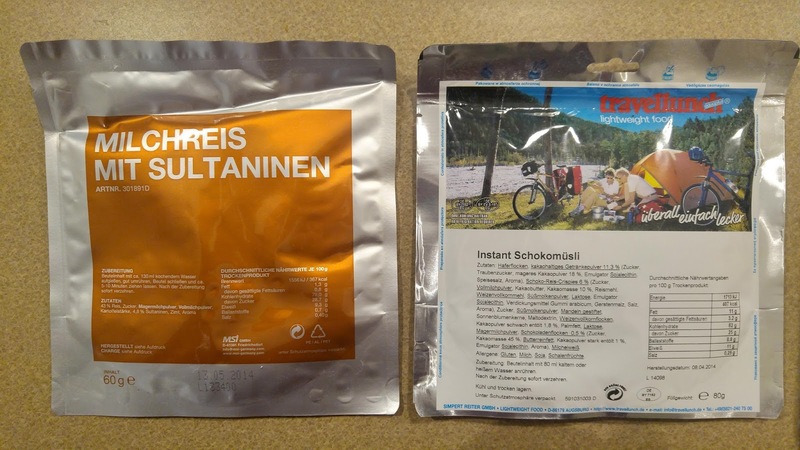 Here you can see the main entree in its freeze-dried form. 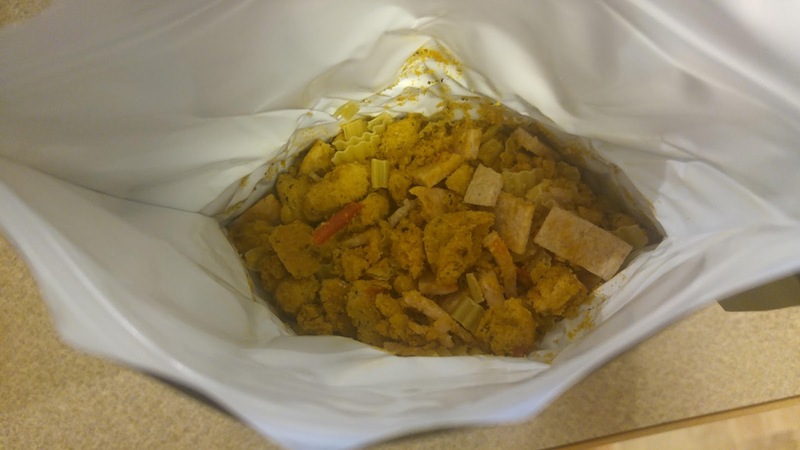 The square bits are the chicken, mixed in with mashed potatoes, celery, mustard, pasta bits, and various spices. 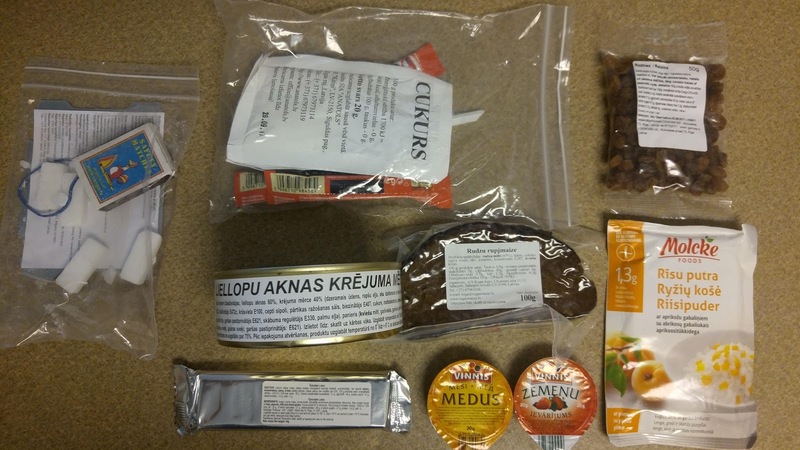 Lunch: Chicken in herbal sauce, beef jerky, dark chocolate, raspberry hard candies, coffee, peach drink. 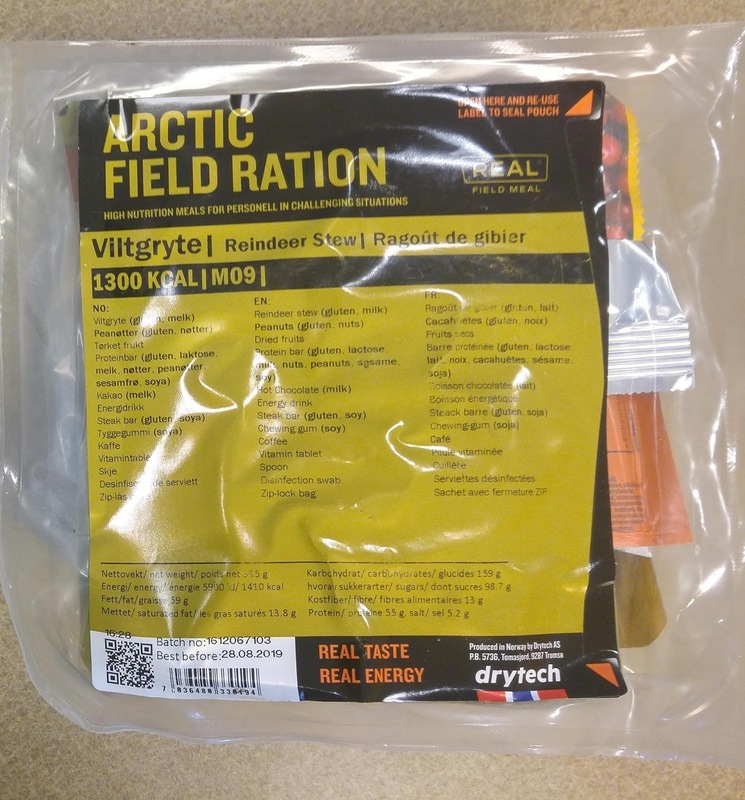 Reindeer stew, freeze-dried in the pouch. 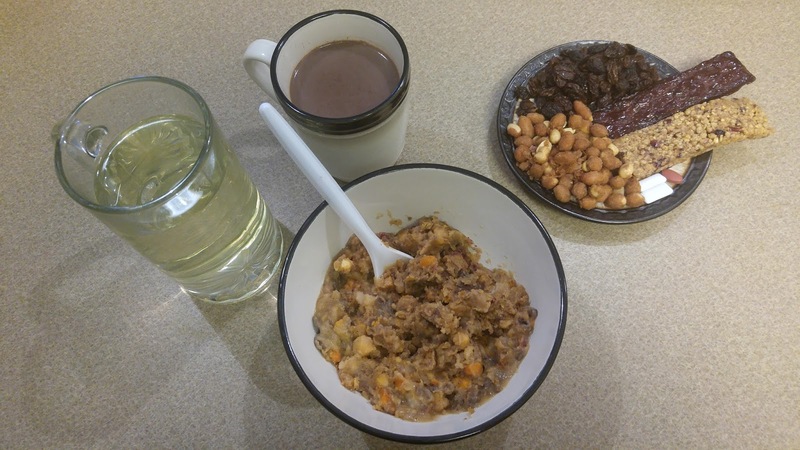 Supper: Reindeer stew, candied peanuts, raisins, steak bar, protein bar, mocha, apple drink. 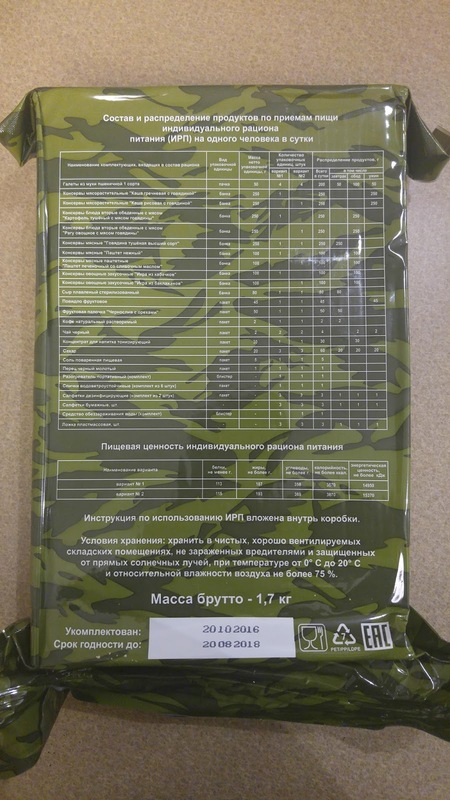 The 24hr ration pack comes in a light blue-green plastic retort pouch with the contents listed on its face. 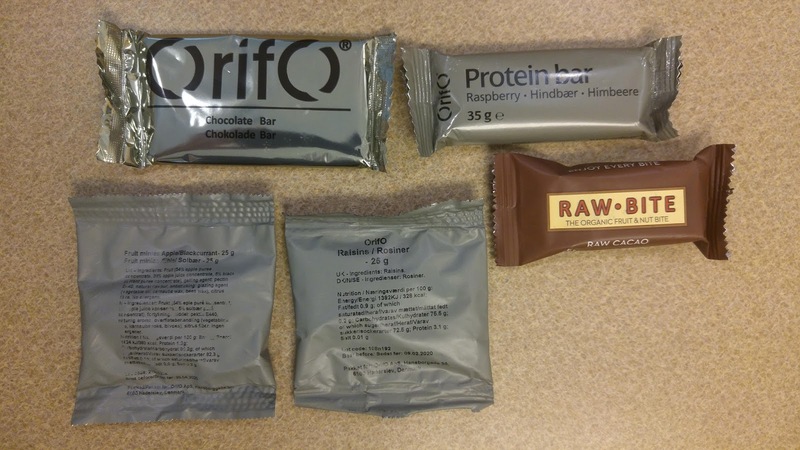 Inside the main pouch, the three meals are broken down into three smaller packages to keep the items conveniently separate. 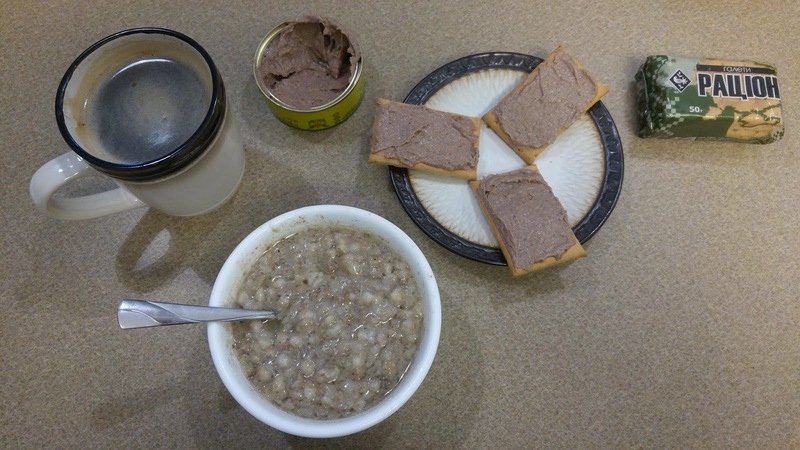 Breakfast: Barley porridge with beef, liver pate with crackers, coffee. 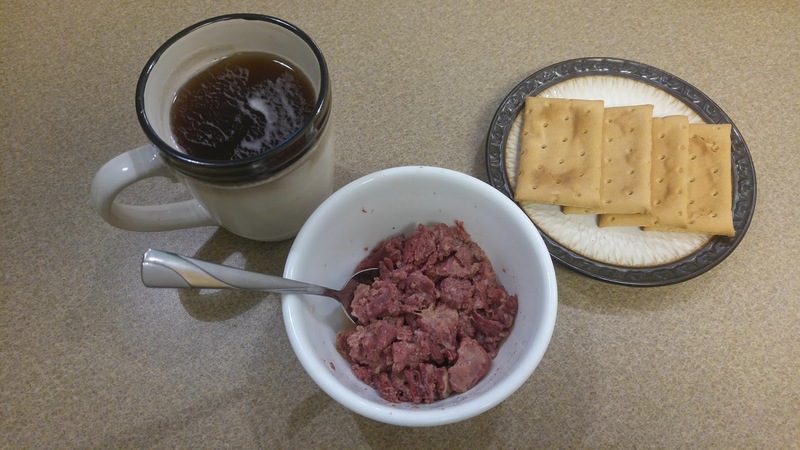 Lunch: Canned beef, crackers, black tea. 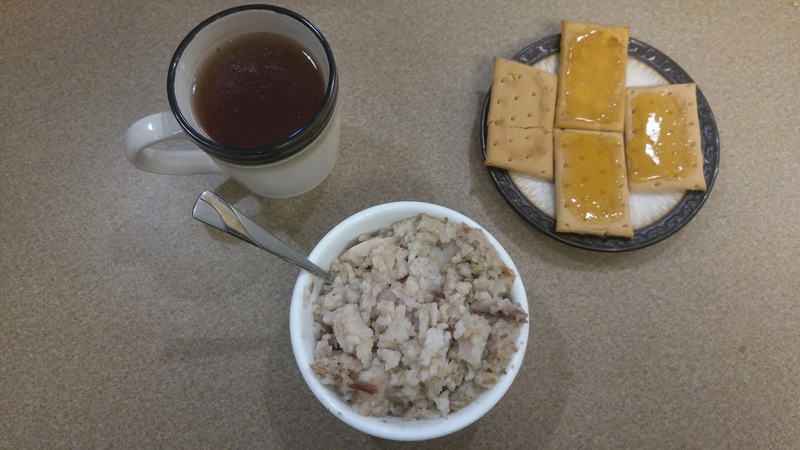 Dinner: Rice porridge with beef, crackers with honey, tea. 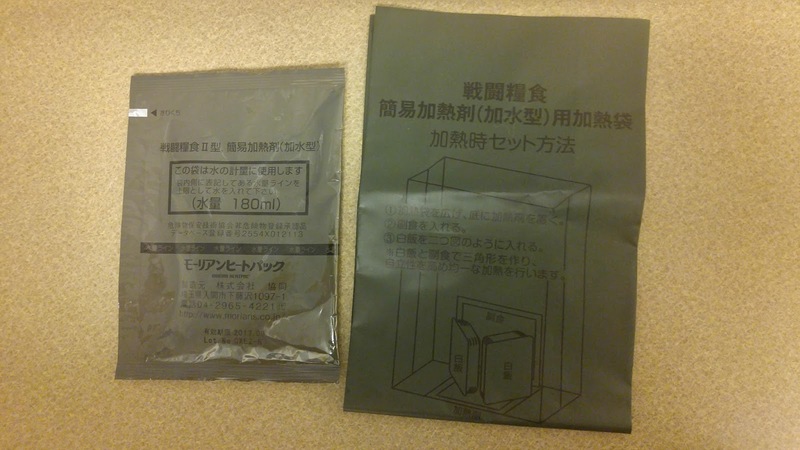 The Type 2 ration is a boil-in-the-bag type, or 'Pack-meshi'. 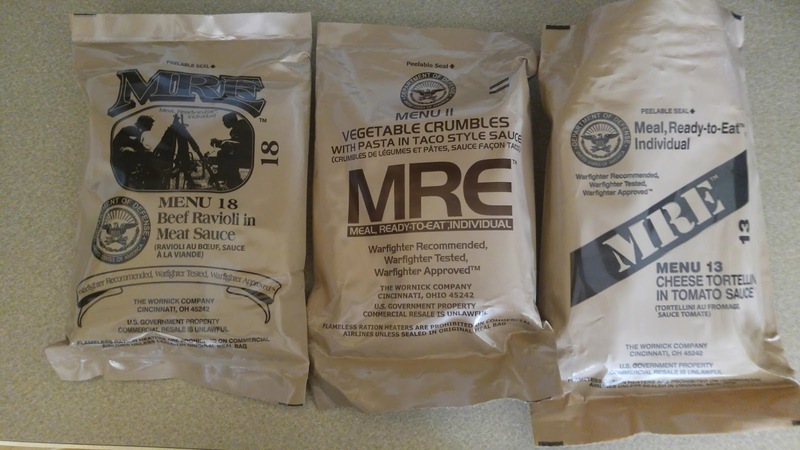 It was adopted in 1990 as an easier to carry, easier to cook alternative to the canned Type 1 rations. 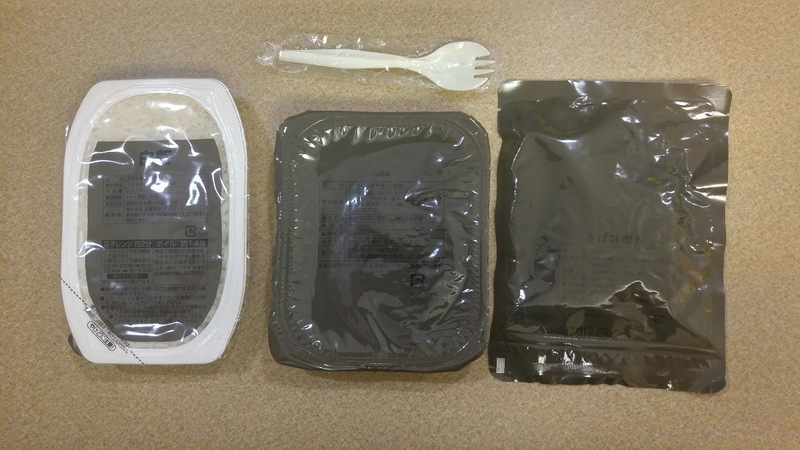 Each menu consists of two rice packs, a main entree, and occasionally side dishes such as nori (dried seaweed). 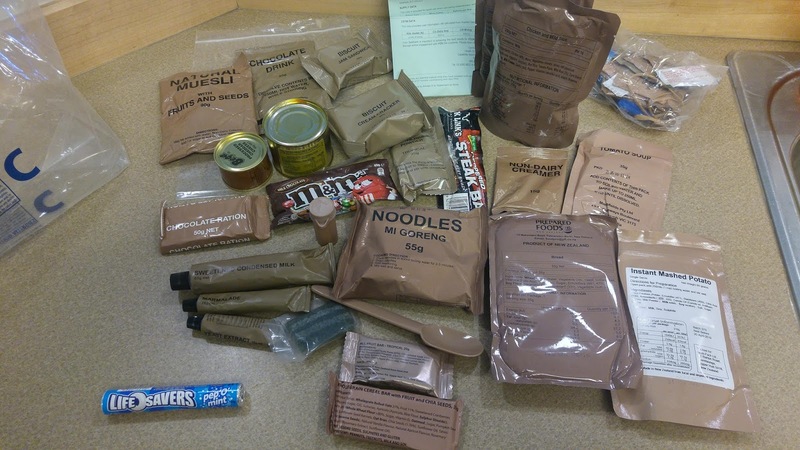 These rations are not easy to come by! 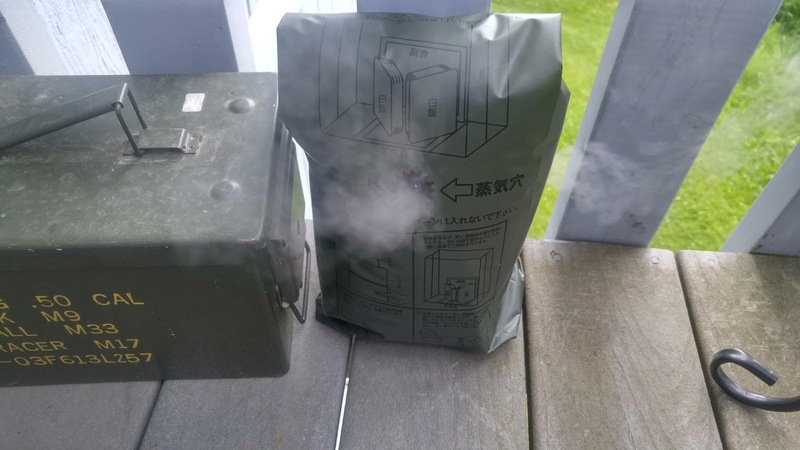 Even harder to find is the JSDF flameless ration heater! 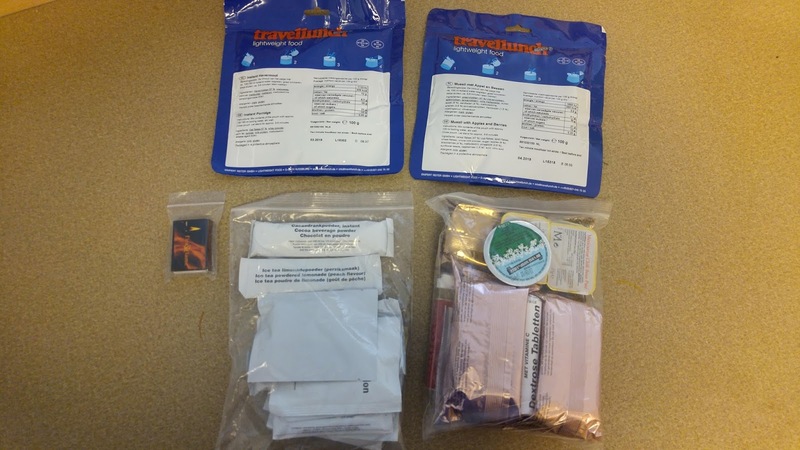 The sealed pouch on the left contains the heater pack, and the bag on the right is for heating the meal. Inside the first pouch. 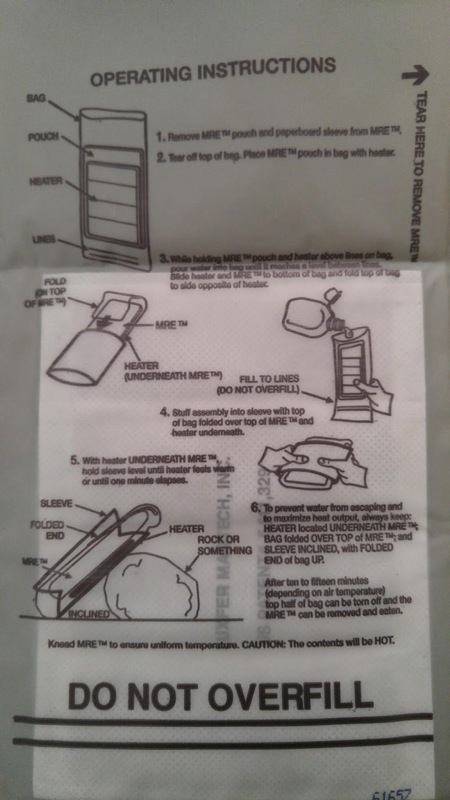 Step 1: remove heater pack and fill with water to the indicated line. 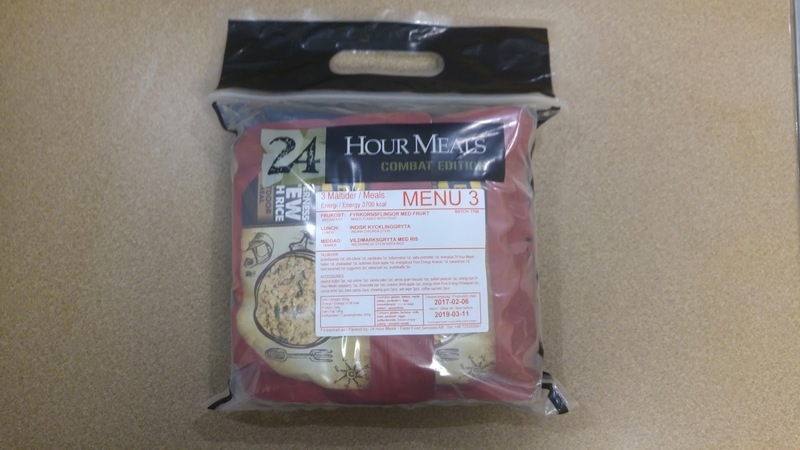 Step 2: place heater pack so that it rests against one side of the bag and place the meal items in a triangle around it. 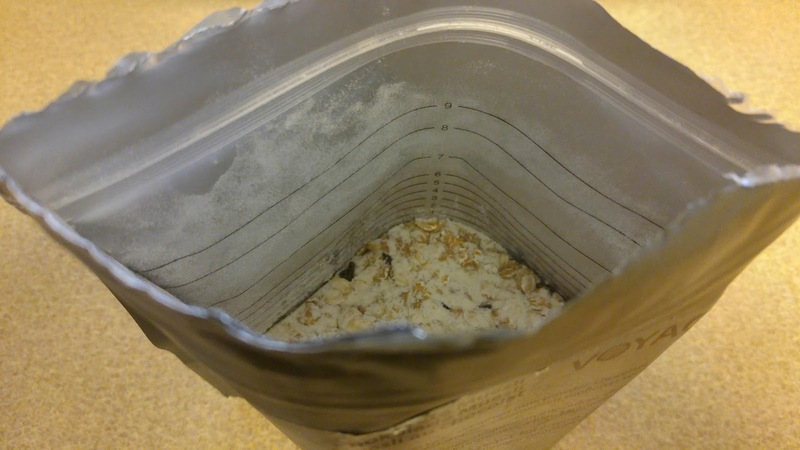 Step 3: add water, fold bag, watch the magic happen! 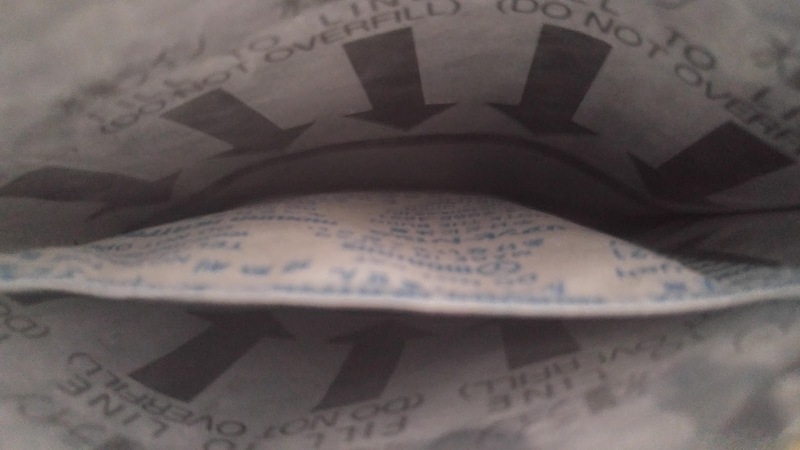 There is a convenient little steam release hole in the side of the bag, and this went on for ten minutes! 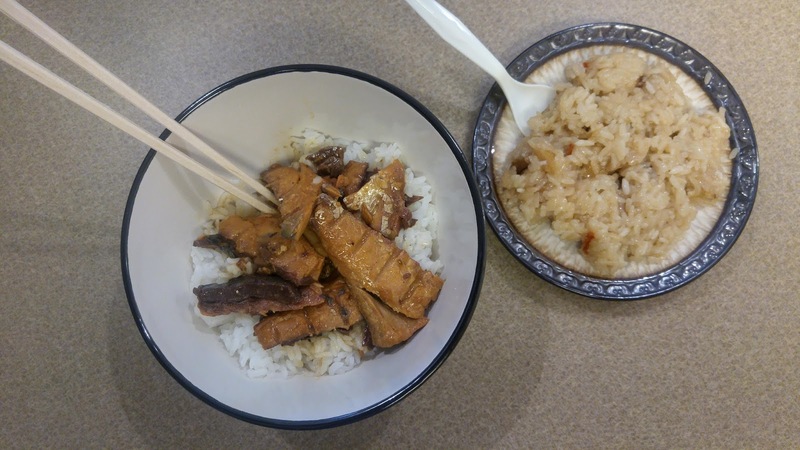 Dinner: Mackerel with miso sauce on white rice, side of wild grass rice. 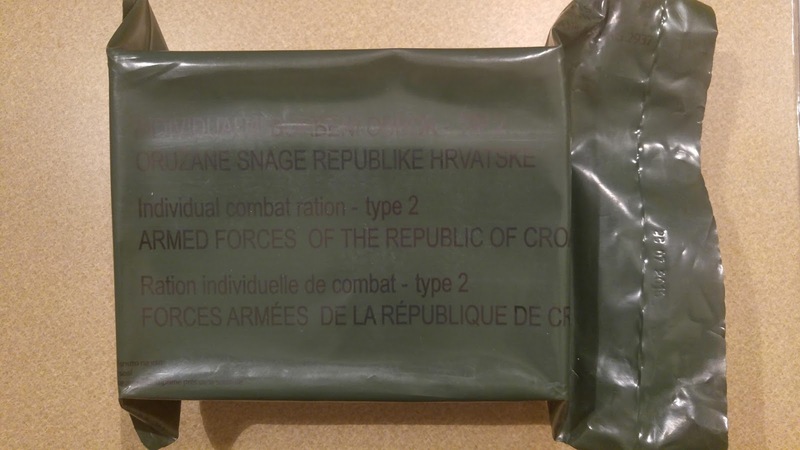 The Croatian Individual Combat Ration Type 2 is a 24-hour pack, which comes sealed in a very tough, dark green plastic pouch. 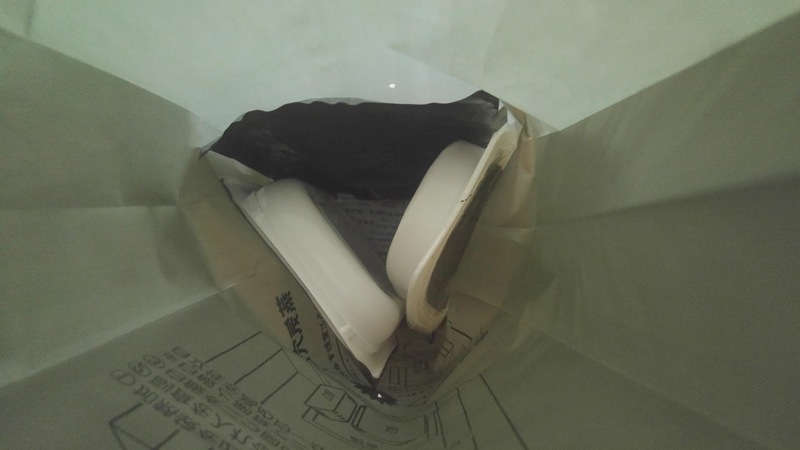 Inside, the meal items are packaged inside a cardboard box, which helps with durability. 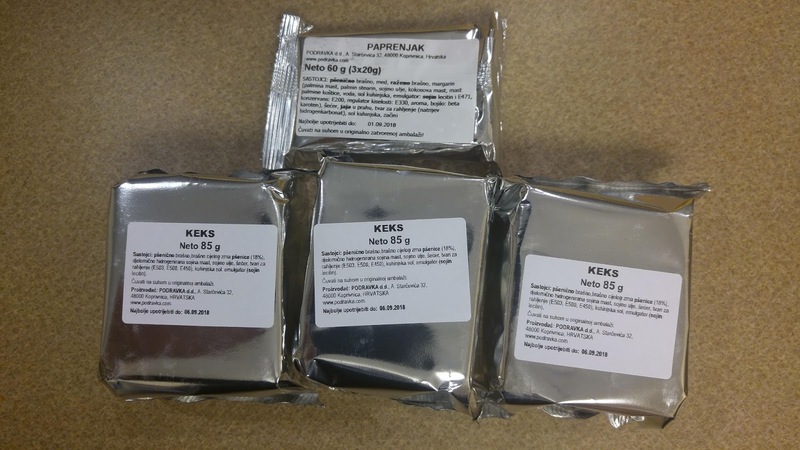 -3 packs of KEKS! SO MANY KEKS! 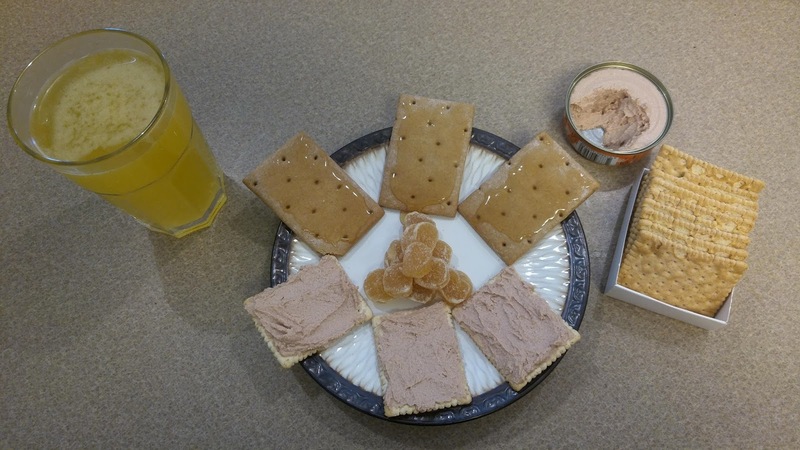 Breakfast: Plain crackers with liver pate, pepper crackers with honey, pineapple chunks, orange drink. 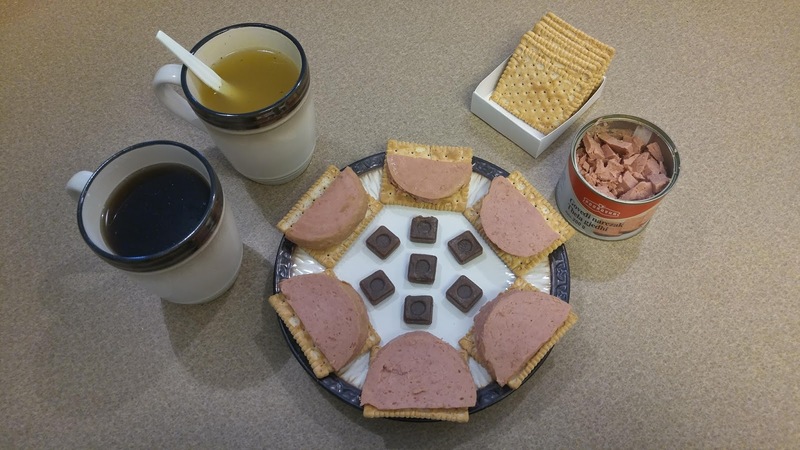 Lunch: Luncheon meat on crackers, chicken noodle soup, coffee candies, peach flavored tea. 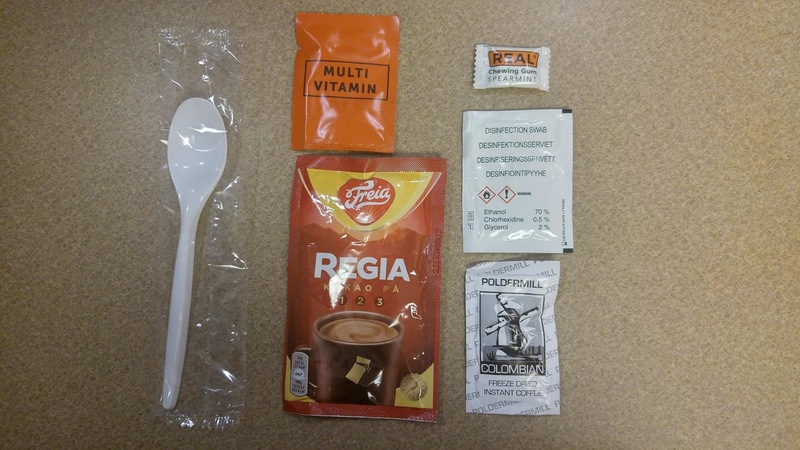 Supper: Beef goulash, crackers, dried papaya chunks, dessert chocolate, orange drink.